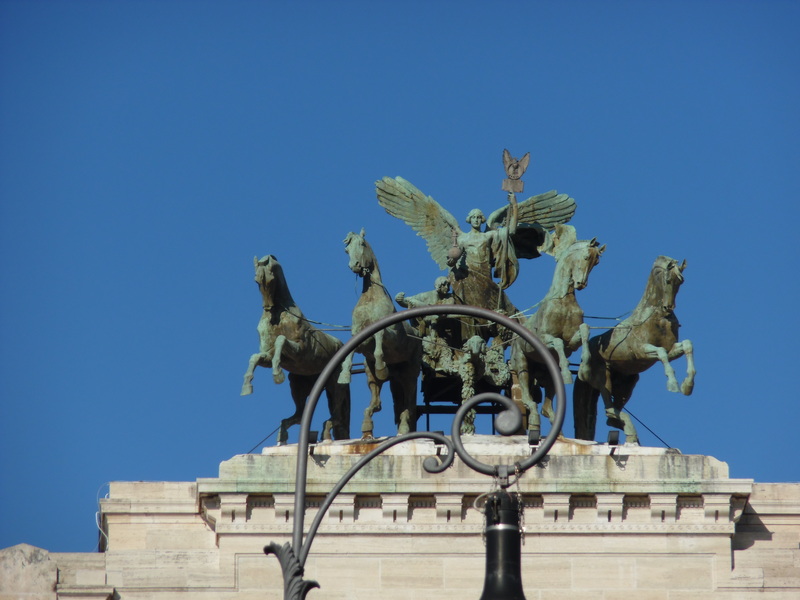 All throughout the city of Rome there are statues, and I’ve taken to noticing and taking photos of my favorite winged statues. 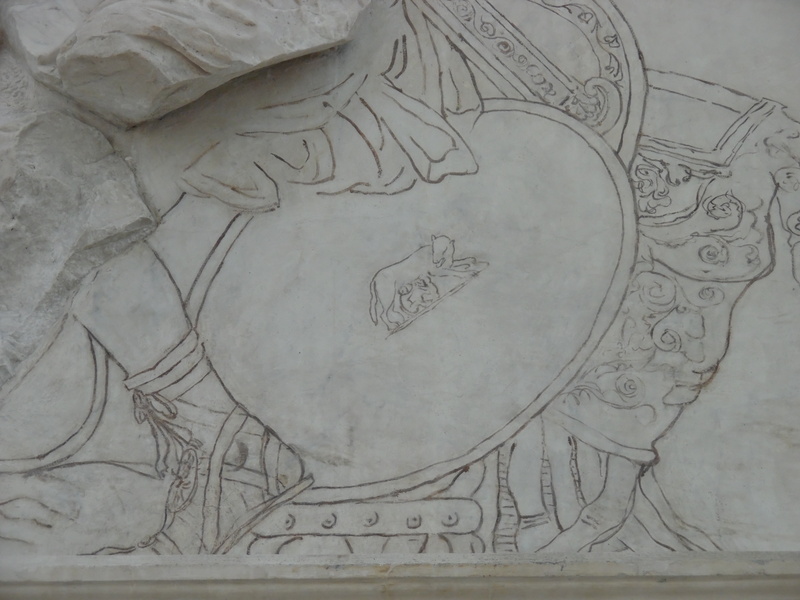 The first one below is from the top of one of the court buildings in Rome. 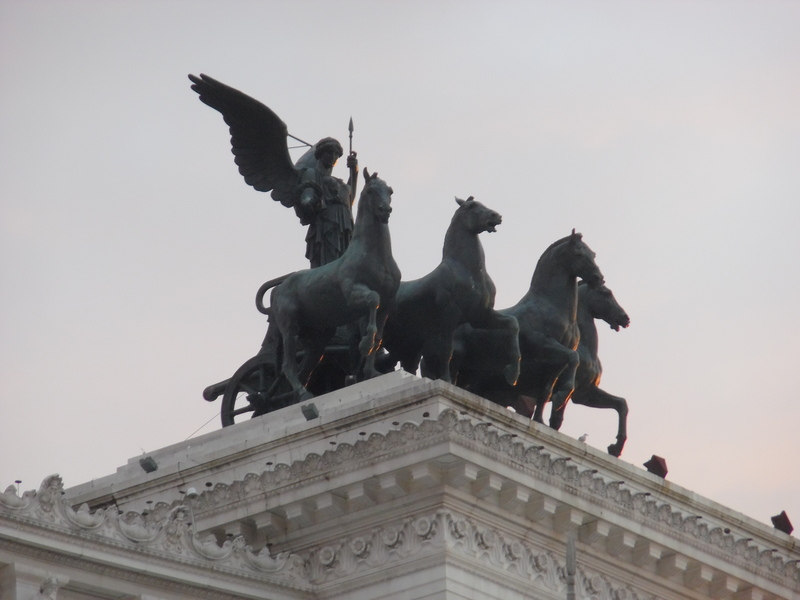 This winged figure on a chariot with 4 horses is very common in Rome, and you’ll see another one from the Ara Coelis later, and probably dates back to the Temple of Jupiter Optimus Maximus that was on the Capitoline in ancient times. 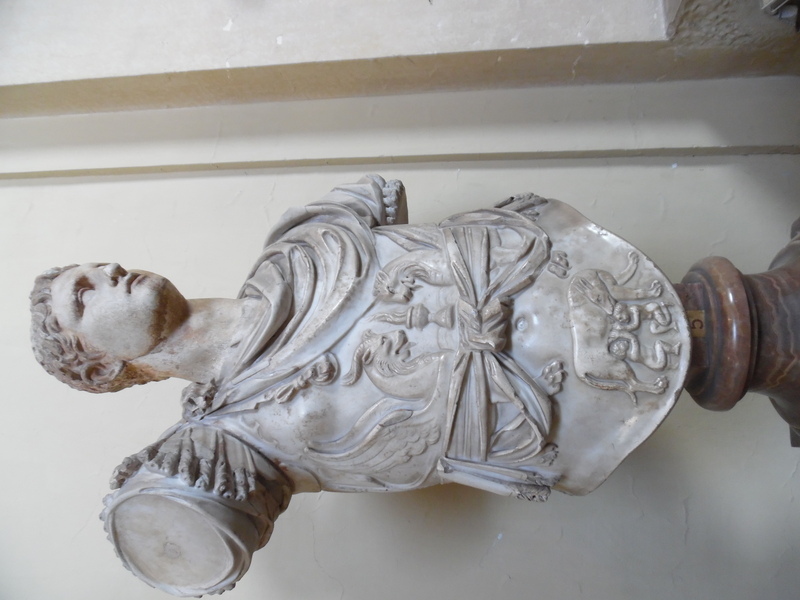 While there is no statue recovered from the temple, it is well documented that a statue similar to the one below is what was on the roof of the temple. 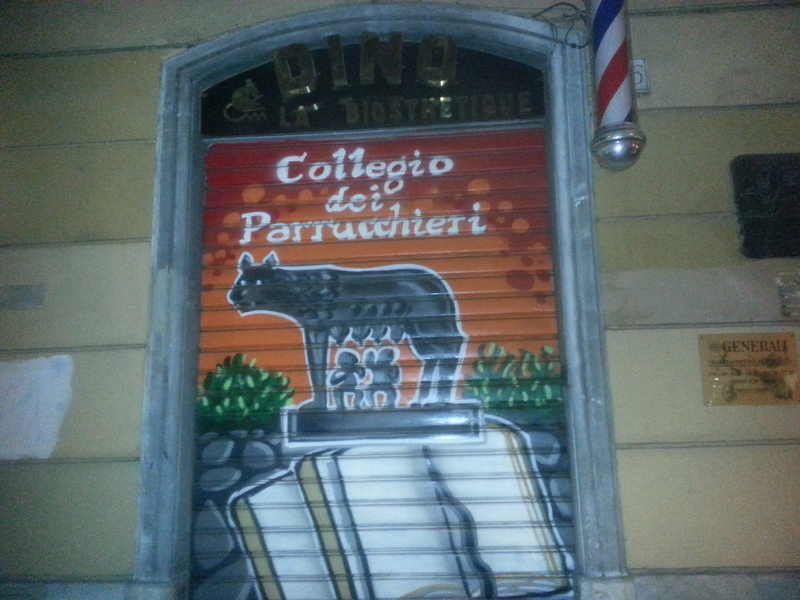 Here is the image I mentioned above of the Ara Coelis. 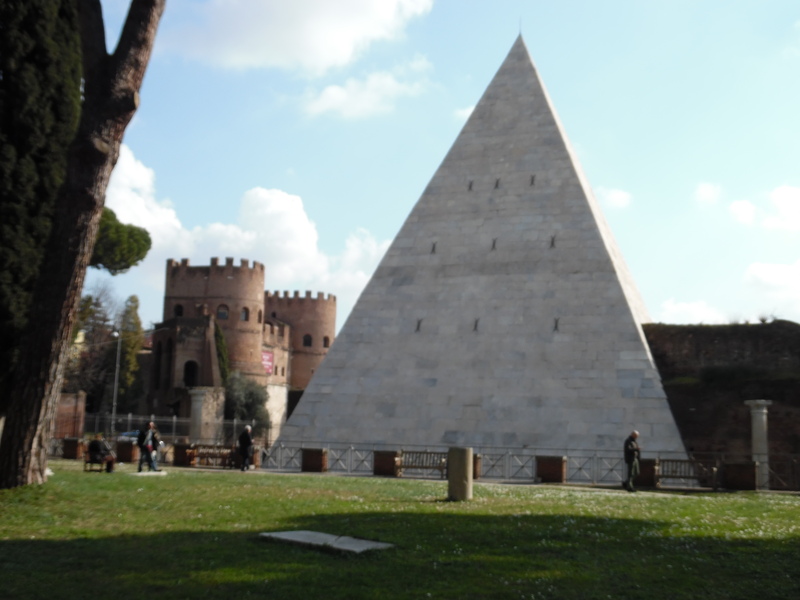 This large monument has two identical sculptures on its top, and can be seen from all around the city. 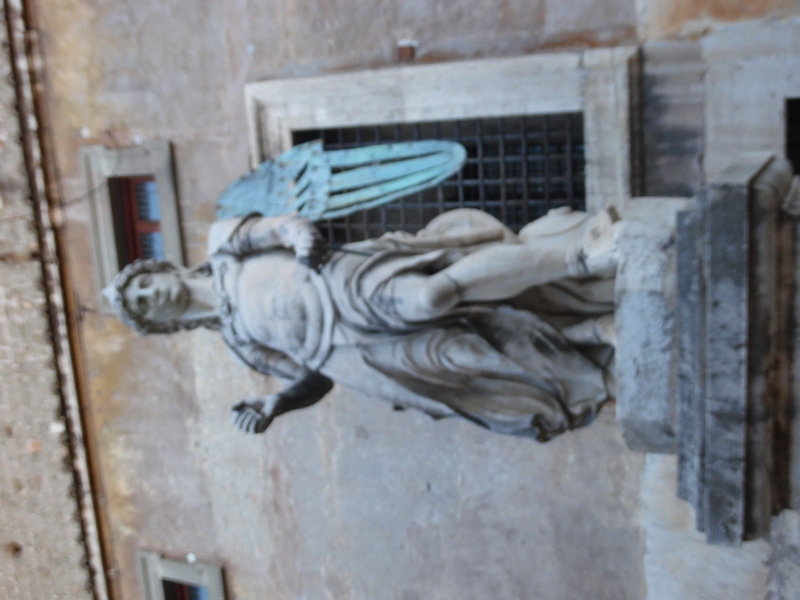 Here is another angel figure from the Ara Coelis, likely a representation of Winged Nike or Winged Victory. The next several are some of my favorites. 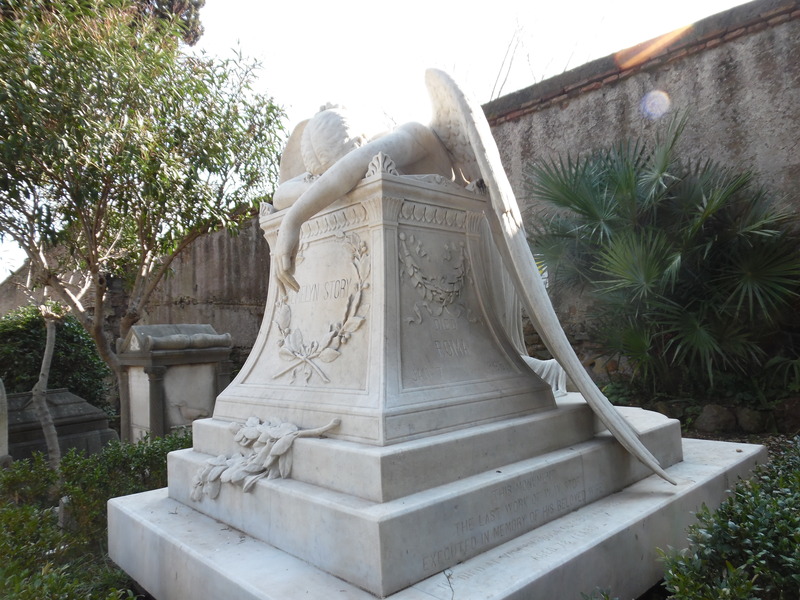 I took these pictures at the non-catholic cemetery of Rome in Testaccio. 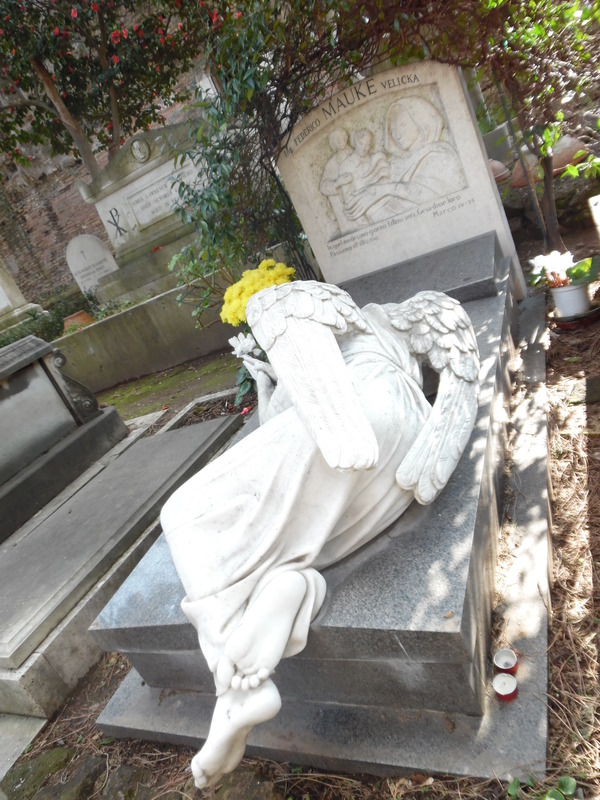 The mourning angels are my favorites of all, they just have so much emotion to them and are very compelling. 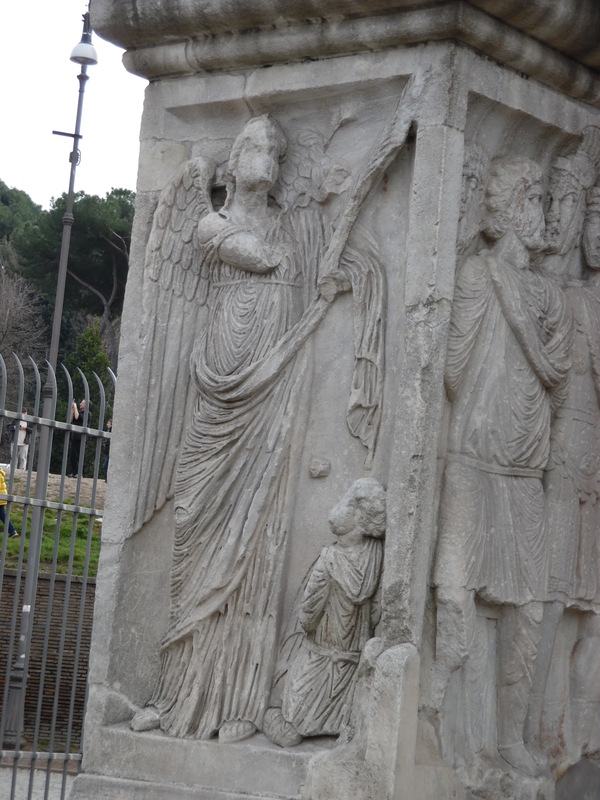 This is a relief sculpture on the Arch of Constantine with a winged figure, possibly a guide or muse, or another figure of Victory. 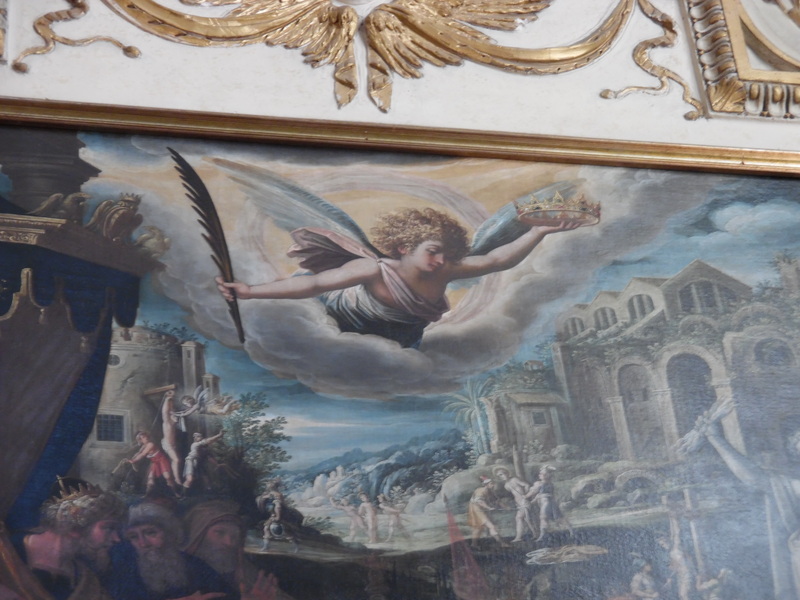 This is a section of a painting in a church in Rome. 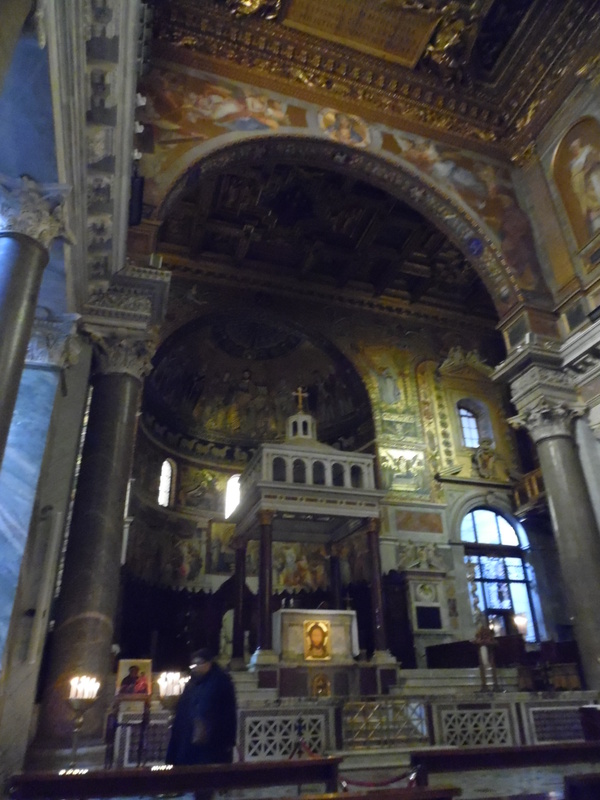 It was a church that is inside what used to be an ancient temple in the forum. 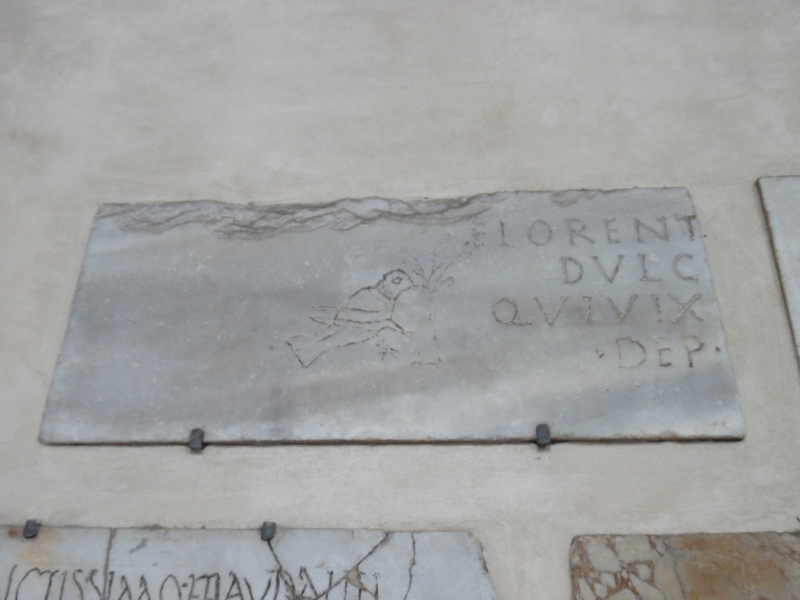 The relief below is from the Capitoline museum, and it could be a roman use of the Etruscan winged underworld guide Vanth. 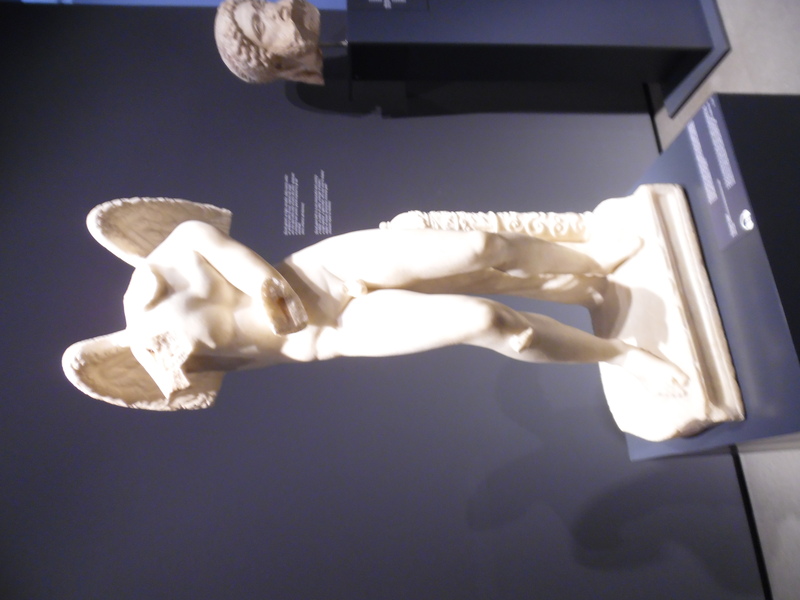 I saw this guy in the Palazzo Massimo museum and I wanted to photograph him because of his cut off wings. 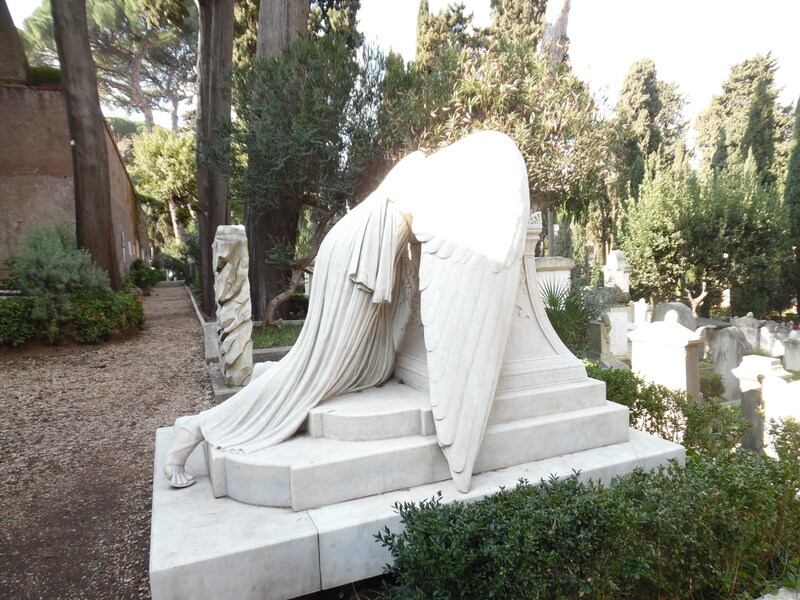 It’s sad in a way to see the statue disfigured in this way…and the missing head, but maybe I’m more used to seeing headless statues. 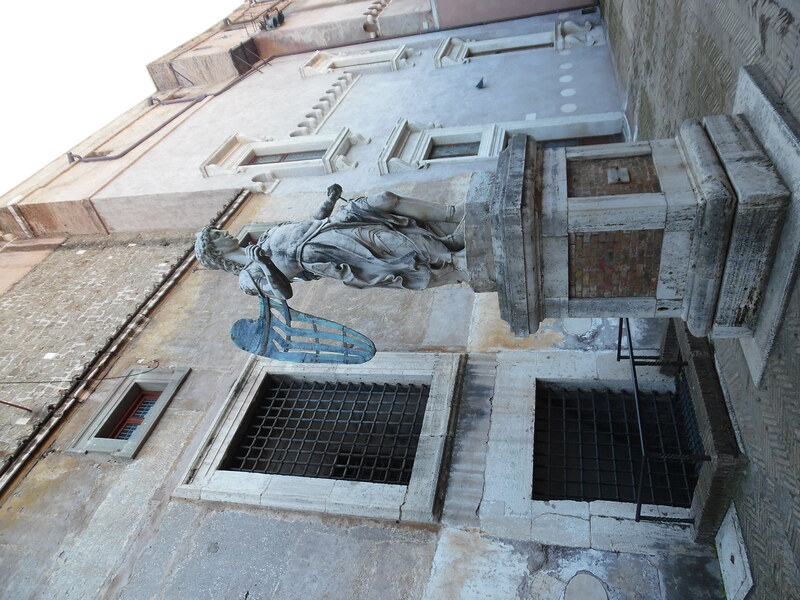 This beautiful little angel is in the entrance of the Basilica that has been built inside the ancient Baths of Diocletian. 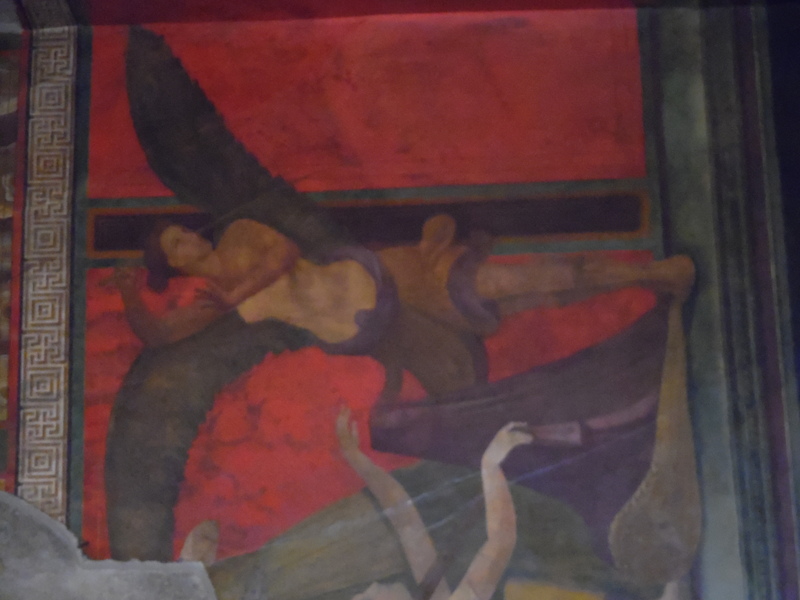 The fresco below isn’t actually in Rome, it’s from Pompeii in the recently restored Villa of the Mysteries. 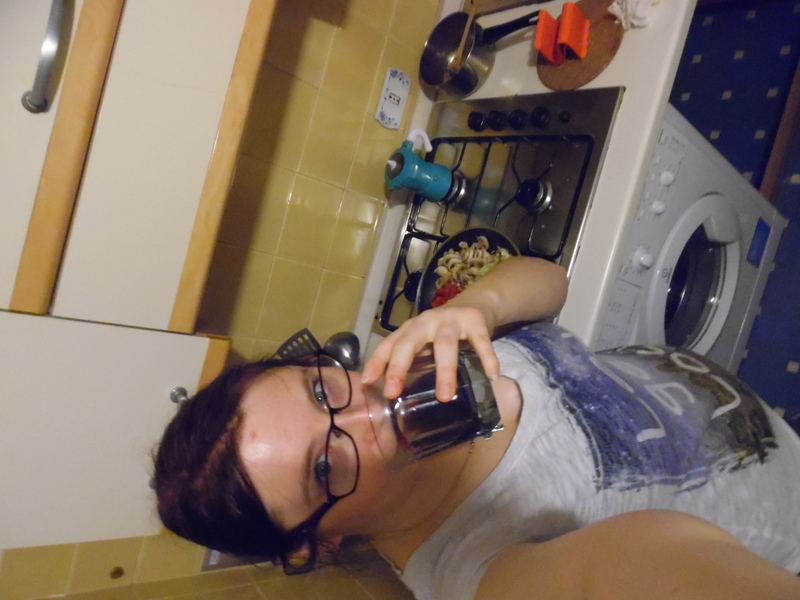 But it’s beautiful, so I decided to include it. 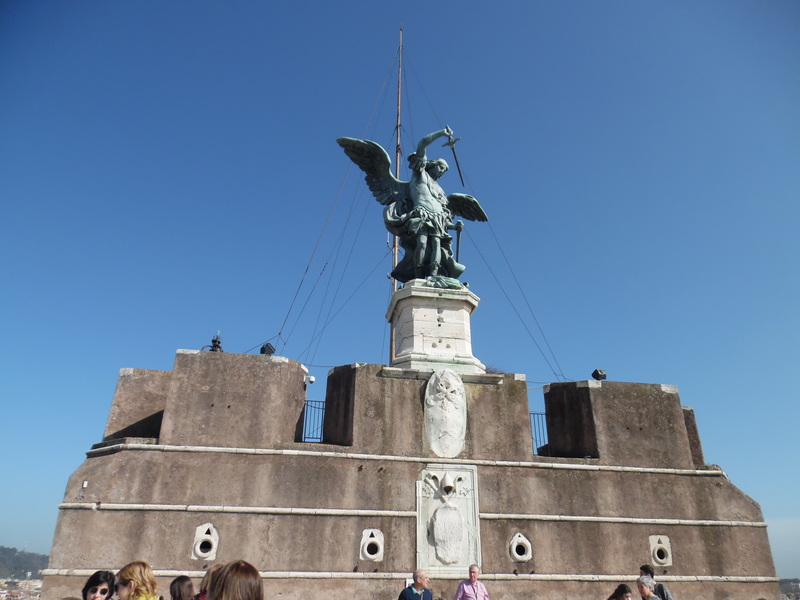 All of the rest of the images are from Castel Sant’Angelo. 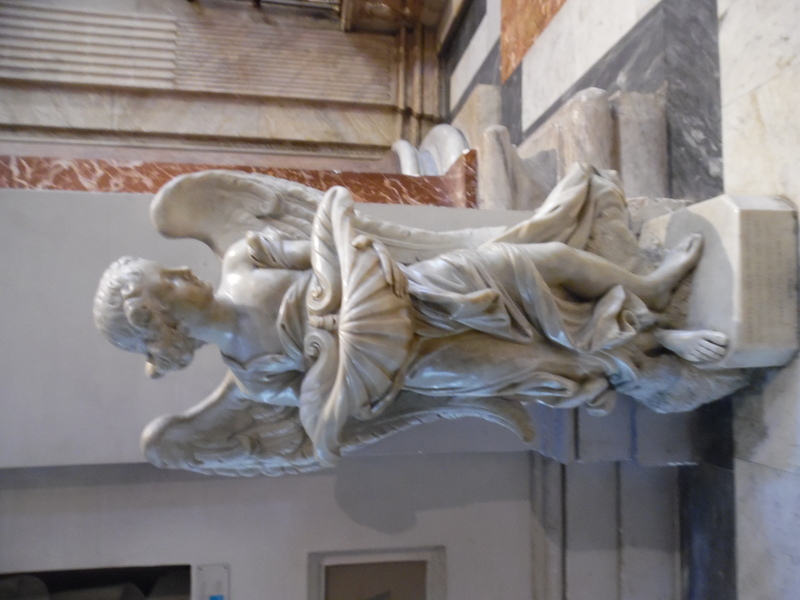 The first one is a marble statue with bronze wings. I found the different materials interesting. 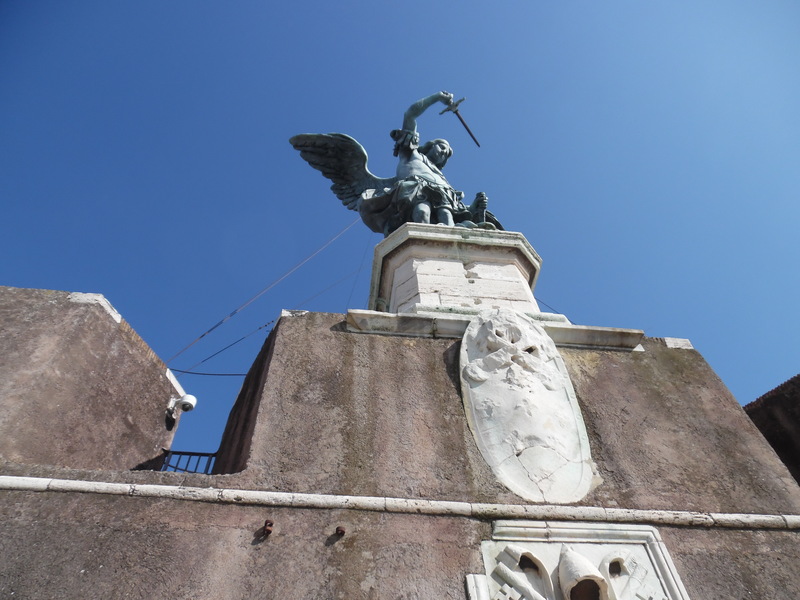 These next two pictures are of the statue at the top of the Castel. 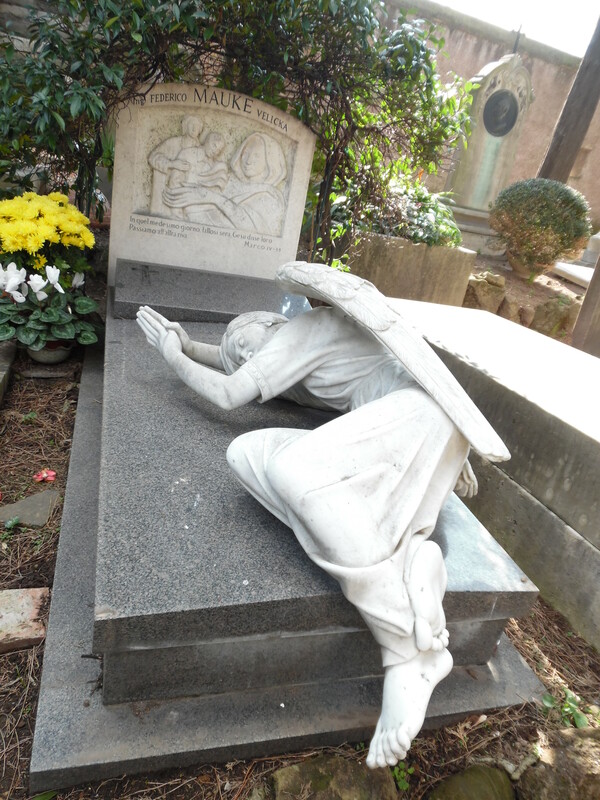 It’s a beautiful statue in bronze. 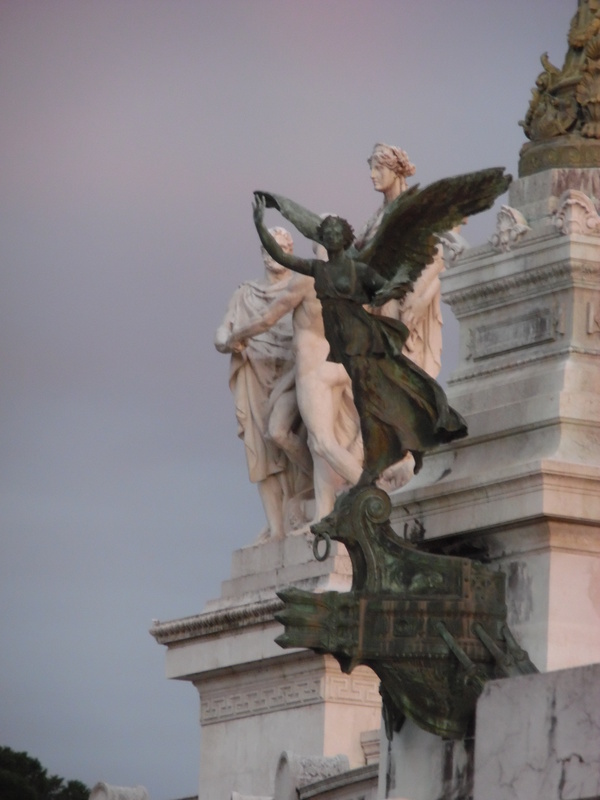 The bronze allows it to have more movement to the form without needing to worry about the supports that would be necessary with marble. 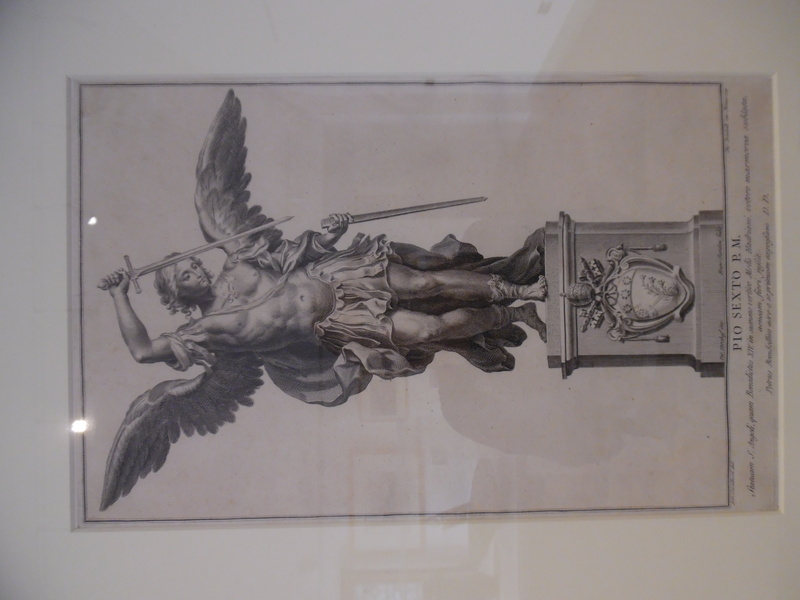 And finally here is a sketch from the museum inside of the angel. 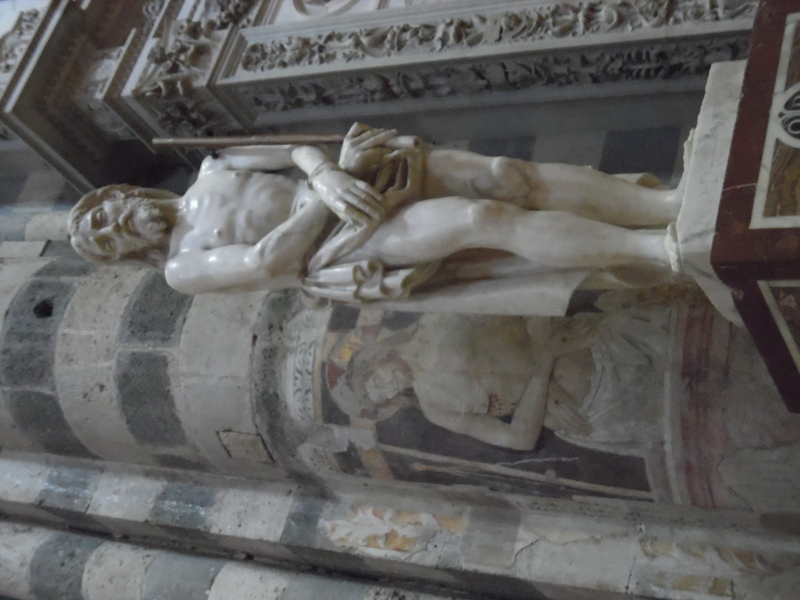 I like this because you can see the details, especially in the face, that you can’t see on the statue from a distance. 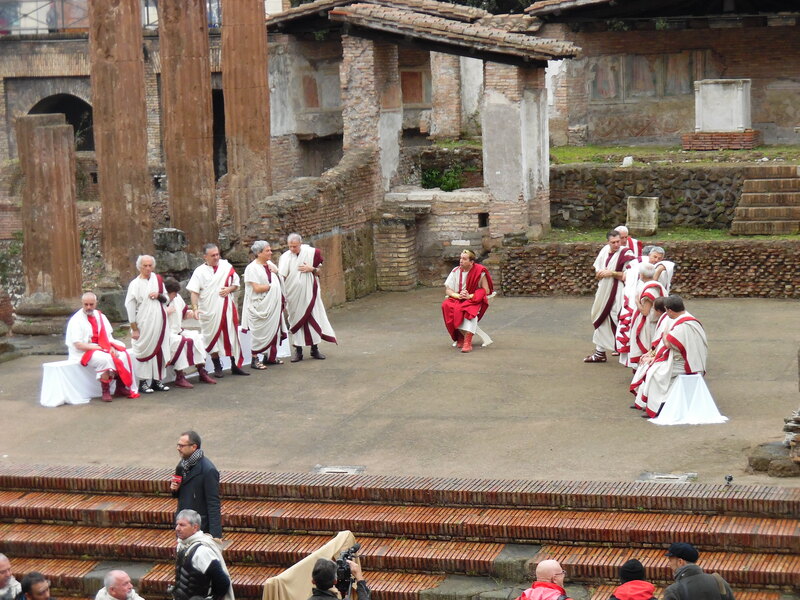 On the Ides of March( March 15th) there was a dramatic reproduction of the assassination of Julius Caesar at one of the sites in the city. 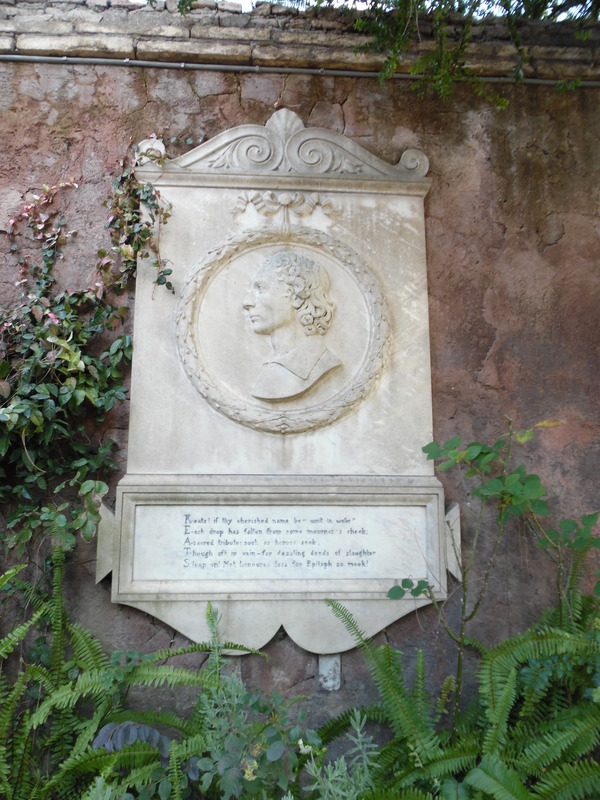 It is actually the place that archaeologists have determined he actually was murdered. It was all in Italian of course, but it was still really nice to watch. There was a huge crowd there to watch even though it was pouring rain. 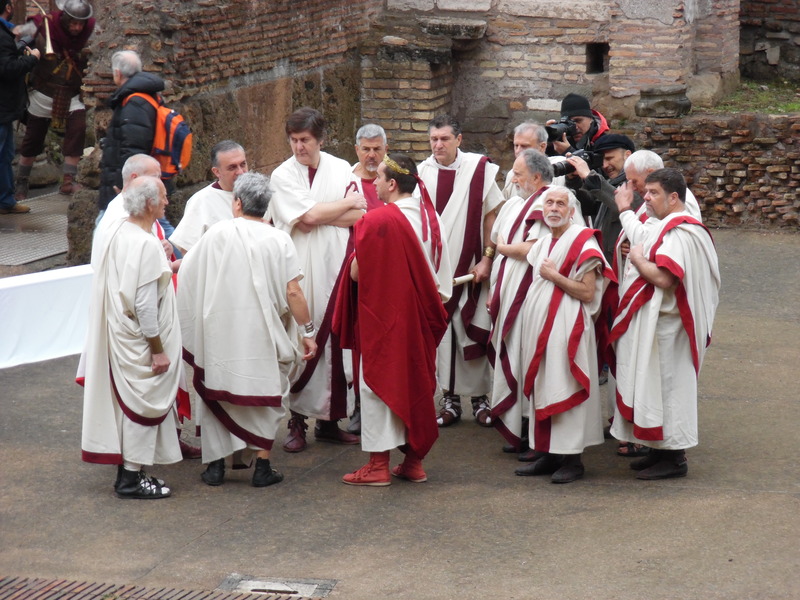 Below is a picture of Caesar and the senators having a chat before they kill him. 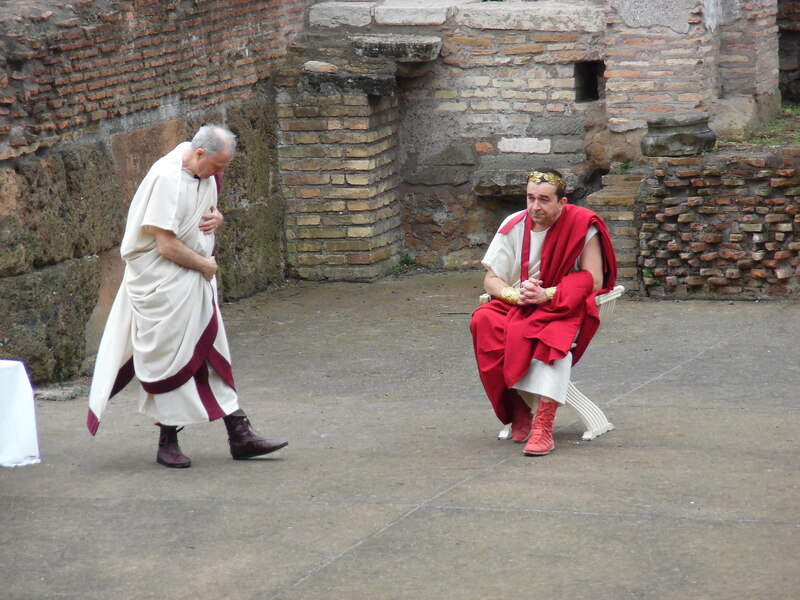 Here is a gladiator and a merchant just chilling. 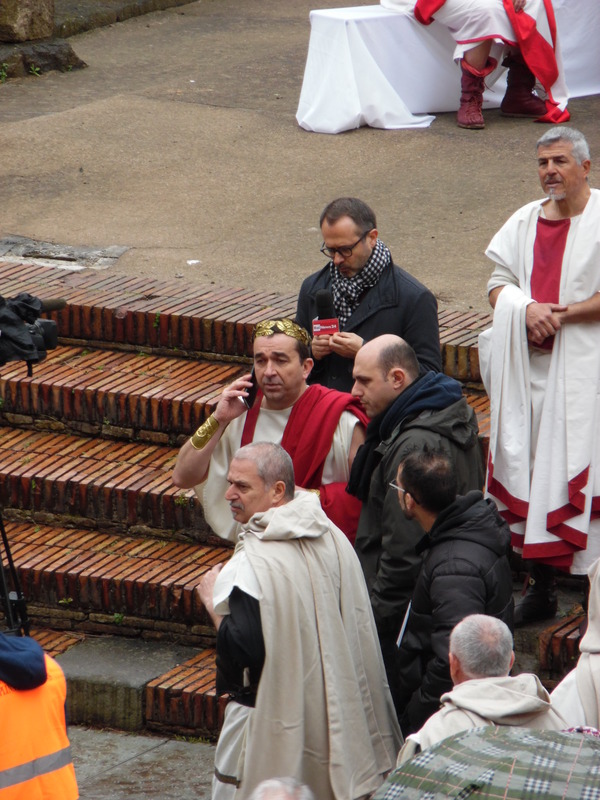 Caesar calling his wife to tell her he’ll be late for dinner….very late. 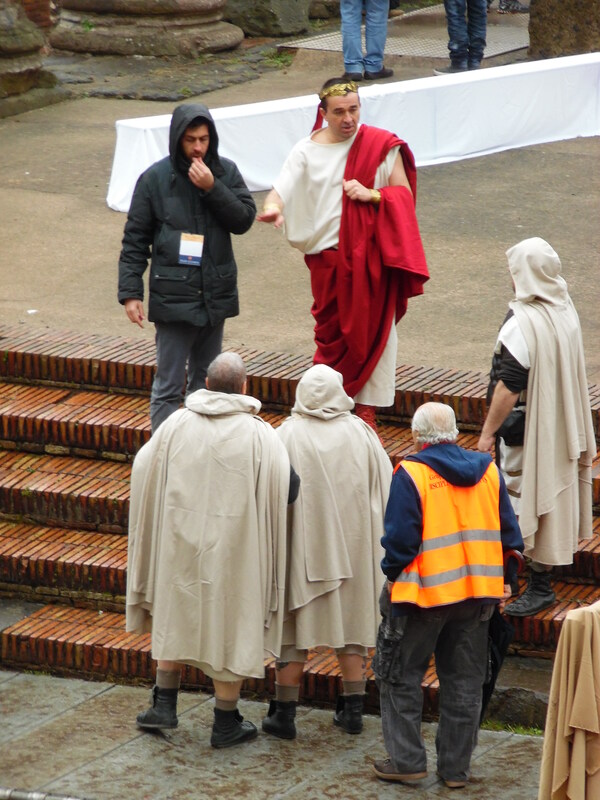 Caesar wants to make sure everything is going to go smoothly, so he’s going over the plan again. 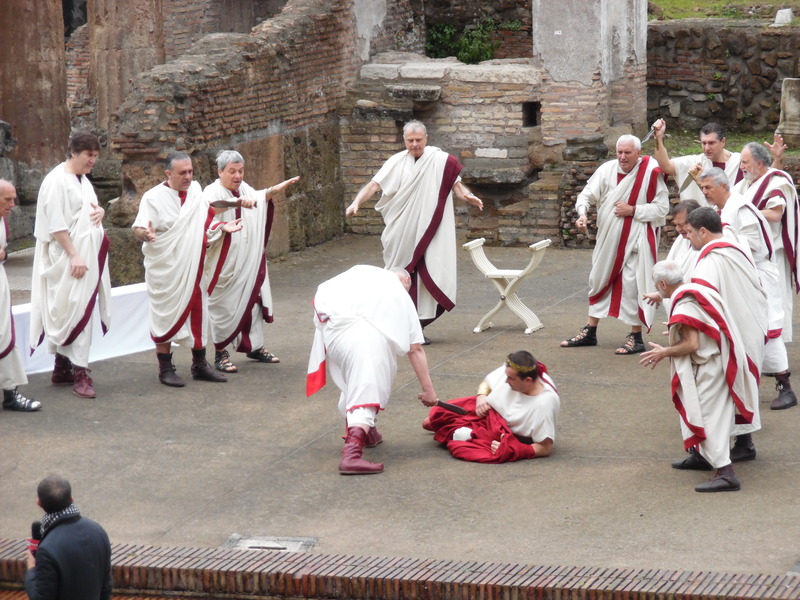 Here begin the action shots: And now Caesar is dead. 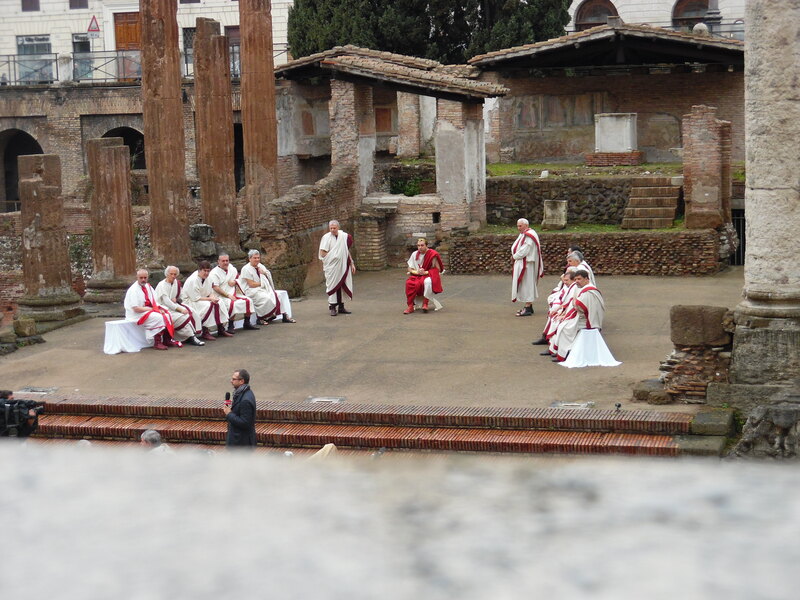 There was more after, including a speech by Marcus Antonius where he calls out the assassins and glorifies Caesar, but I could only understand a little of it. 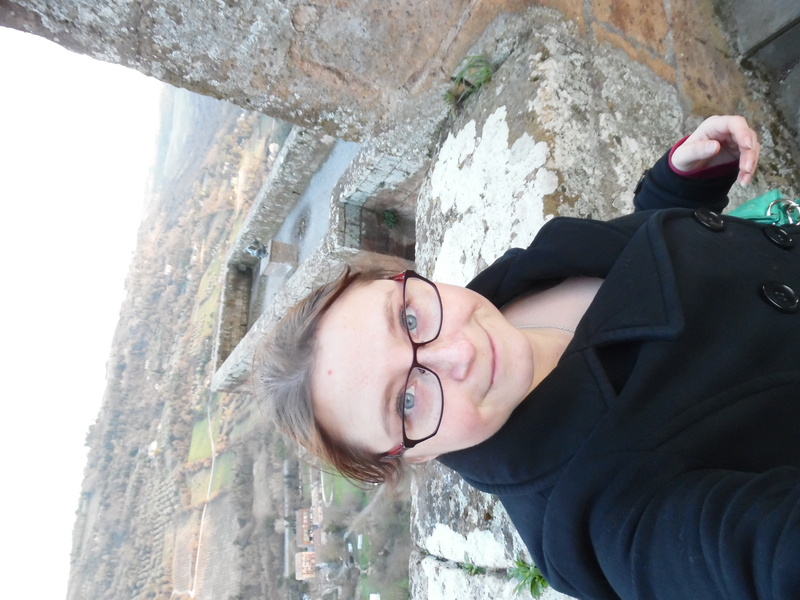 One of the day trips out of the city that I took was to Orvieto! 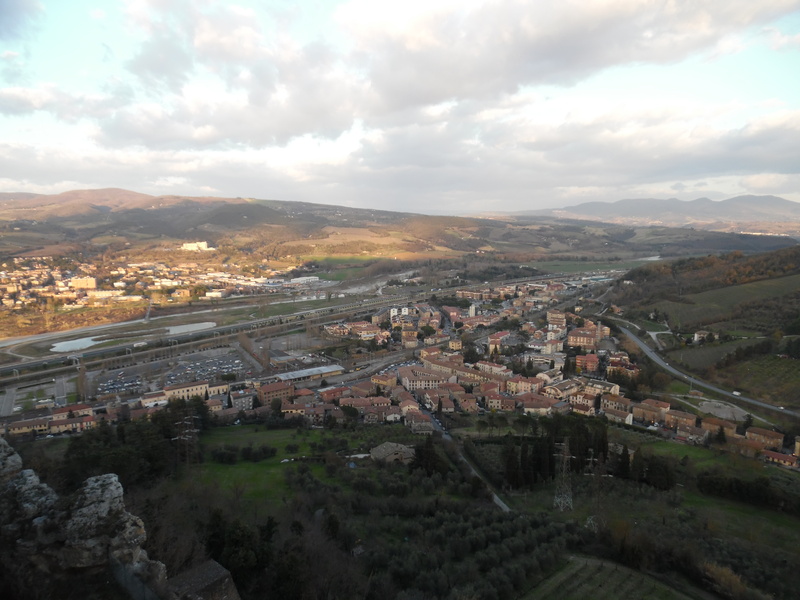 Orvieto is a small hilltop town in Tuscany, it dates back as far as Etruscan times! 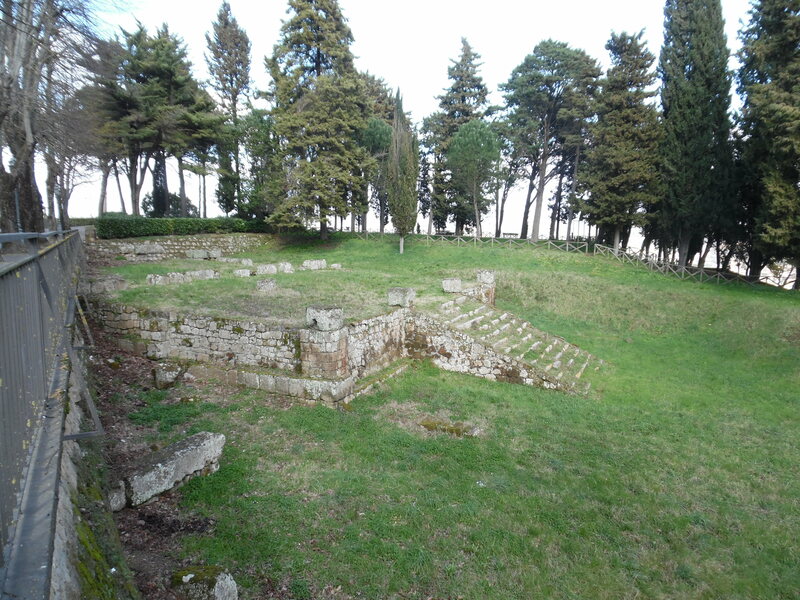 The first thing we saw there was the remains of an old Etruscan temple, the base is all that survives. 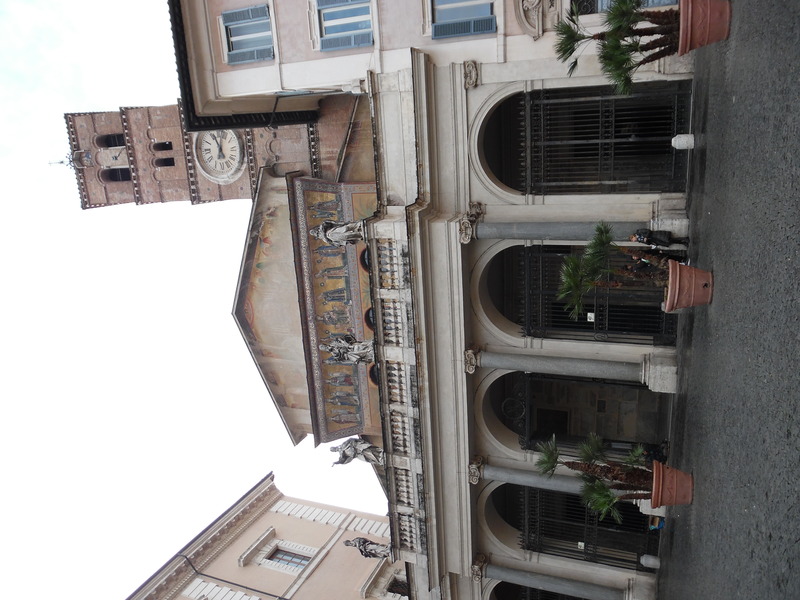 After that we walked around the city trying to find somewhere to get some lunch, we had arrived around 2pm, and I’ve found that outside of Rome the other cities tend to take Siesta much more seriously and you’re likely to find the whole city closed up for 2-3 hours. 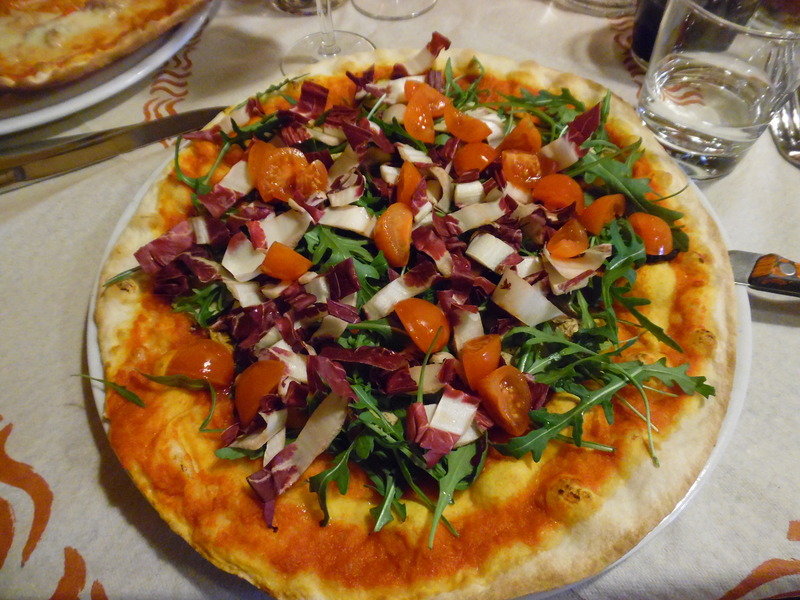 Luckily we found a nice restaurant where we got some delicious pizza! 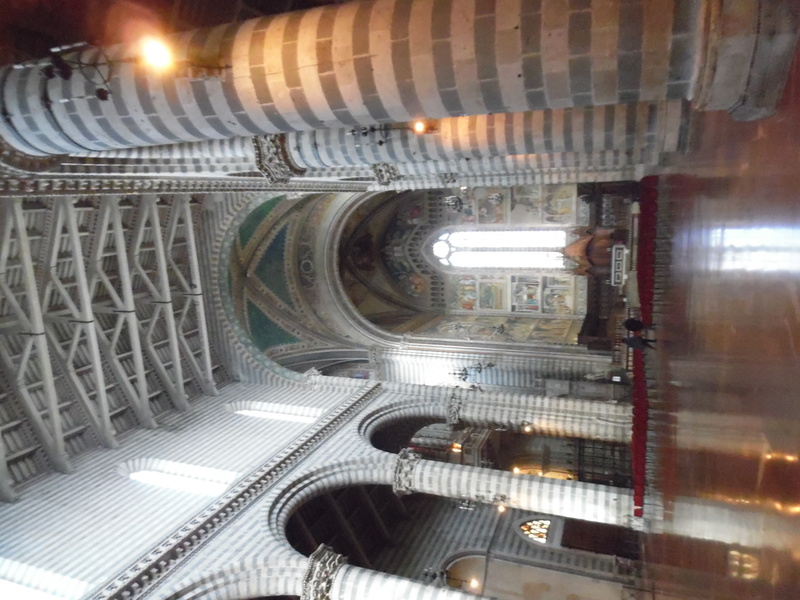 After lunch we went in search of the Duomo of Orvieto. 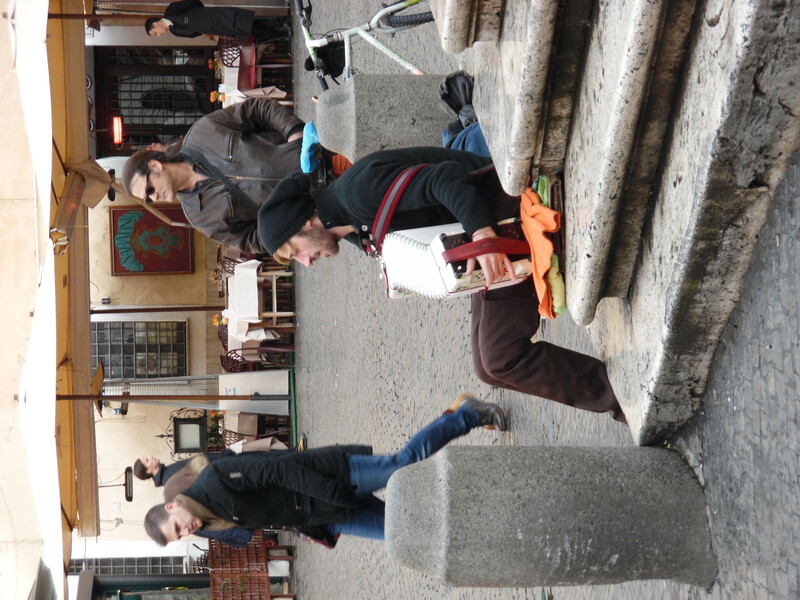 We finally found it in a beautiful, but freezing, square. 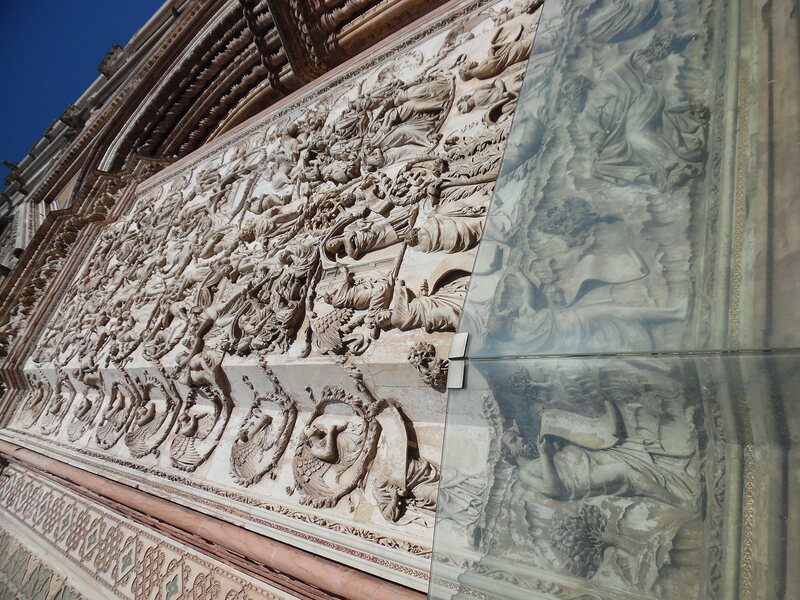 The outside of the Duomo itself is absolutely beautiful! 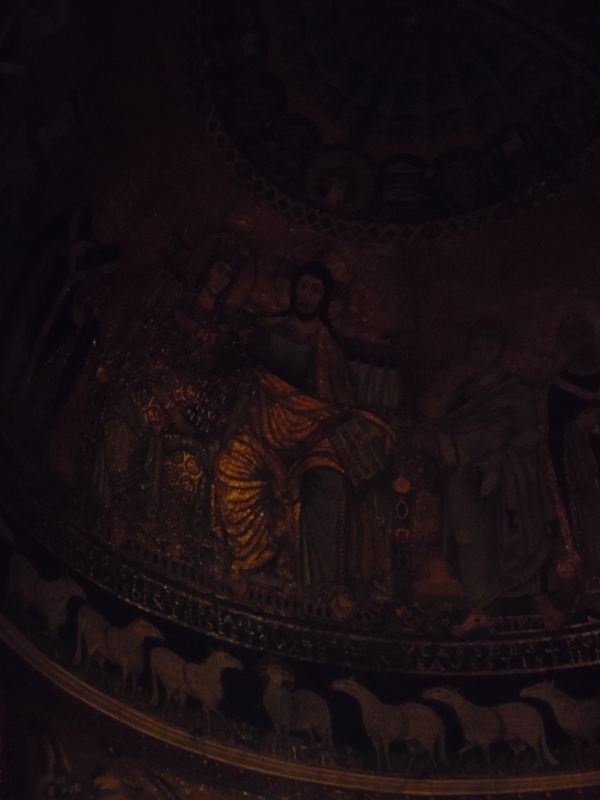 Below I have an overall shot of the church as well as a close up of some mosaic work and relief sculpture. 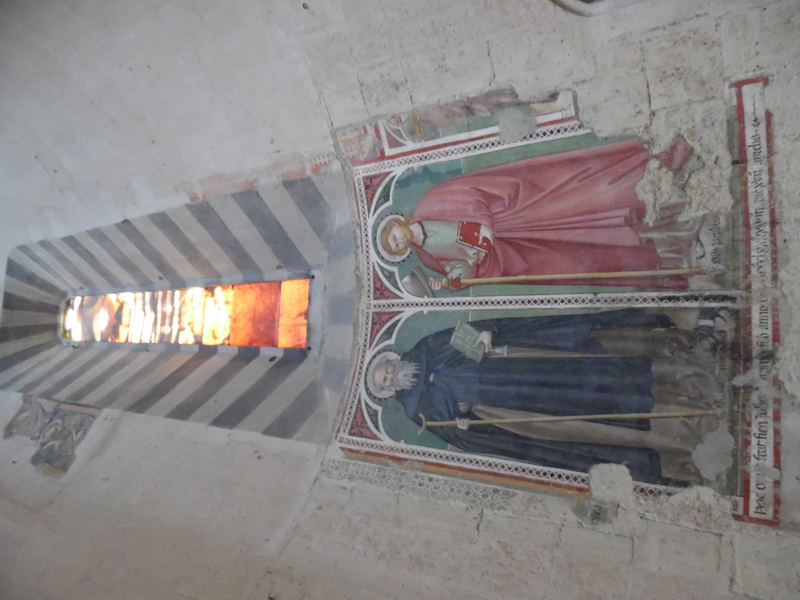 Inside the church are pillar columns and old frescoes, in various degrees of state. 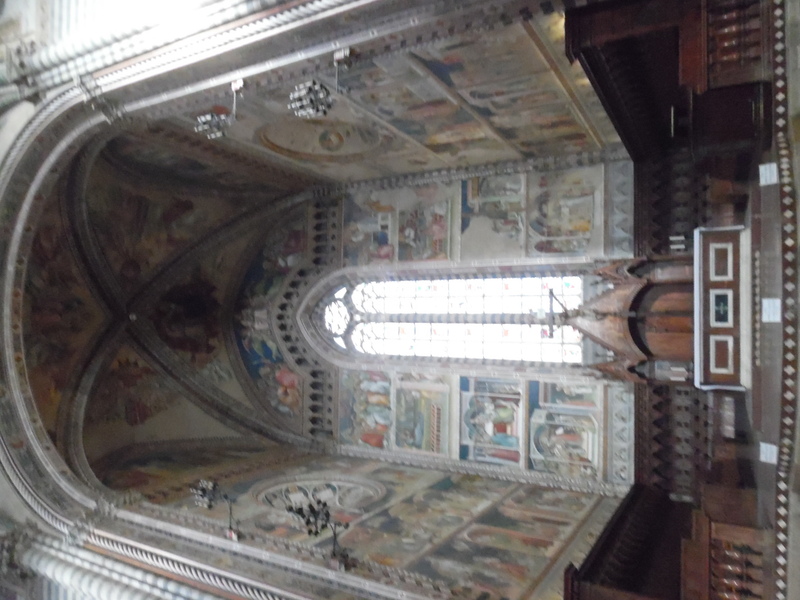 The painting in the nave is the best kept fresco in the main area of the church, and there was a gigantic organ. 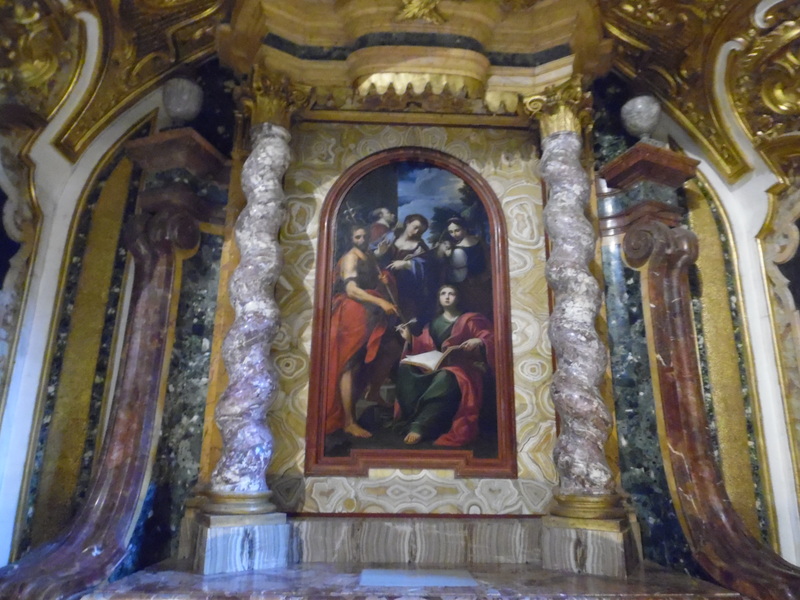 Below is one of my favorite pictures from the church because I really like he statue of Christ in front of the fresco with the same position. 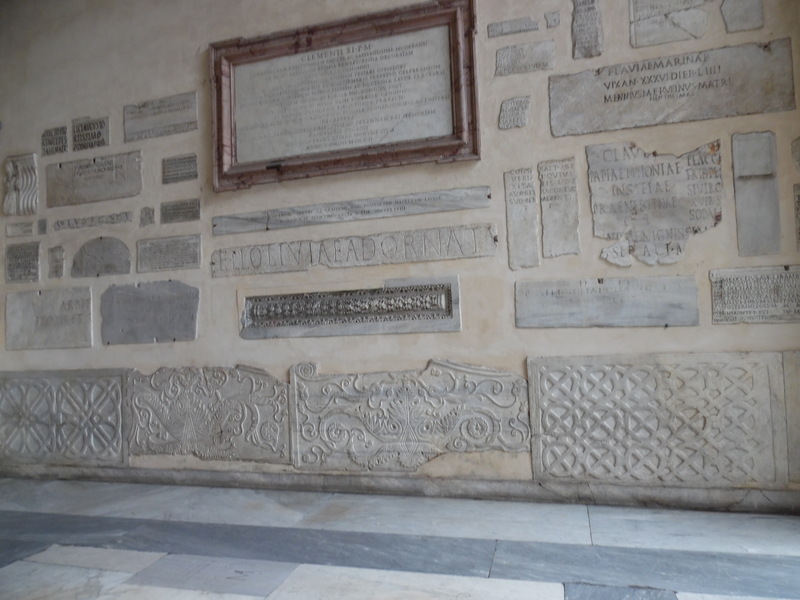 To one side of the nave there was a beautifully decorated little chapel. 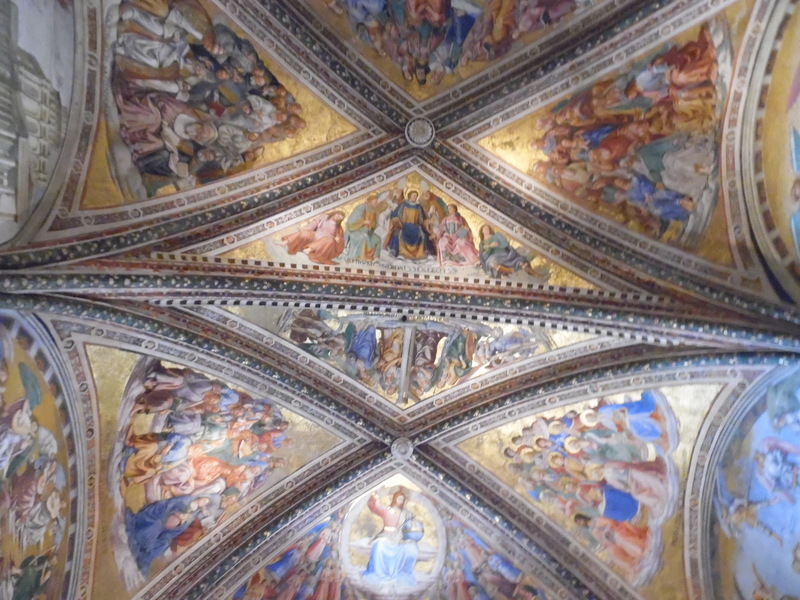 The ceiling and walls were covered in beautifully colorful frescos that are in perfect repair. 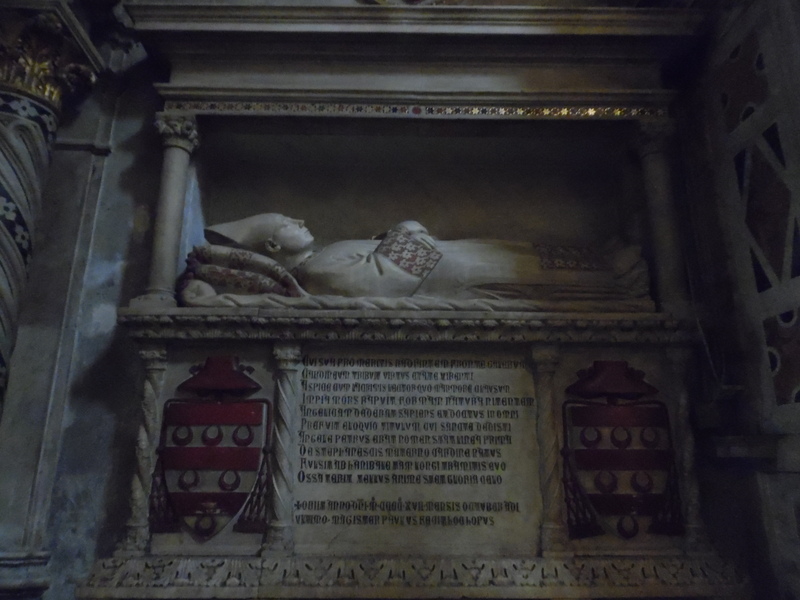 This is a large reliquary? 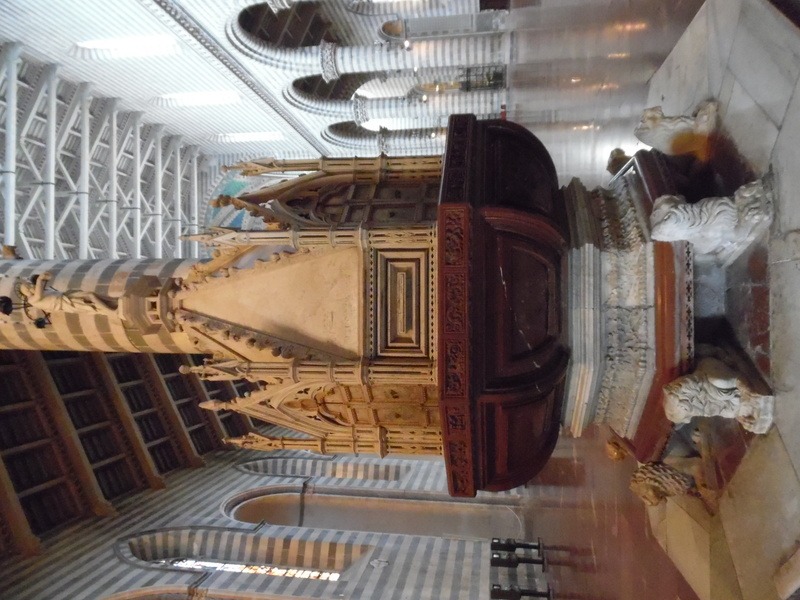 that was in the church that was very large and well sculpted. 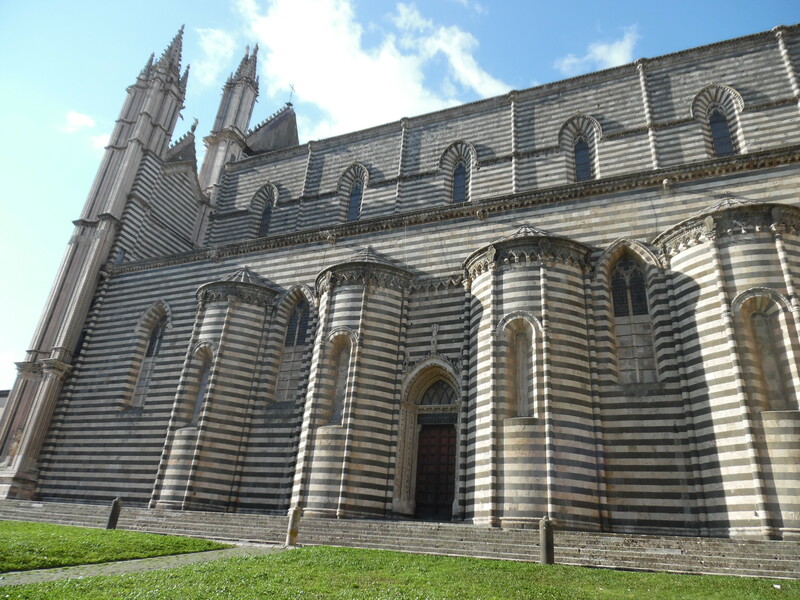 Then there is a picture of the side view of the exterior of the church, the whole thing is made of this zebra striping of black and white stone. 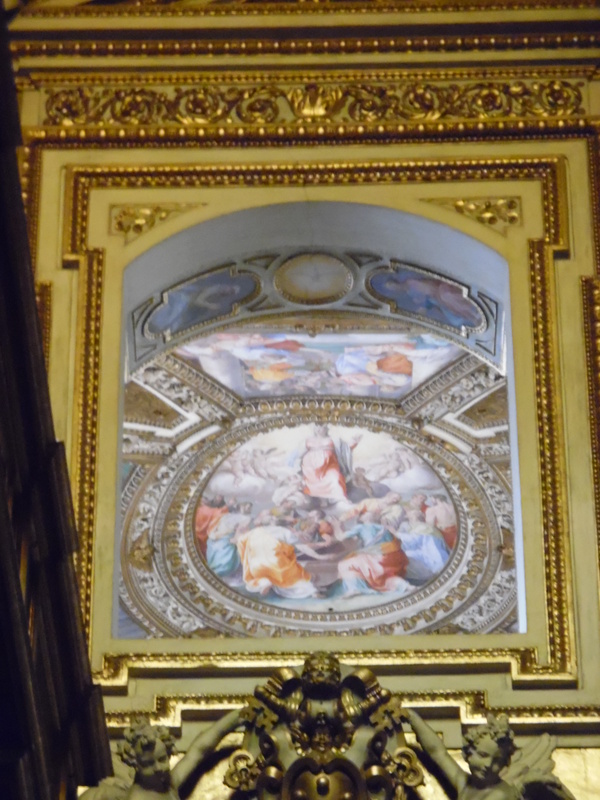 It was done because both types of stone were difficult to get and so having it designed like this showed that it was an expensively built church. 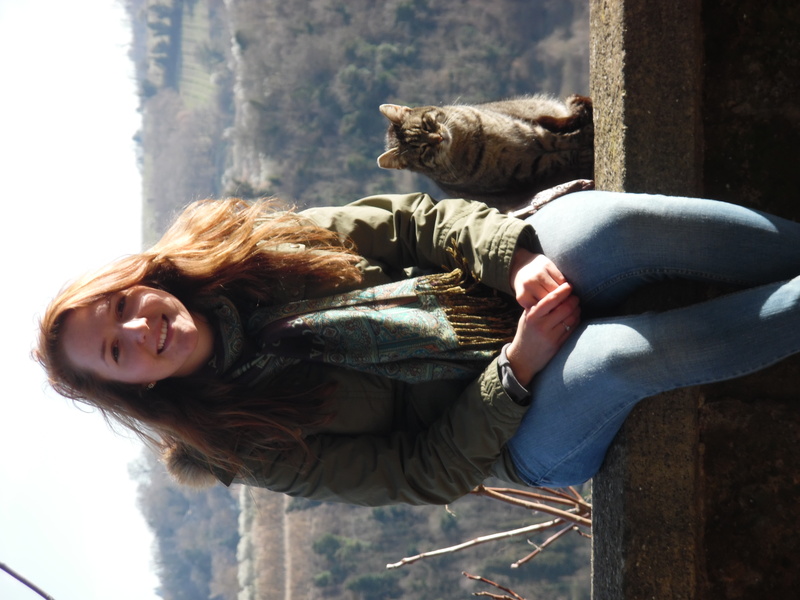 And then we found cats! 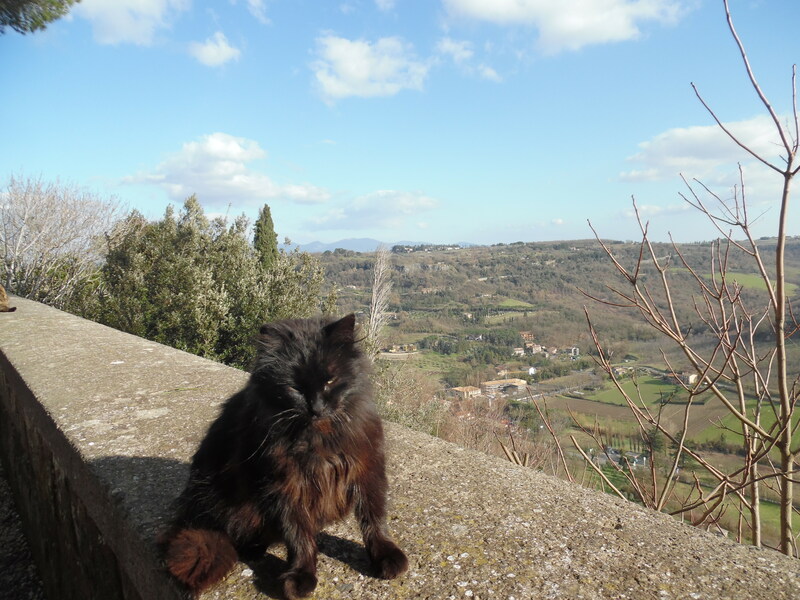 The cats of Italy just seem to flock to me! 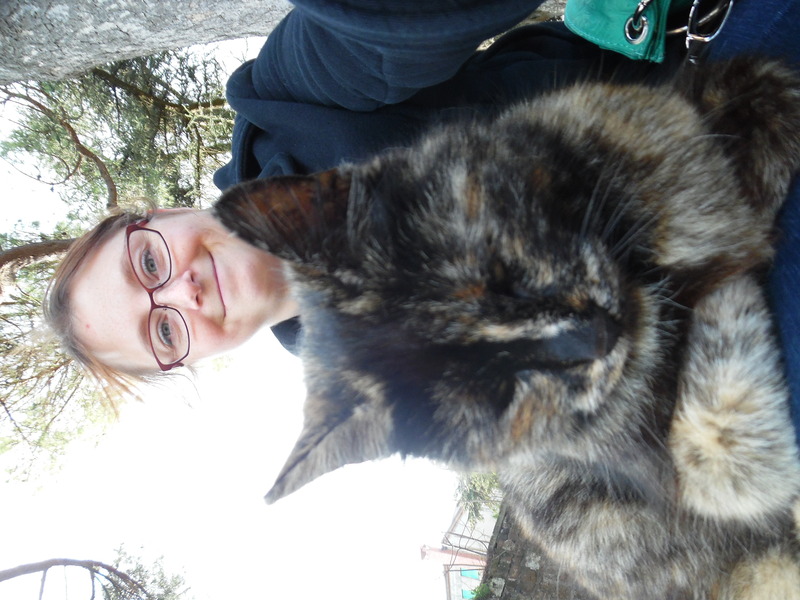 I have never found so many sweet cats! The little one below we named Scruffy. I didn’t name this guy, but he was a sweetie. 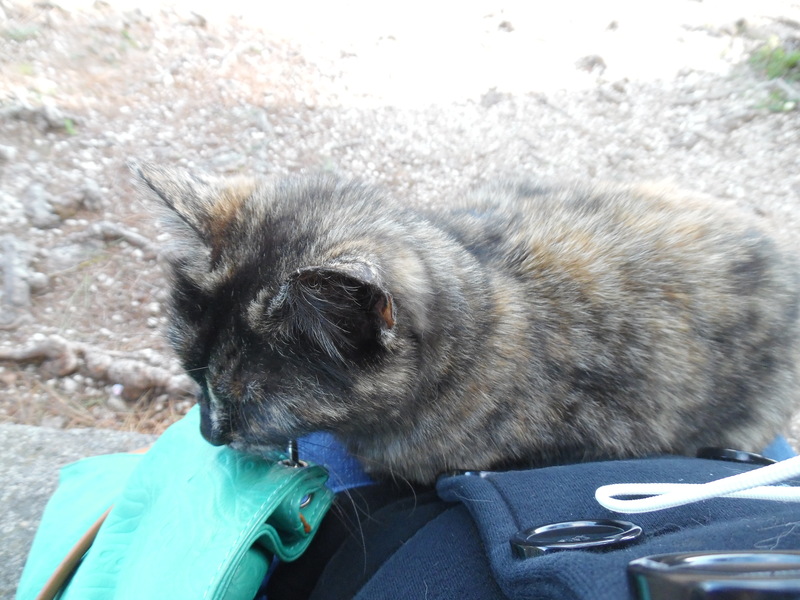 Eventually the masses of the cats bombarded us all, the many cats all wanting attention. 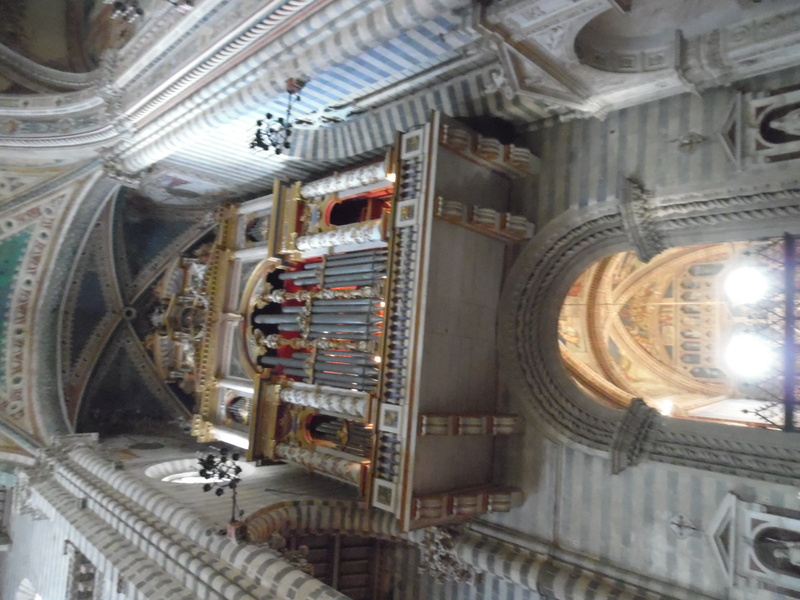 After seeing the cats we went down into the underground city of Orvieto, which I don’t have any pictures of, but should not be missed on a trip to Orvieto. 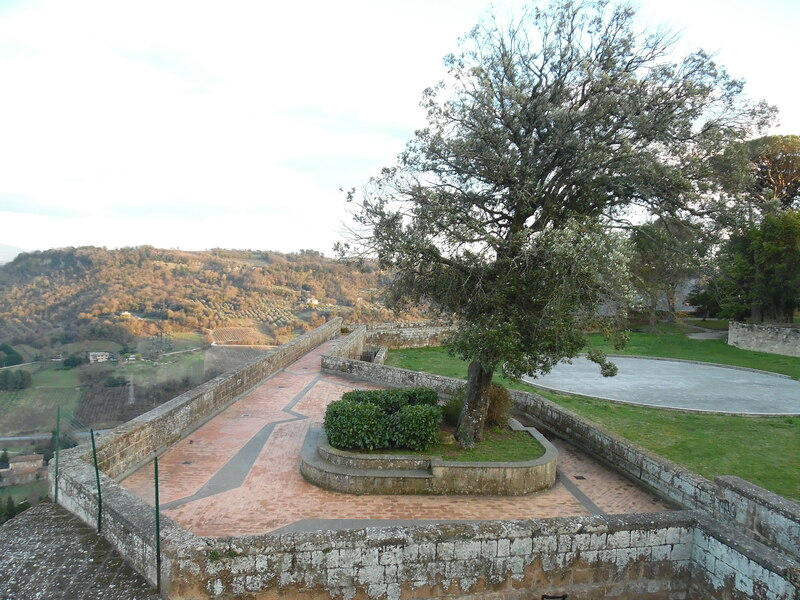 While waiting for a bus down the mountain we found this park inside an old fortress and we got some amazing pictures of the view. 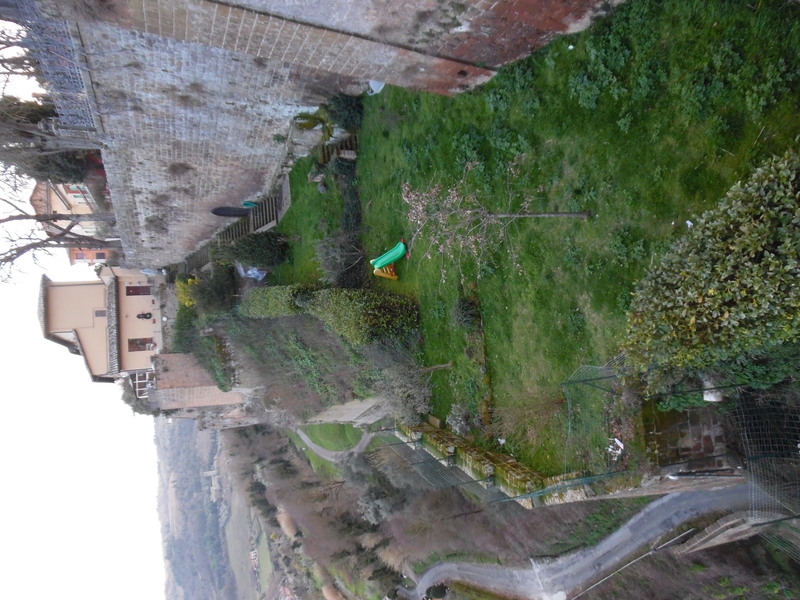 I also really like the picture below because I am seriously jealous of that backyard. 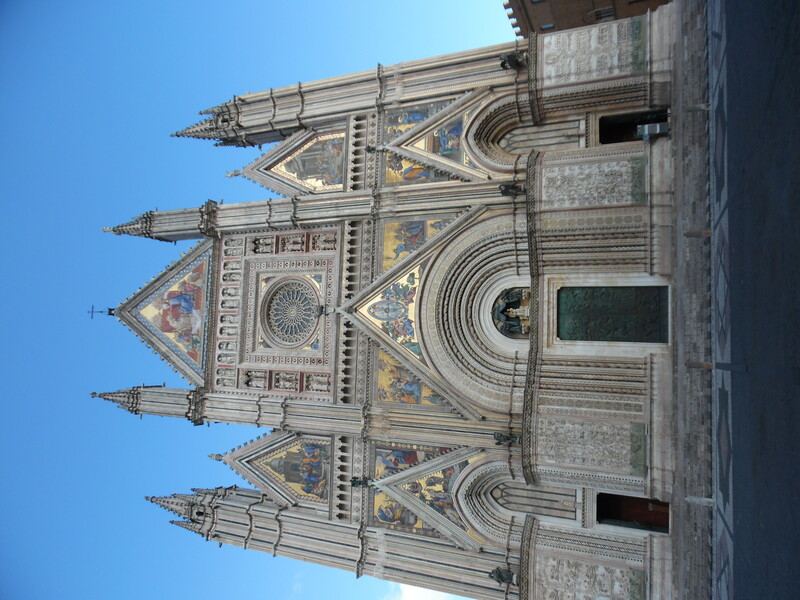 Orvieto is an amazing city, and it was a great day! Even if we did resemble human popsicles by the end. 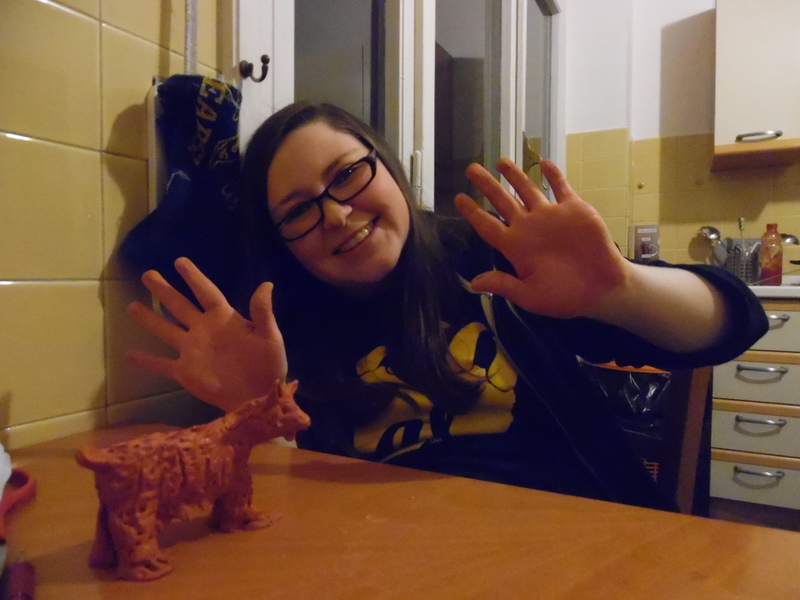 An Evening of Clay and Cooking! 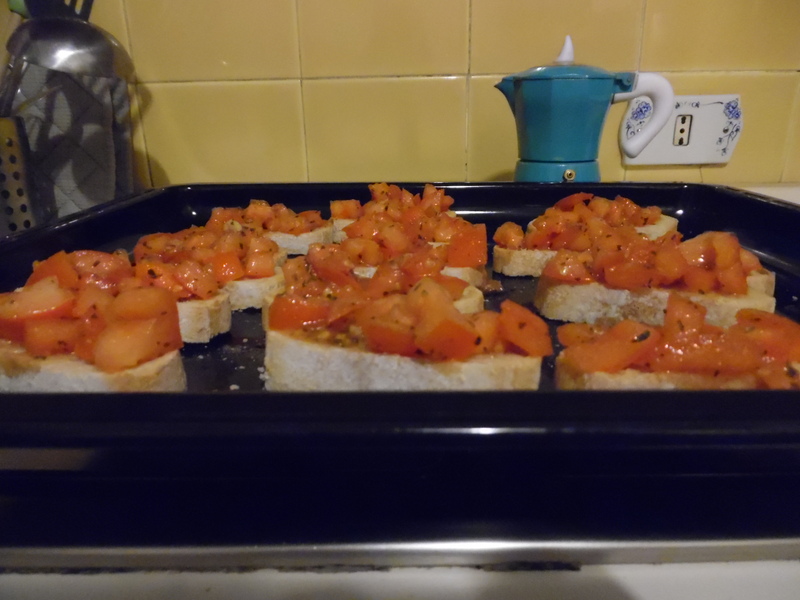 I got a recipe for Bruschetta from my italian professor and so I made my own homemade bruschetta! 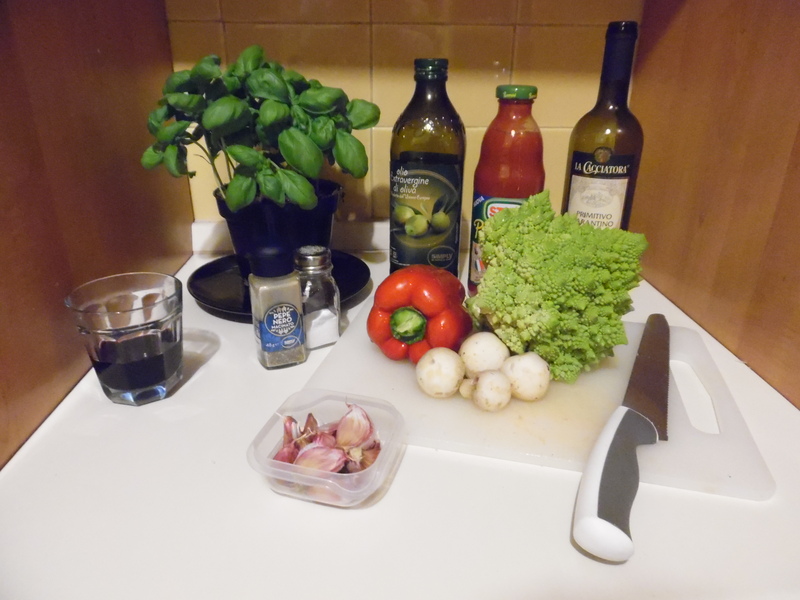 Here are all of the ingredients that I gathered for my cooking(minus the pasta). 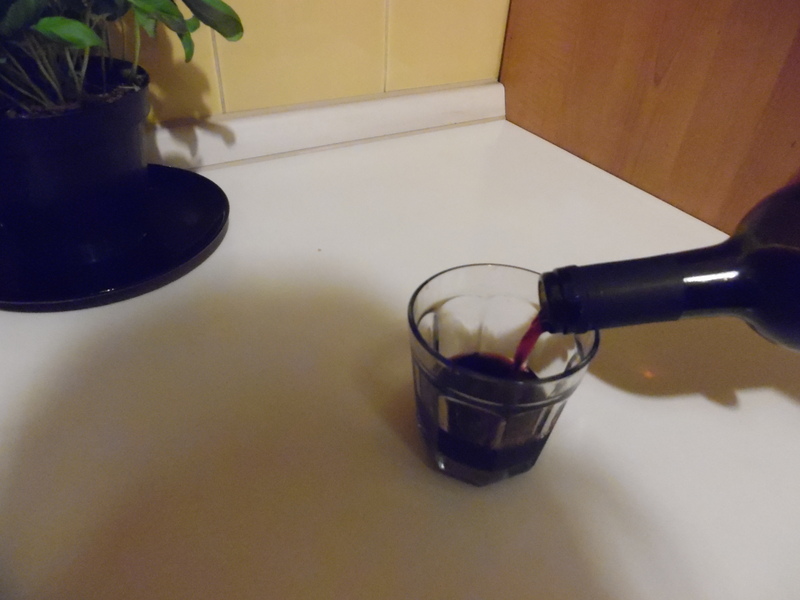 The pouring and drinking of the wine is always a part of my cooking process. 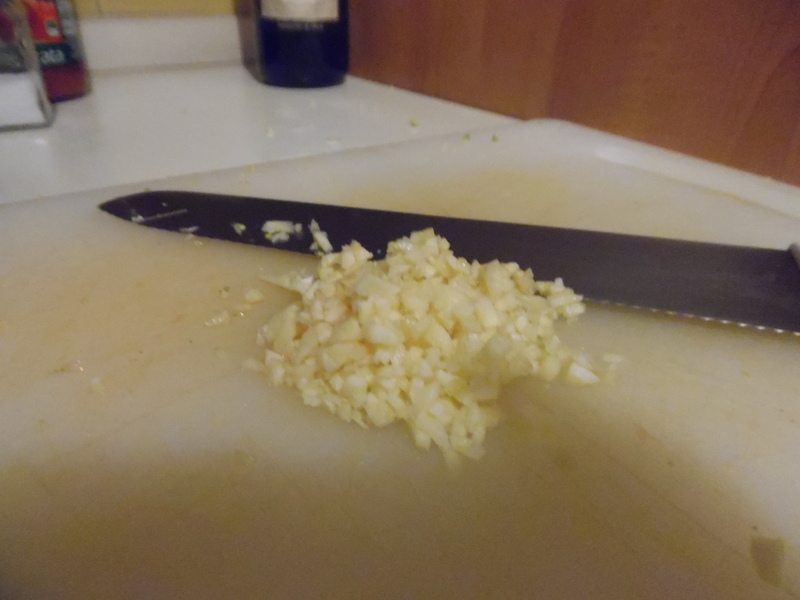 I cut all the veggies and put them in the pan, then I cut up some fresh garlic as well, because I LOVE garlic, and nothing is better than fresh garlic. Unless you’re talking about fresh basil. 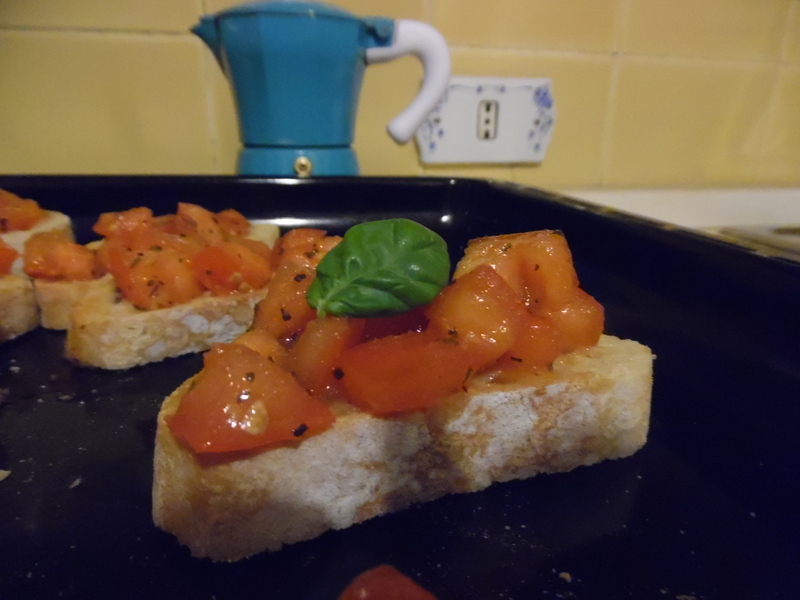 Fresh basil is amazing. I’ve been impatiently waiting for it to be warm enough for me to buy fresh basil and finally yesterday they had some at the store! YAY! 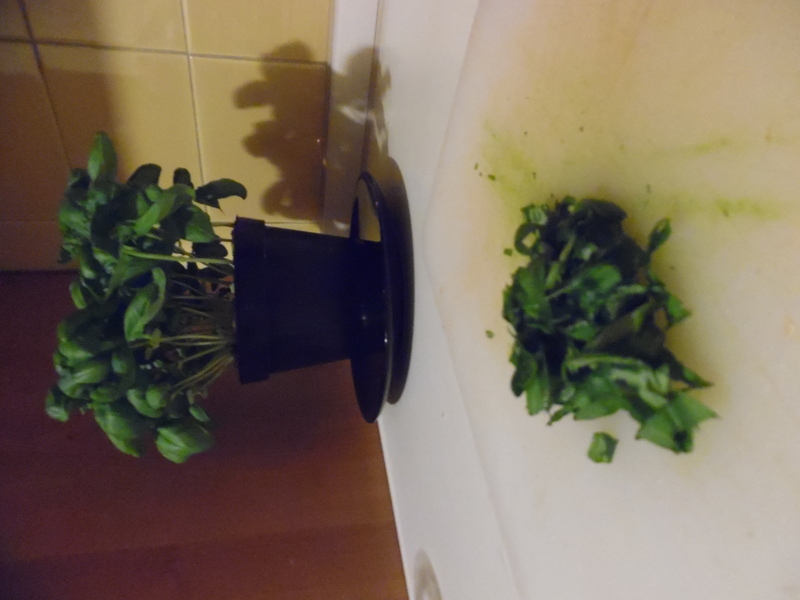 I now have a basil plant in my kitchen! 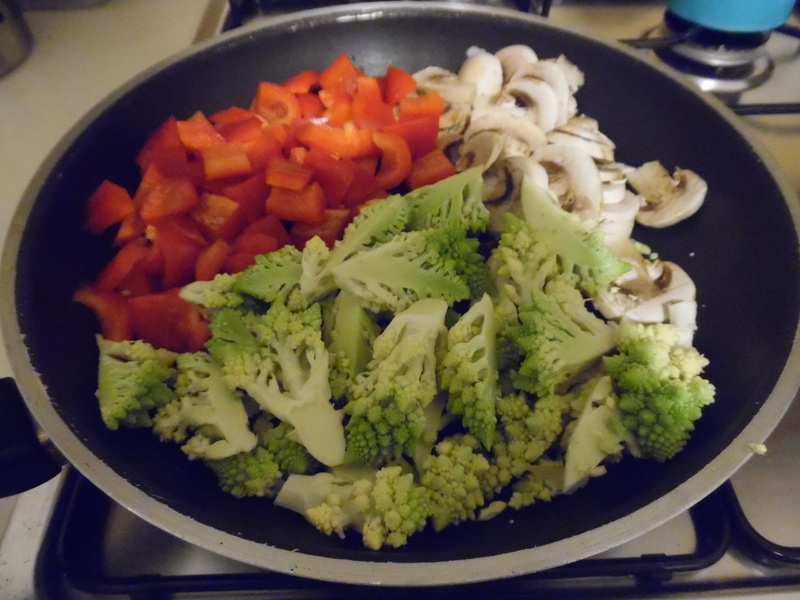 Salt, pepper, and olive oil with the veggies and then fry them for a bit. 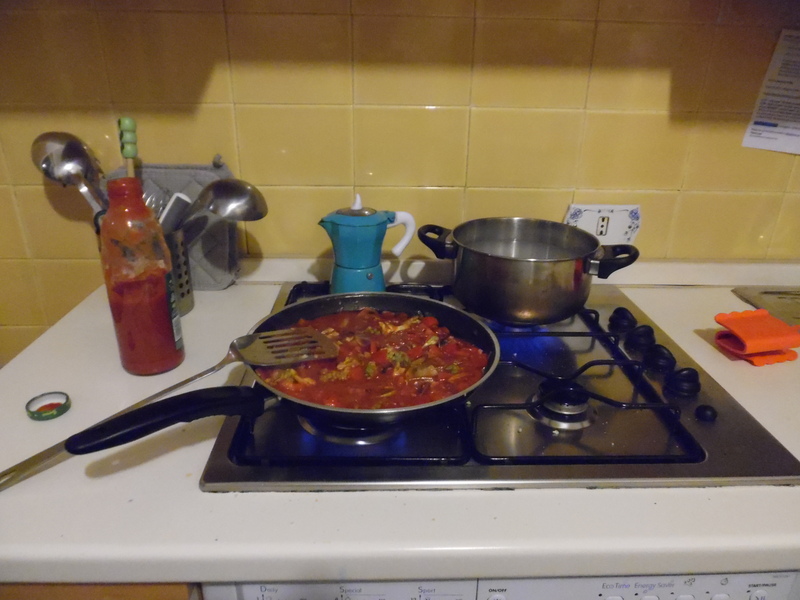 Later adding sauce to the pan(I always get Passato Pomodoro, which is just tomato paste with no additives or seasonings so that I am tasting only what I put in and I know if I’ve done a good job of mixing the spices myself). 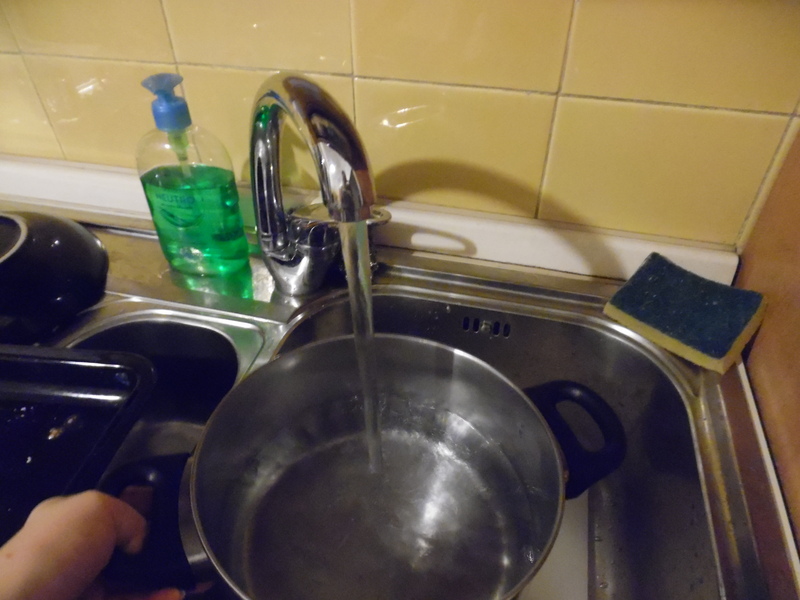 Start the water boiling for the pasta with salt. 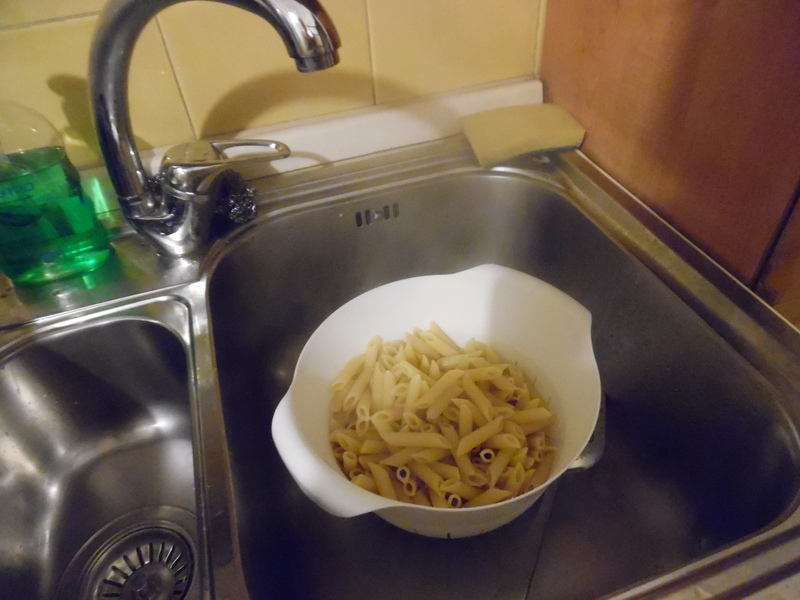 Once the water is boiling add the pasta. 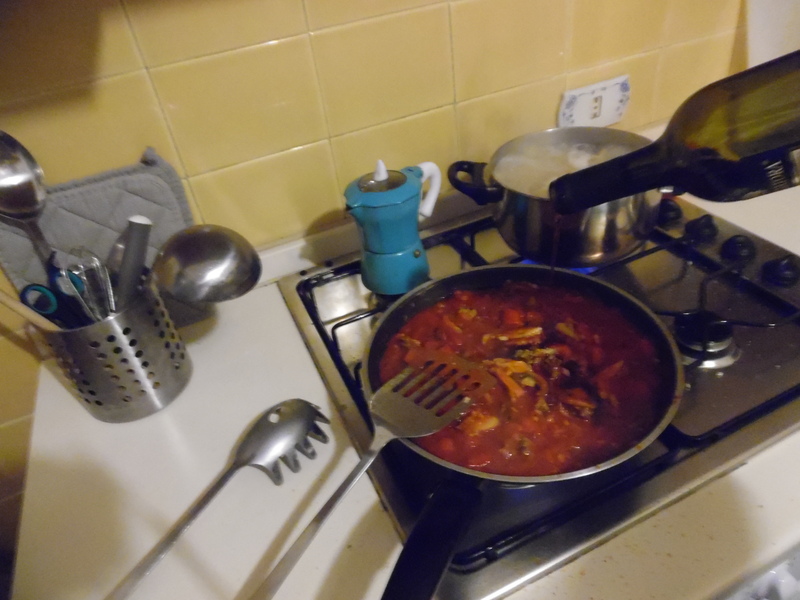 I also usually add some wine to my cooking. I like the way it turns out, so give it a shot. 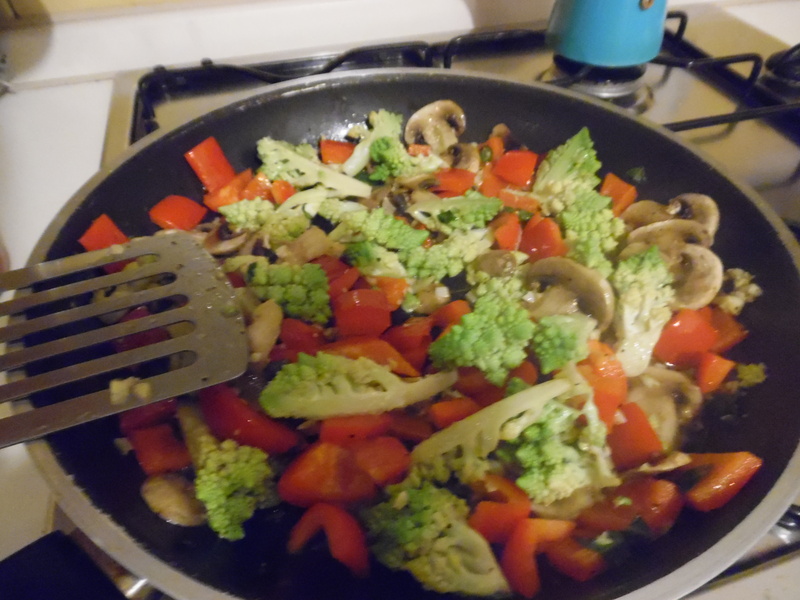 But if you use red wine early on with veggies you will sometimes end up with purple veggies. 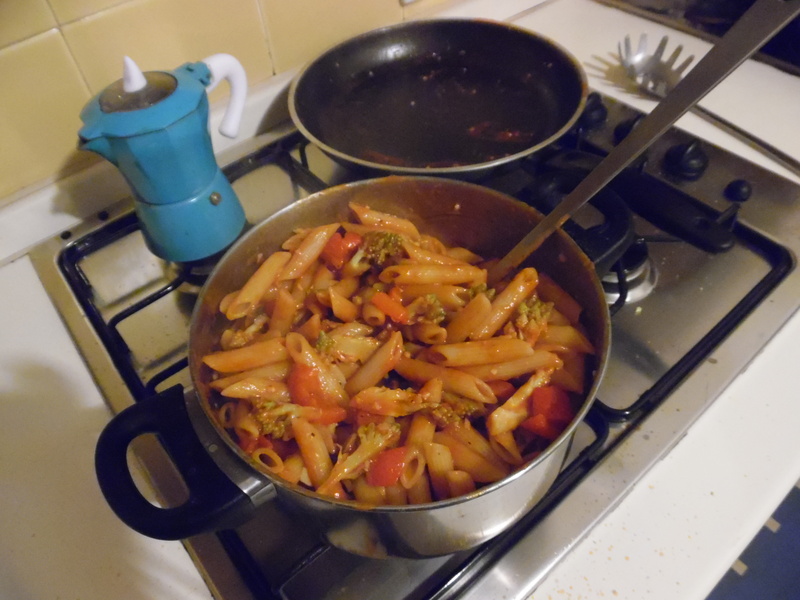 Once I drain the pasta I put the sauce and pasta together and mix it for a bit still on the stove so that the sauce will cling to the noodles. 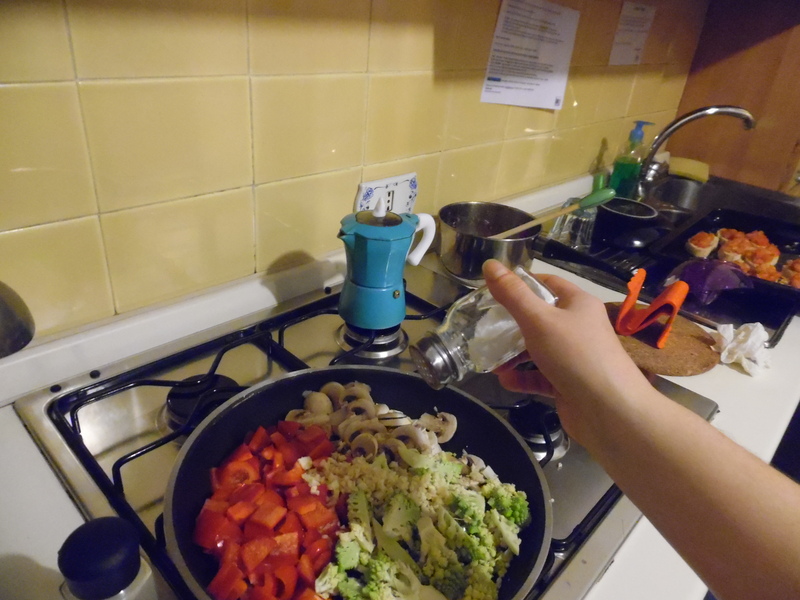 This also works really well if you strain the pasta a bit before it is completely done, or as the italians call it “al dente”. 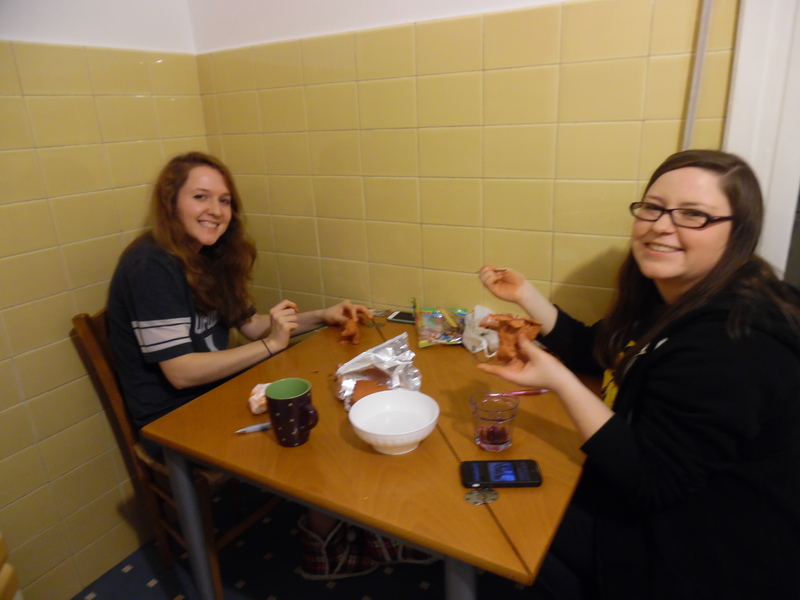 Here we are enjoying a fabulous homecooked meal in Rome! Now for the After dinner activities! 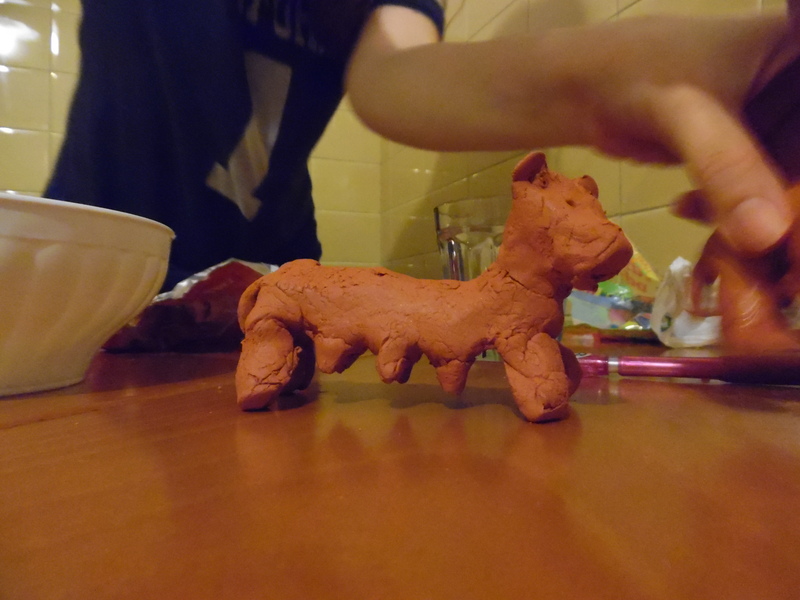 We bought some clay at a store nearby and decided to try to make some she-wolves! 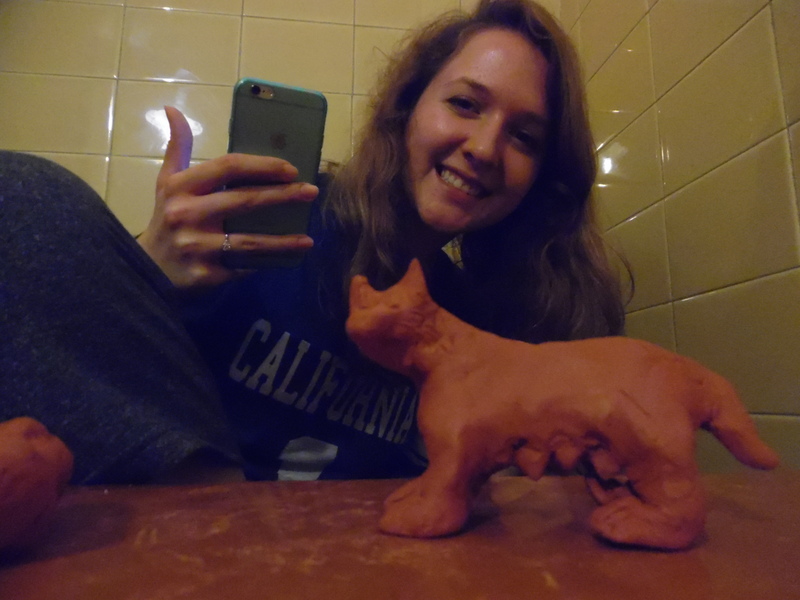 Note there is no she-wolf done by me, I gave up and just played with the clay for a bit, not really creating anything. I’m just not very artistically talented, but look at the adorable ones made by other people! Yes, we all still have clay in our fingernails. 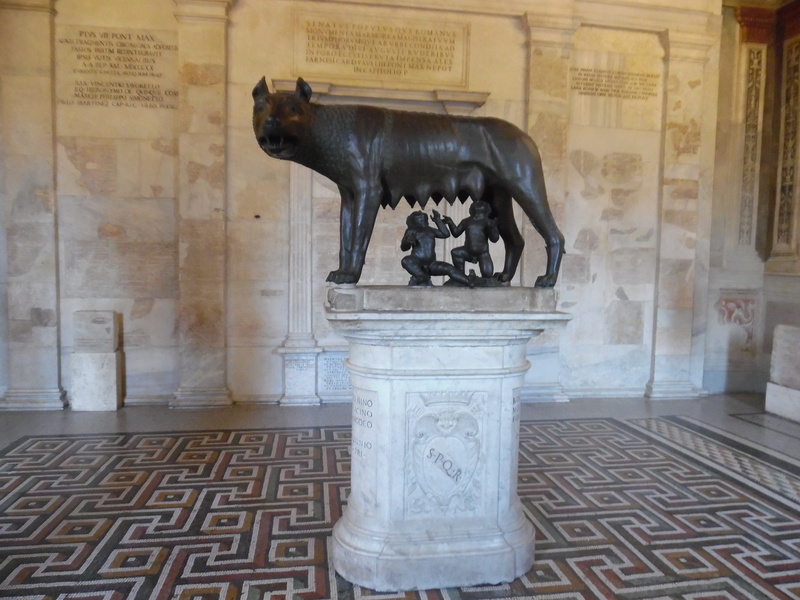 Lupa di Roma-The She-wolf of Rome! 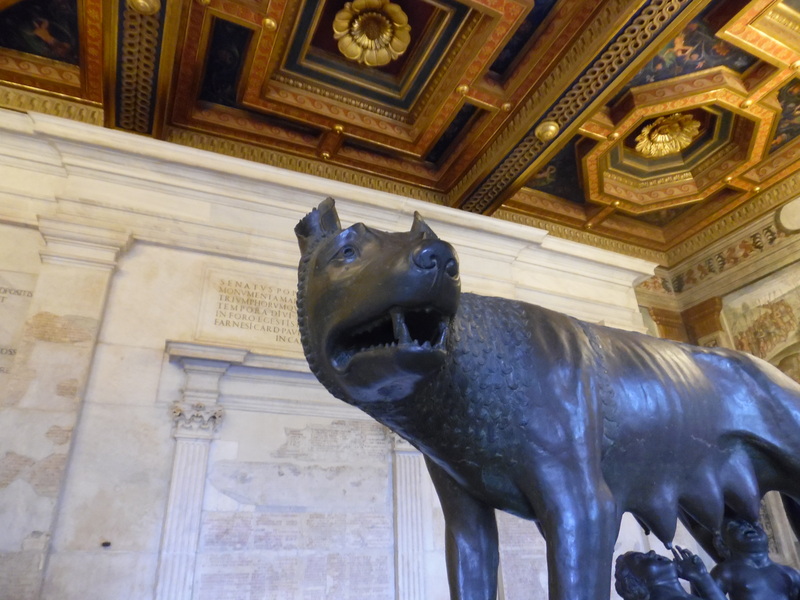 The She-wolf has been a symbol of Rome ever since the founding of the Roman Republic when the Capitoline She-wolf was commissioned by the Senate. 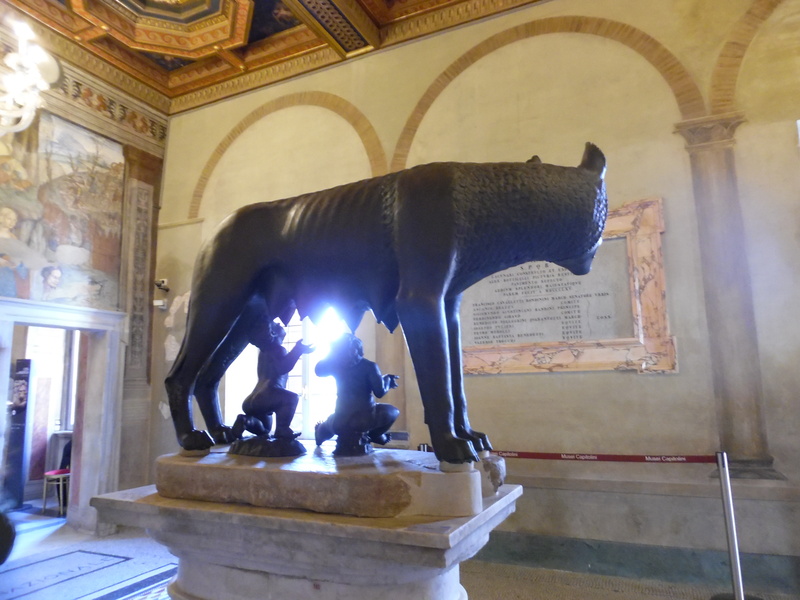 Today it can still be seen in the Capitoline Museums, but you don’t have to go there to see a she-wolf in Rome, she is everywhere! 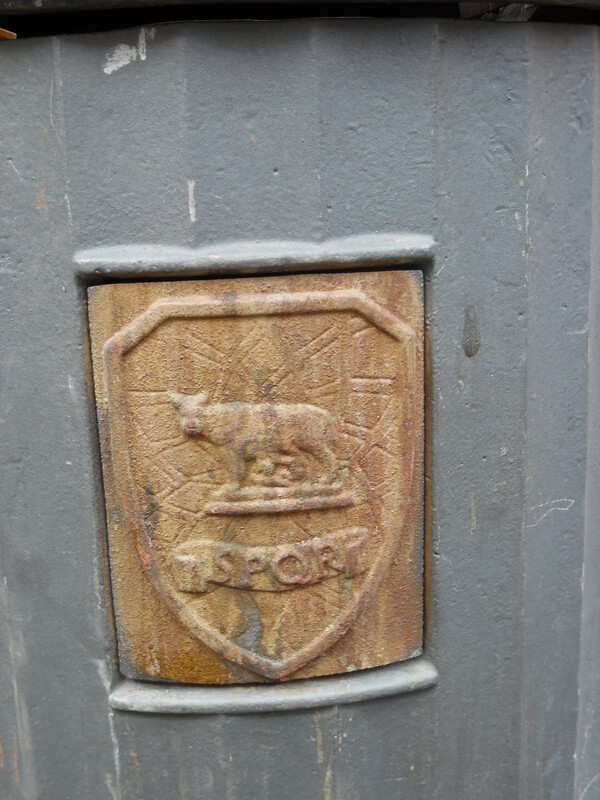 You can see the She-wolf everywhere you go in Rome today, whether on a garbage can, an AS Roma Jersey, or in the Vatican. 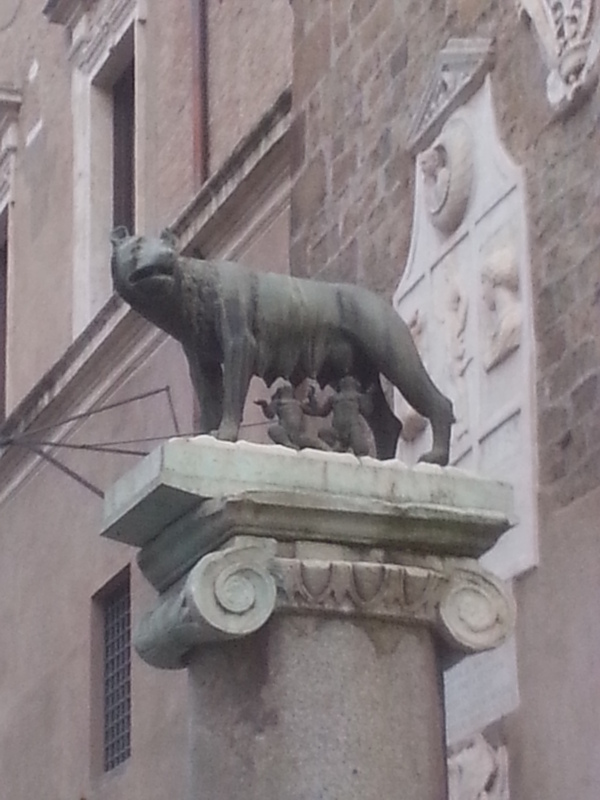 What follows are some pictures of the She-wolf that I’ve taken in Rome so far in my trip. This is a graffiti painting of the She-wolf that I see everyday on my walk to and from school. 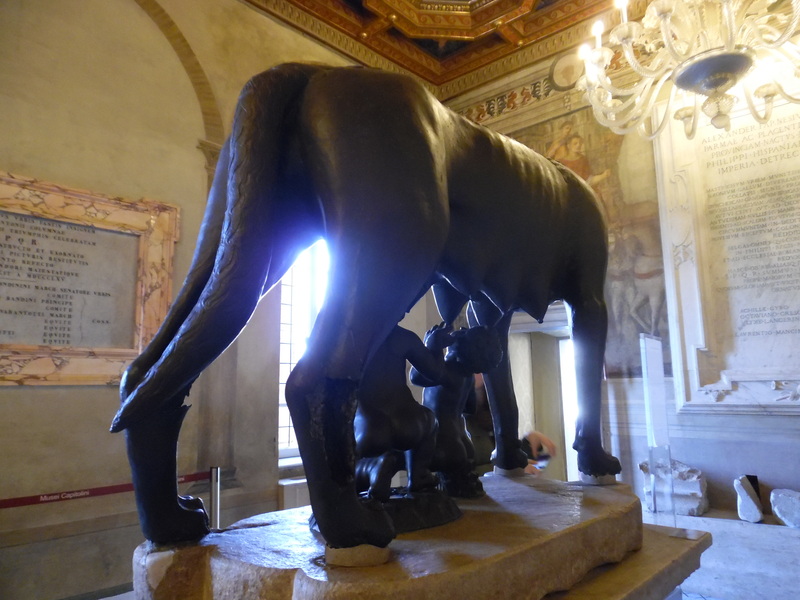 This is a copy of the She-wolf on display outside of the Capitoline museum. 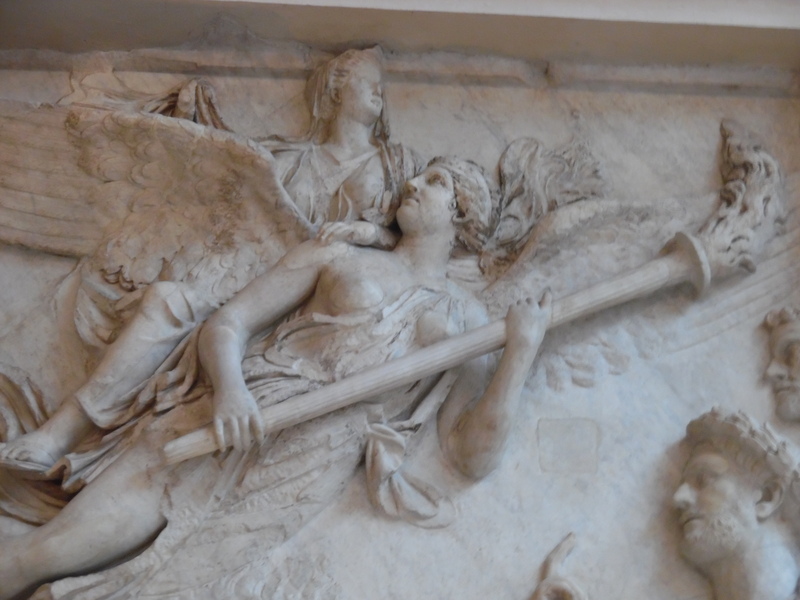 These are some relief sculptures that I found early on in my time here. I think they were on a church. 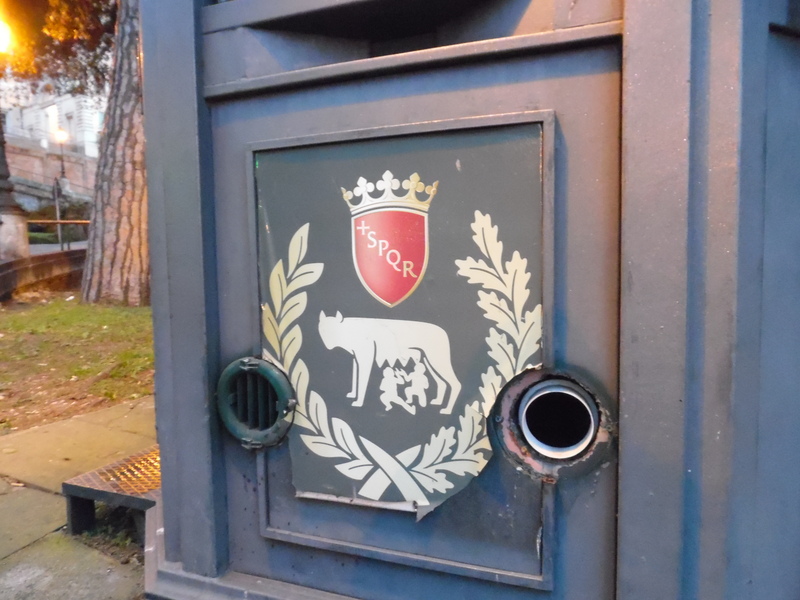 This is one of the Polizia boxes that can be found around the city, they all have the She-wolf on them. 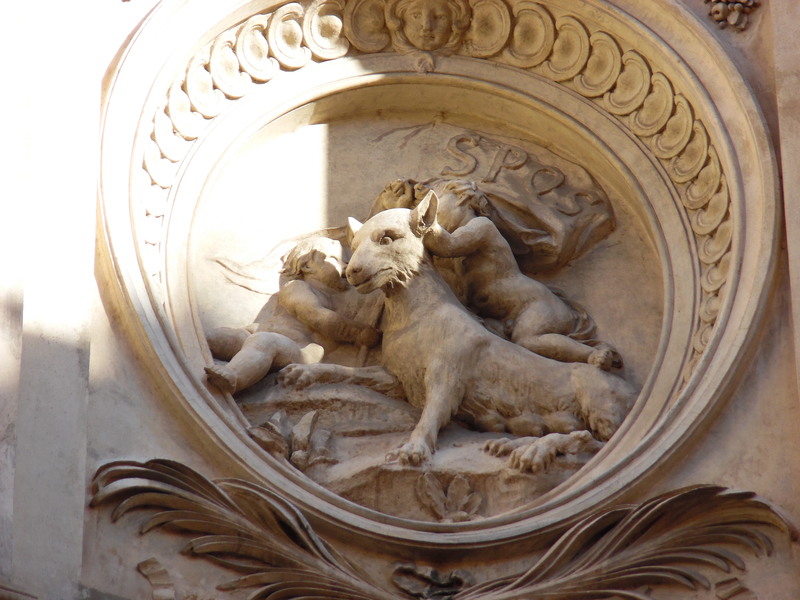 This is from a building near the Capitoline Hill, along the ancient Triumphal parade route. 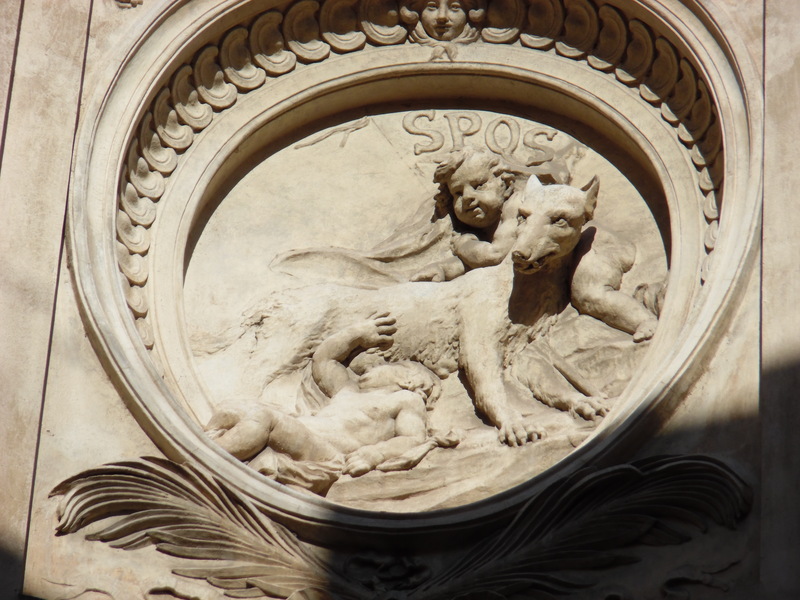 This is above a doorway in a Piazza in Trastevere. This is the She-wolf on a garbage can. 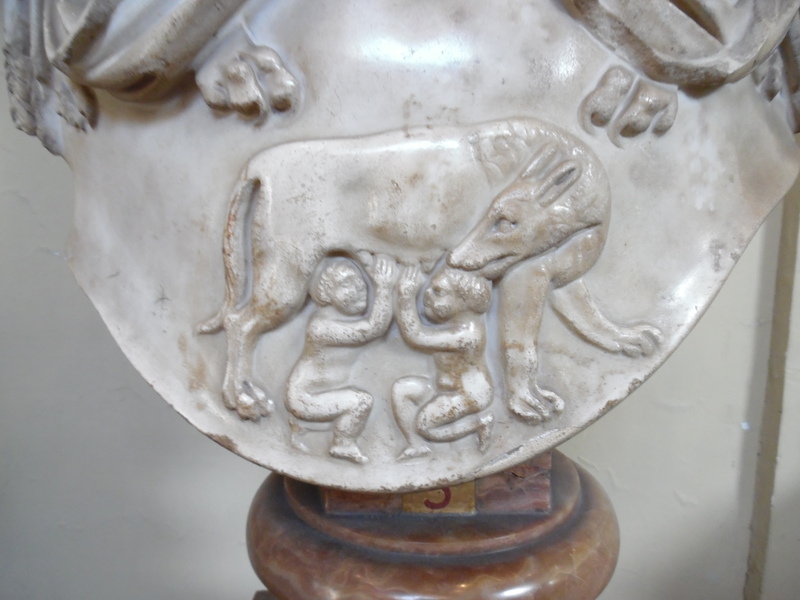 Here is a different design of the she-wolf, here she isn’t nursing baby Romulus and Remus, she is looking up at them being held by another man, I don’t know who it is supposed to be holding them. 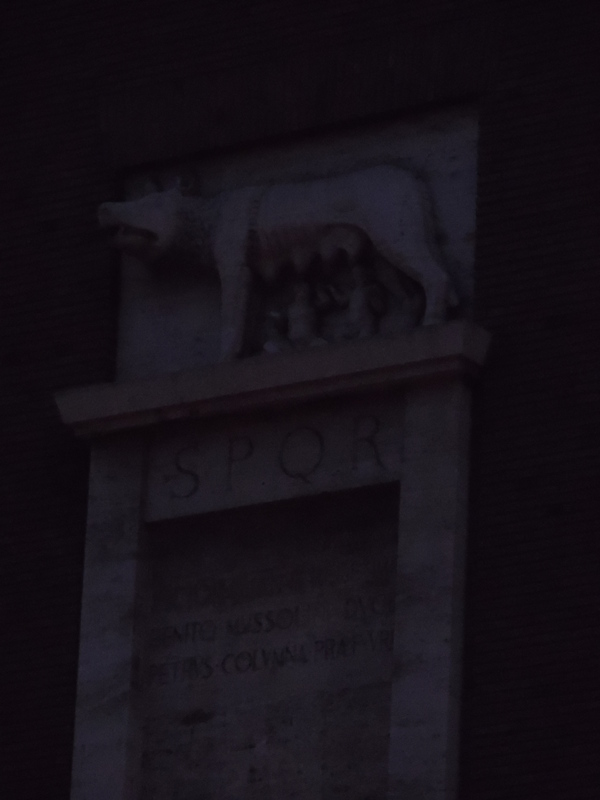 This is on one of the fascist building that Mussolini had build around the Mausoleum of Augustus. 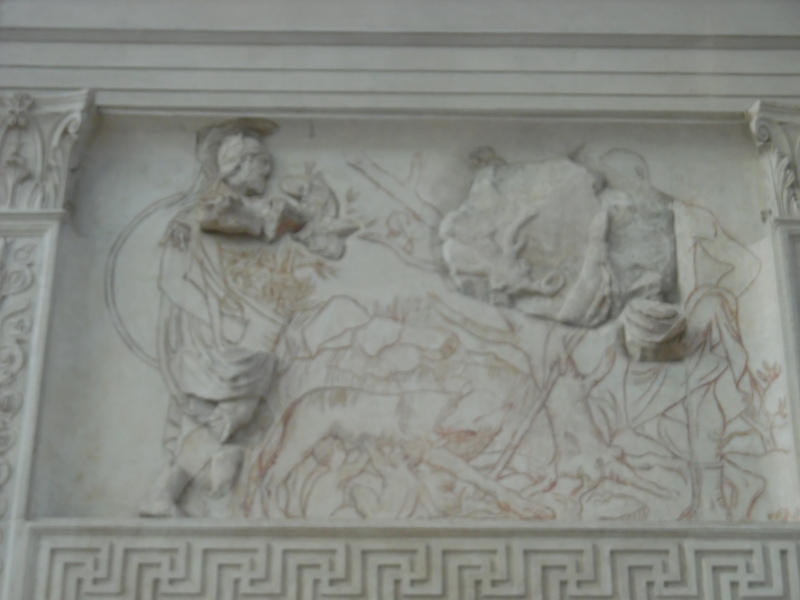 These are both images of the she-wolf that no longer survive on the Ara Pacis Augustae, but that from ancient sources we know to have been there. 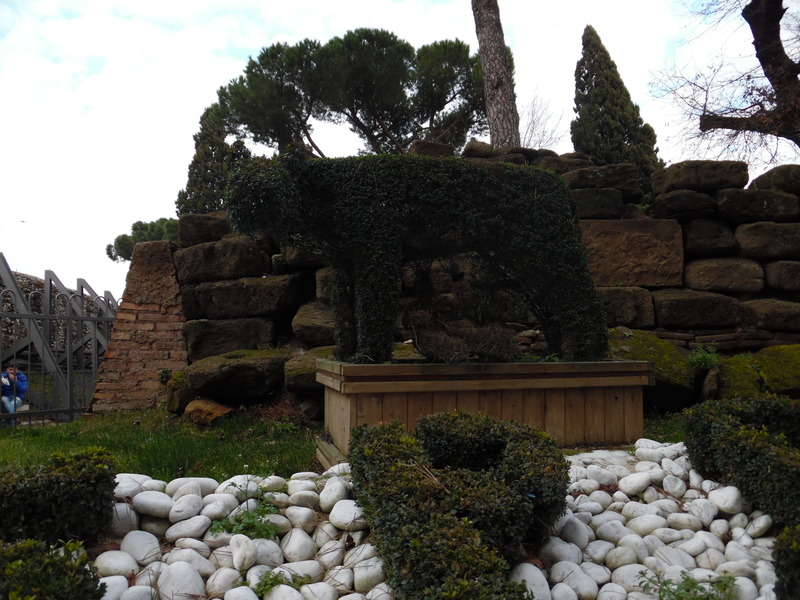 This is a hedge outside the Capitoline museum that has been formed into the shape of the She-wolf and twins. 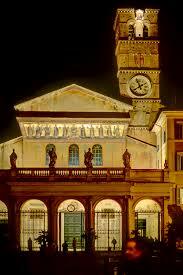 This painting is in the Capitoline museums. 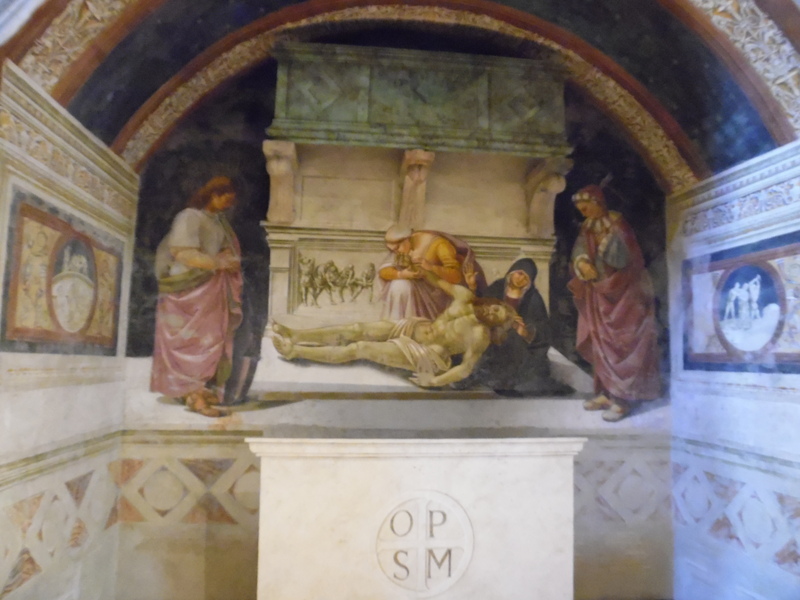 This relief sculpture is in the Vatican museums. 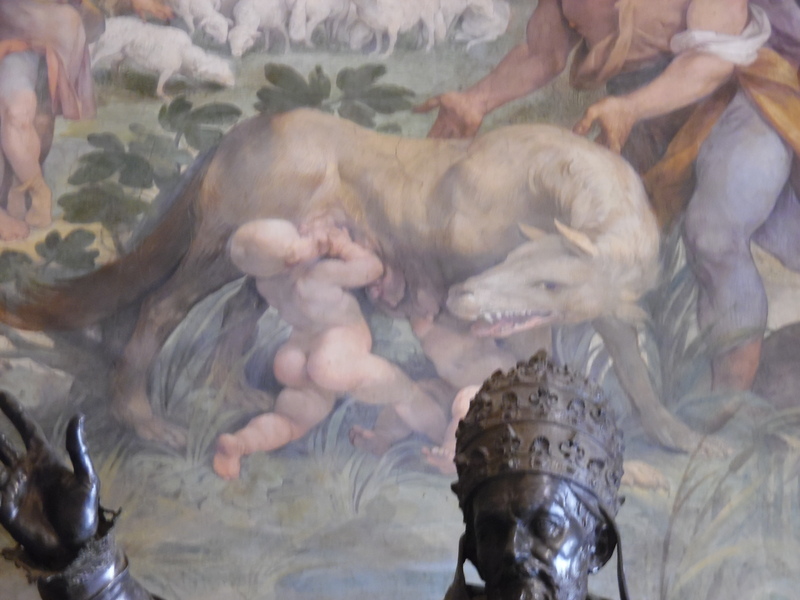 This bust is also in the Vatican Museums and you can see a depiction of the she-wolf on the bottom of it. 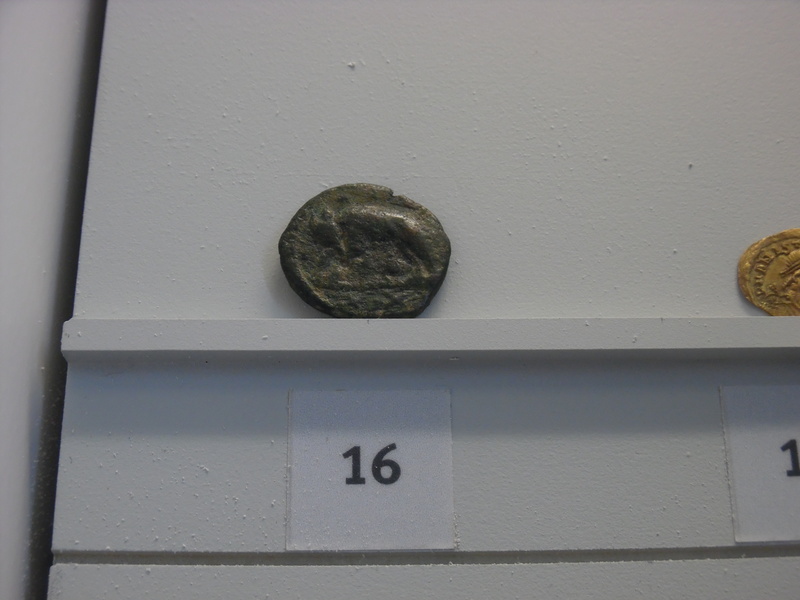 Here is an ancient coin in the Museo Nazionale Romana-Crypto Balbi that has the she-wolf on it. 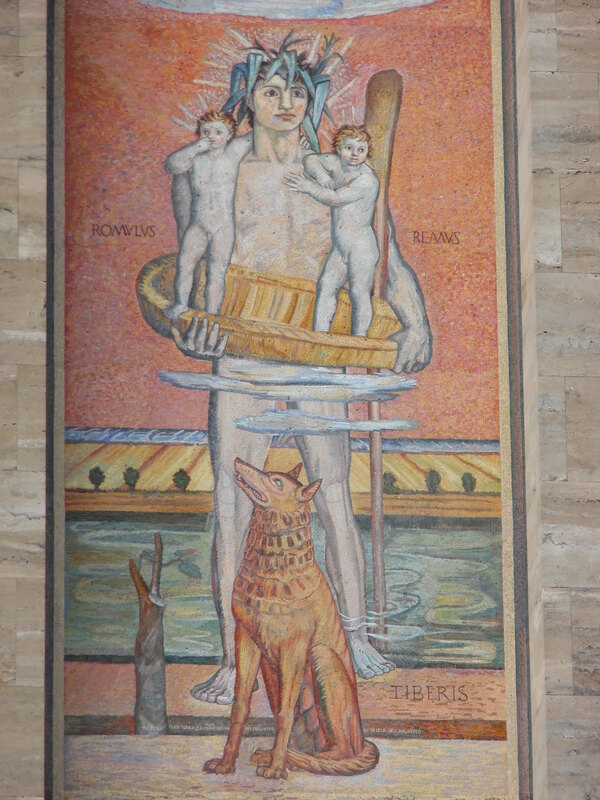 And finally, here is the original she-wolf!!! 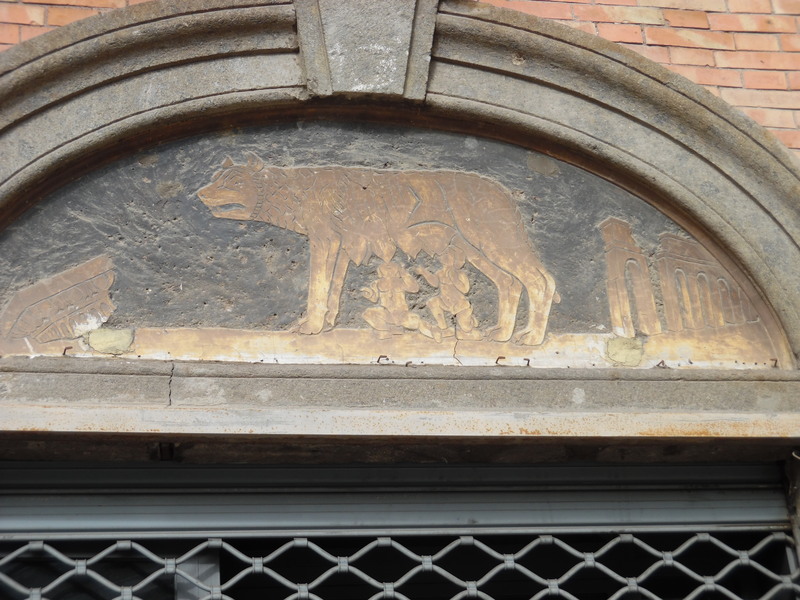 Anyways, here are all of the she-wolves that I have seen and photographed so far this trip. 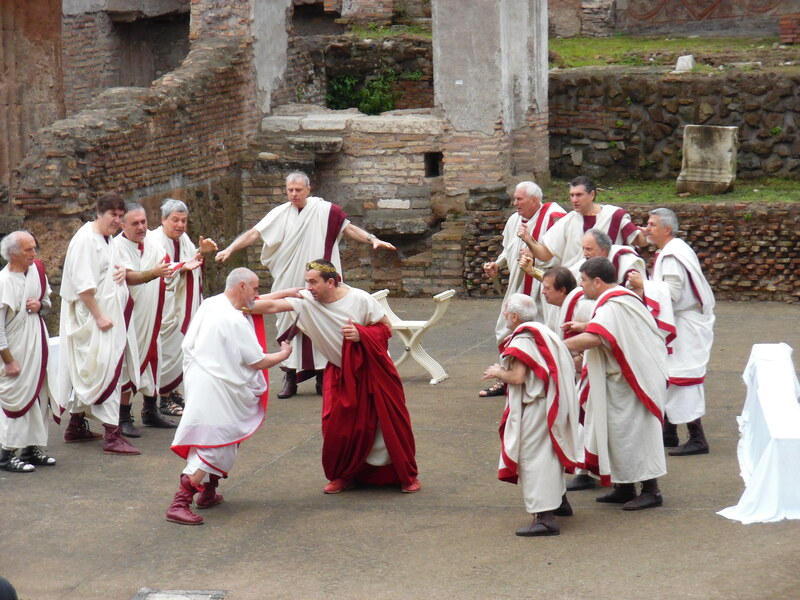 As you can see she remains to this day a very important symbol of the city of Rome, and is just another example of the effect of the ancient world on the modern city. 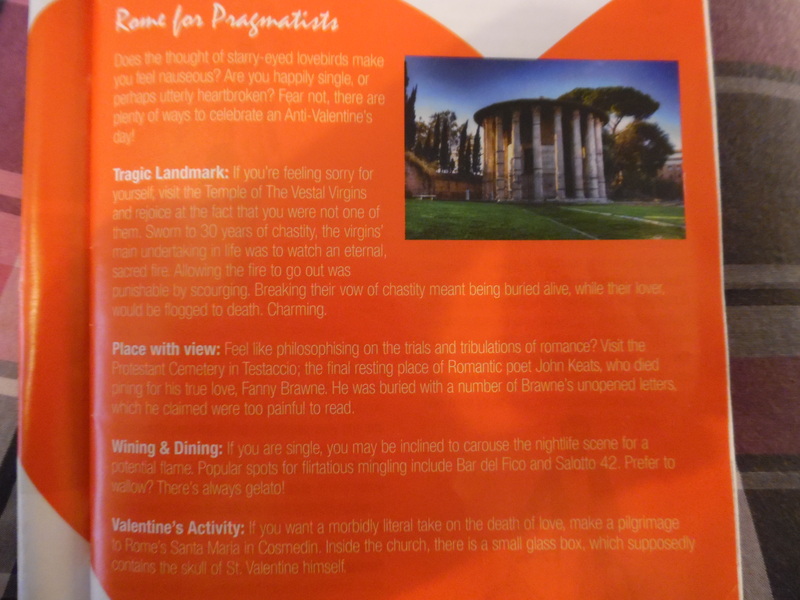 I skipped the Wining and Dining part, but I started out my day with my plan: First I would go to the Protestant Cemetery, say hello to Keats (which I was actually really excited about because I love Keats), then I’d head over and walk around the outside of the forum to look at the Temple of Vesta (and pray that I wouldn’t turn out like them), then I’d walk down to the Basilica of Santa Maria is Cosmedin to see the bones of San Valentino (to curse him for being the namesake of such a dreadful holiday). 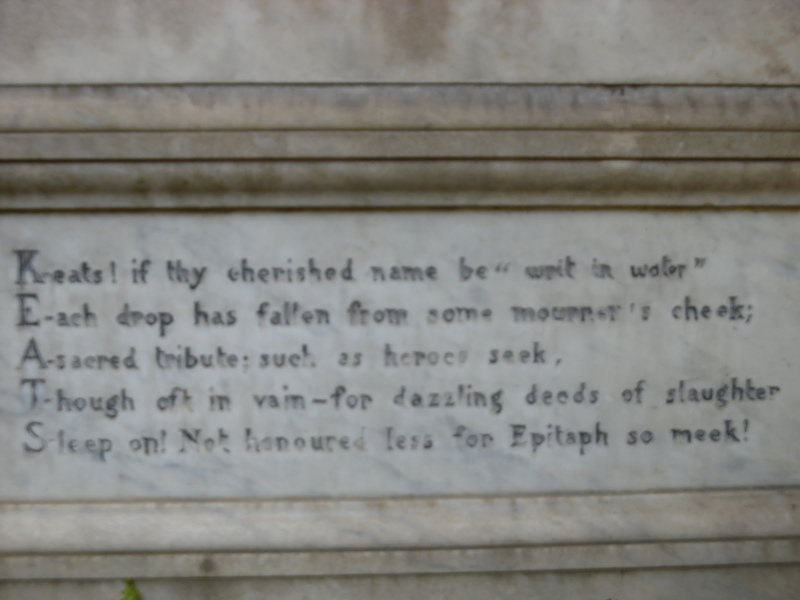 So off I went to a cemetery! 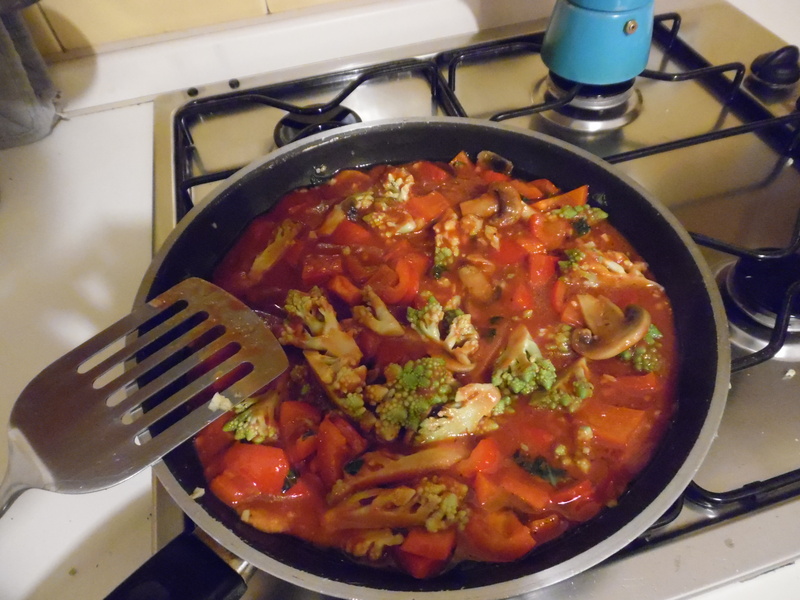 Which was really great. 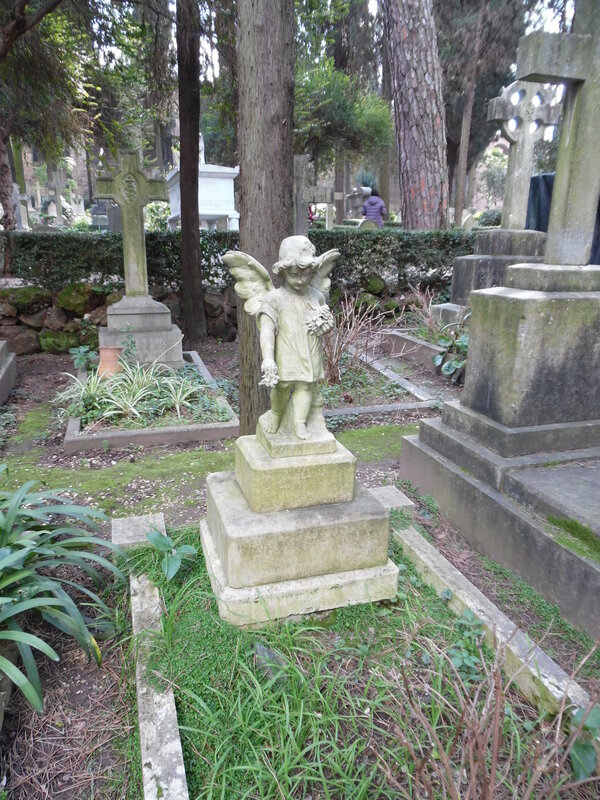 I like walking around old cemeteries, and this one was very well maintained. 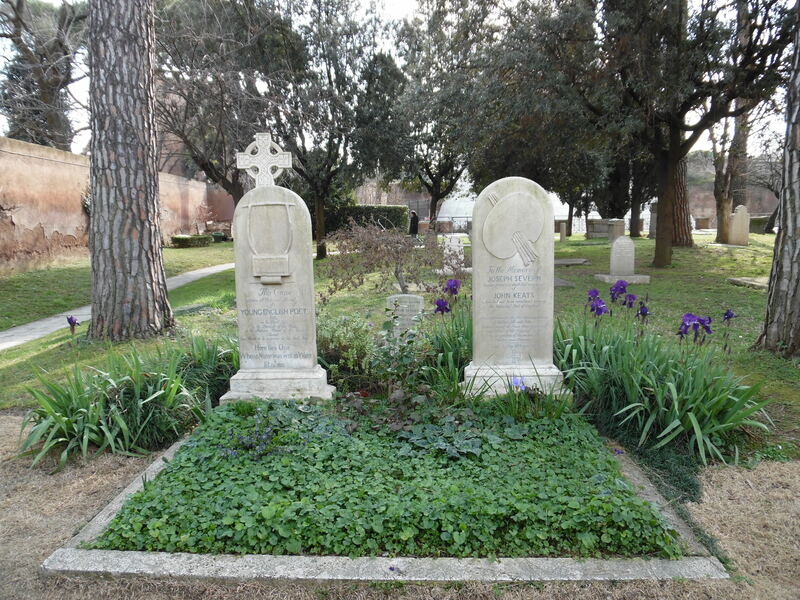 It was a very pleasant morning walk, peaceful and quiet, and lots of pretty tombstones. 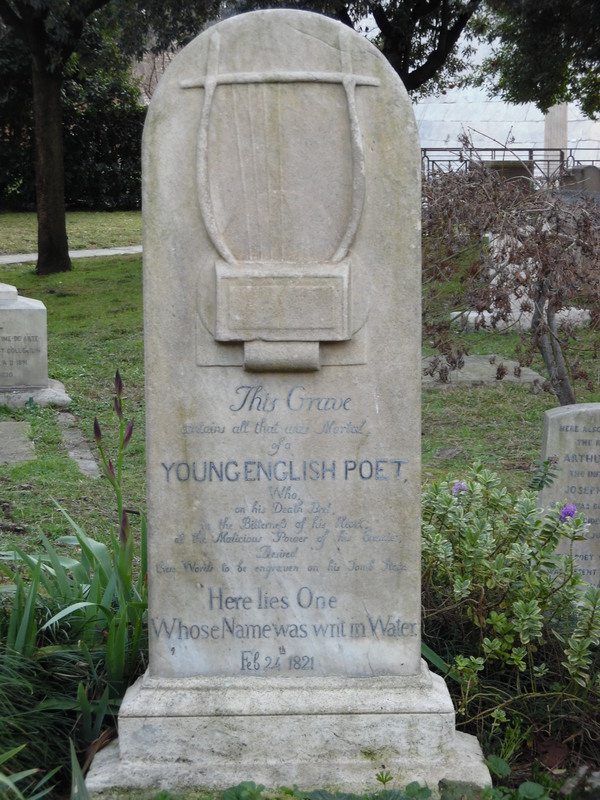 I got to see Keats grave, and I had wanted to sit in front of him for a bit and read his poetry, unfortunately that was killed by the couple sitting on the only bench in front of him making out. 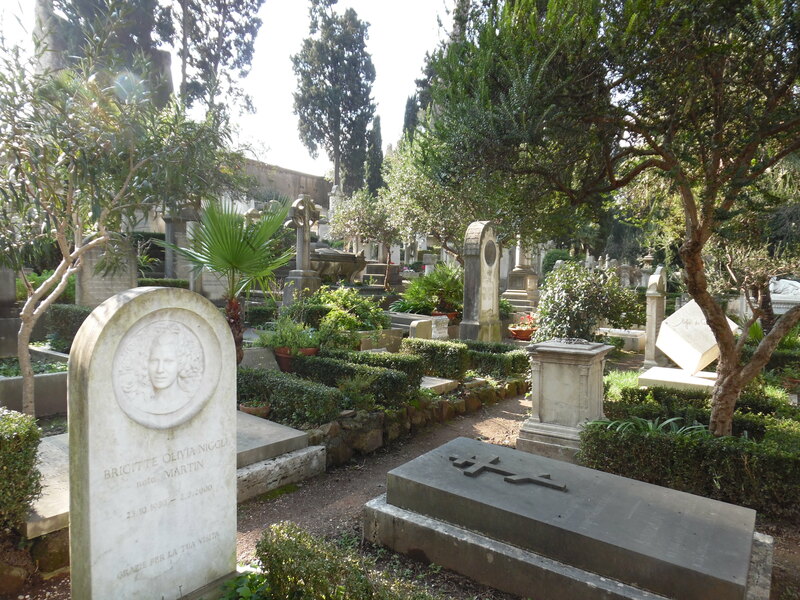 But I got to see him, say hello and get some nice pictures of his really pretty eternal resting place, right at the foot of the Pyramid of Cestius. 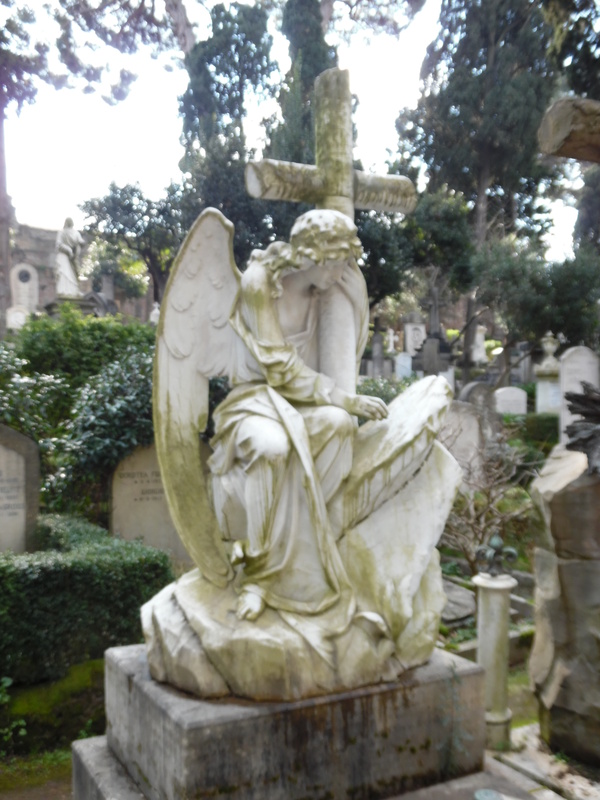 There are many other great things to see in the cemetery, and perhaps I’ll do a longer post with more images from the cemetery, but for this post I suppose I should stay on task. 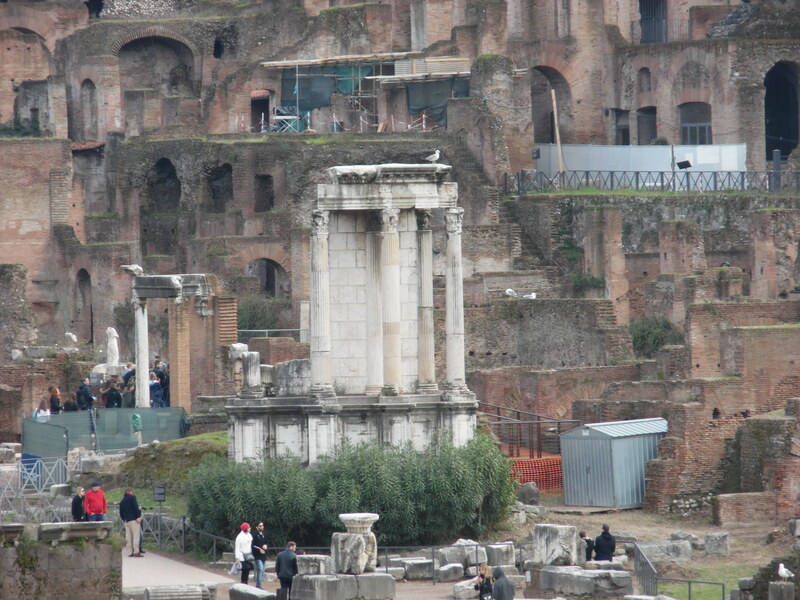 So later in the day I circled the forum trying to spot the correct temple, while also seeing a ton of great buildings. 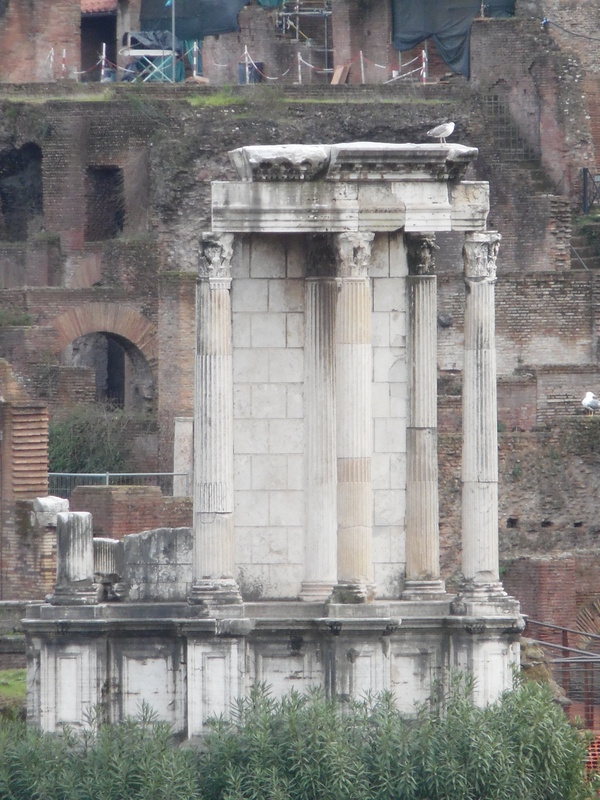 Finally with the help of the interwebs I was able to spot the ruins of the Temple of Vesta. 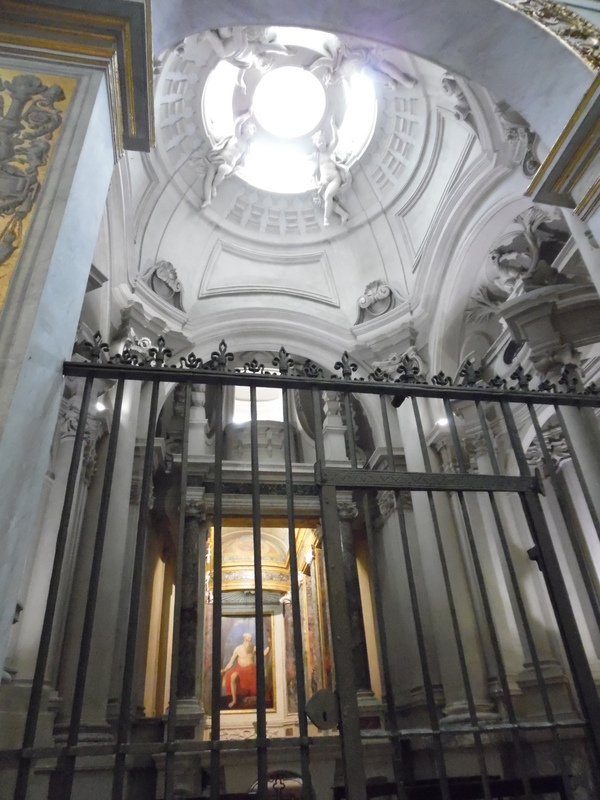 This temple was the home to the Vestal Virgins, who cared for the Eternal Flame. 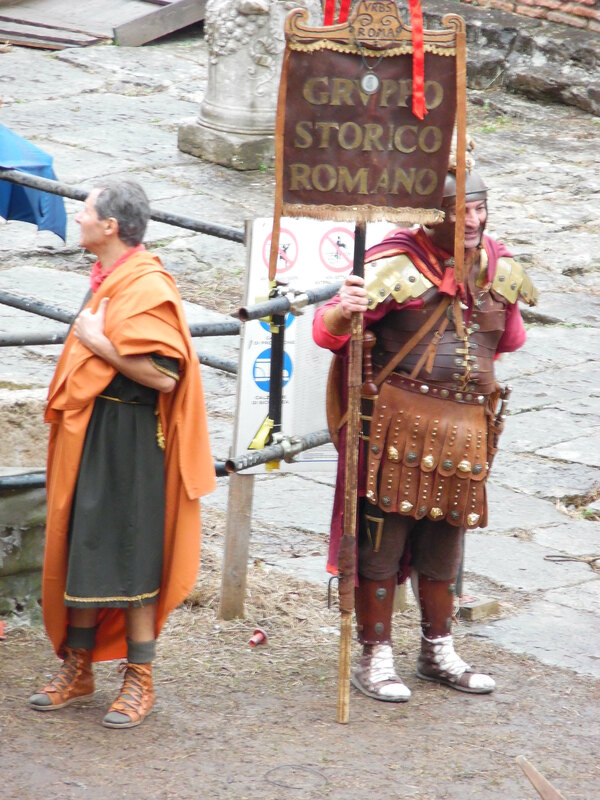 If they let the flame burn out they were flogged and if they broke their vow of chastity they were burned to death….sounds like a great job. 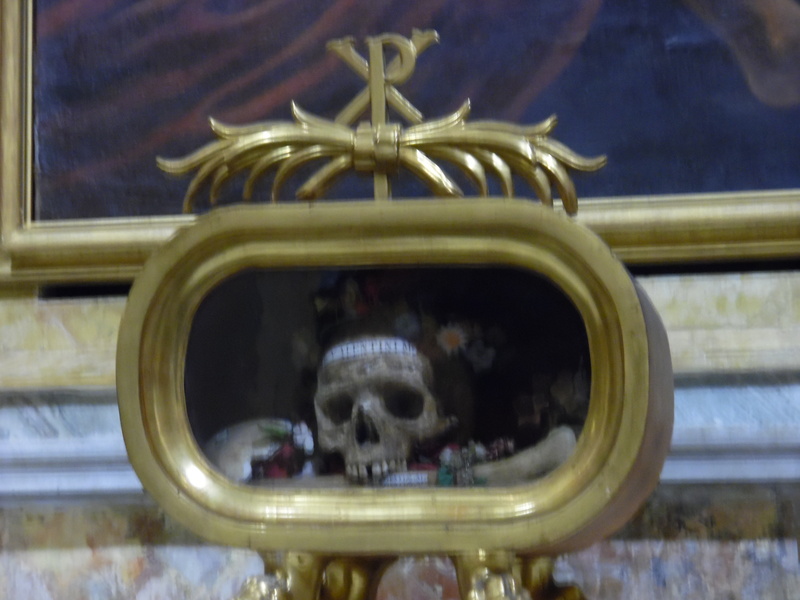 The next stop was the Basilica of Santa Maria in Cosmedin, which is well-known for housing the Bocca Della Verita, or the mouth of truth, however it also houses the skull of Saint Valentine, who was very popular yesterday. 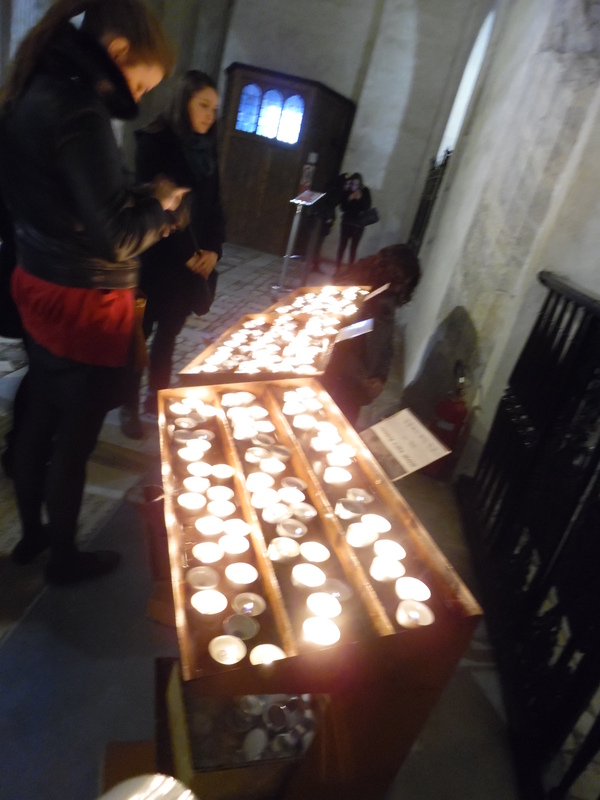 There was quite a crowd around him of people all lighting candles and taking pictures (although I’m pretty sure they were mostly American). 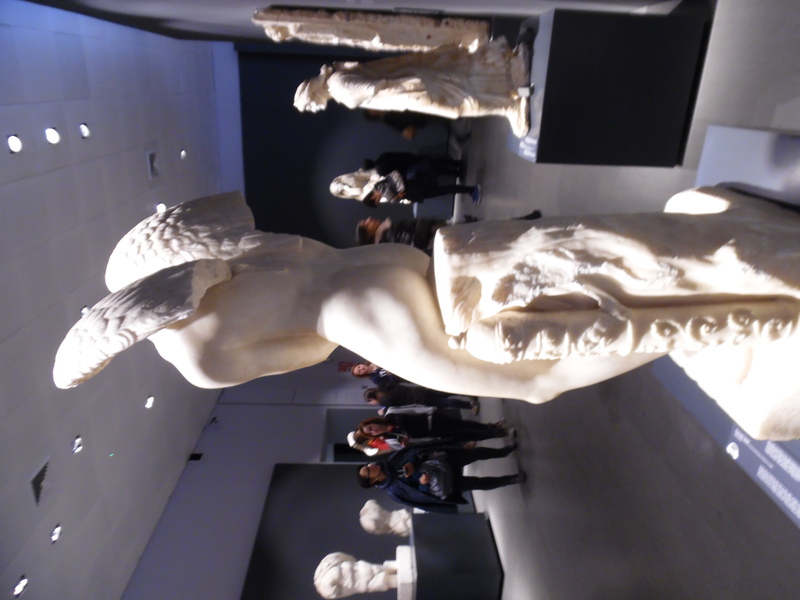 Flocks of young female students (like me I guess, only less cynical maybe?) 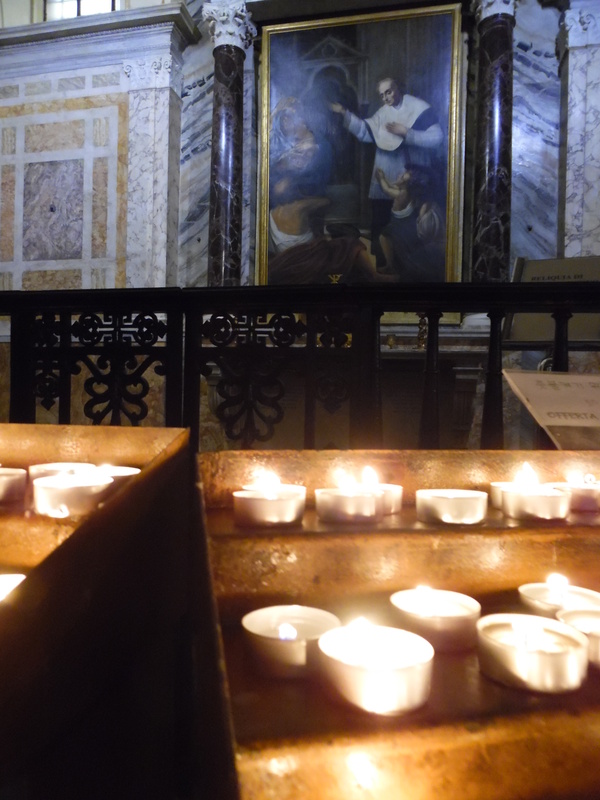 came and lit a candle to Valentine, hoping to find love. 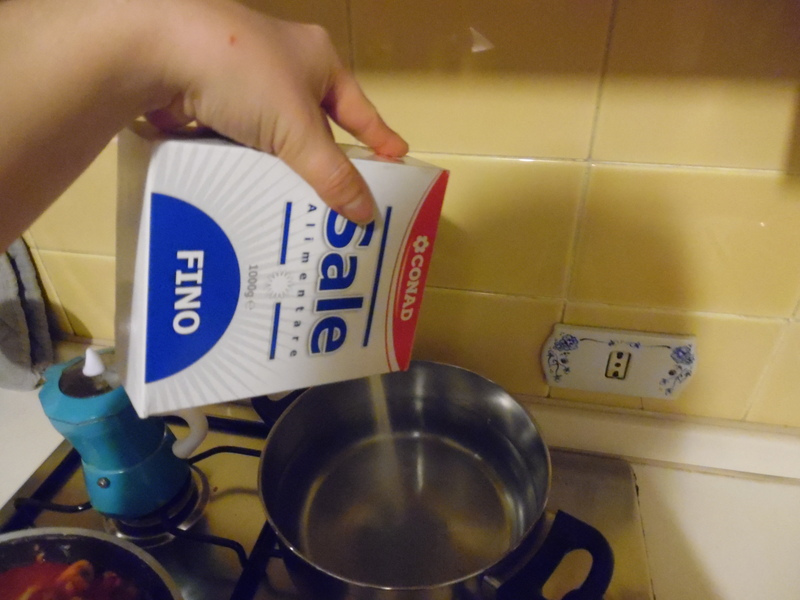 Ok so I lit one too, I guess all the optimism of those around me rubbed off. 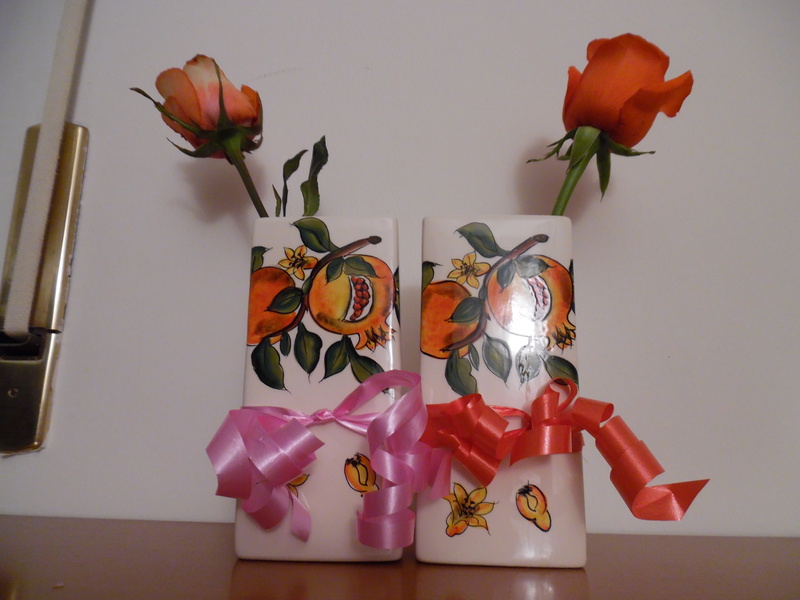 Anyhow, after that my roommate and I headed back towards home, stopping to buy each other flowers (we decided to be each others Valentines). 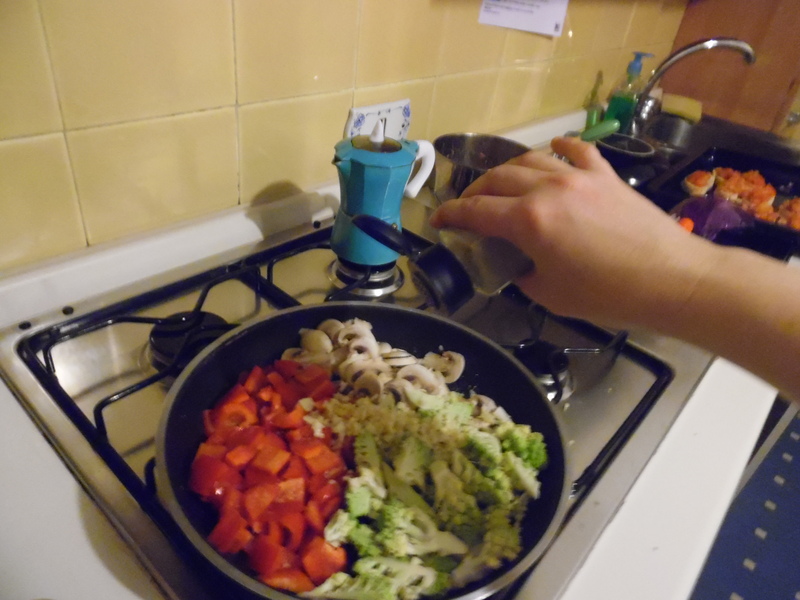 We made dinner and had a great Friendentines day. 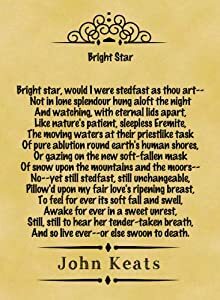 And now a poem by Keats because he’s great. 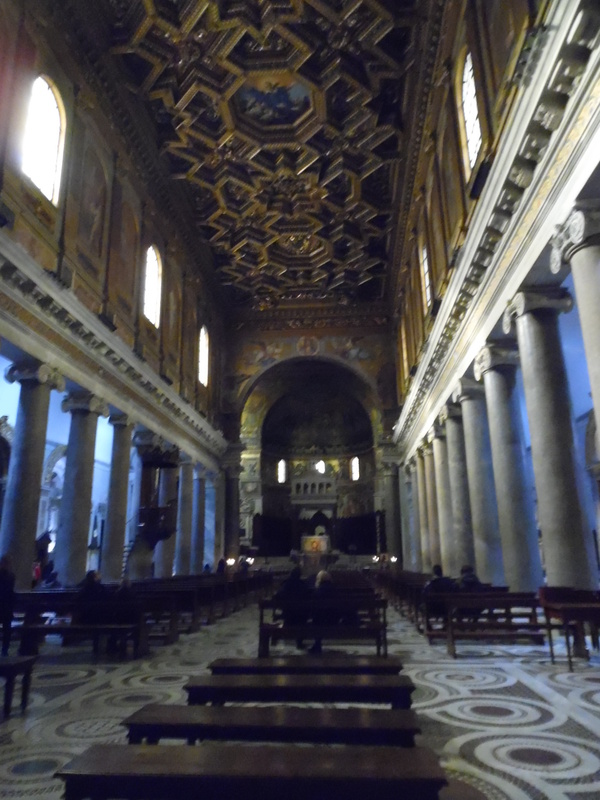 While talking a walk through Trastevere a couple Saturday’s ago my roommate and I decided to stop into a Basilica that we walk past a lot on the way to school. 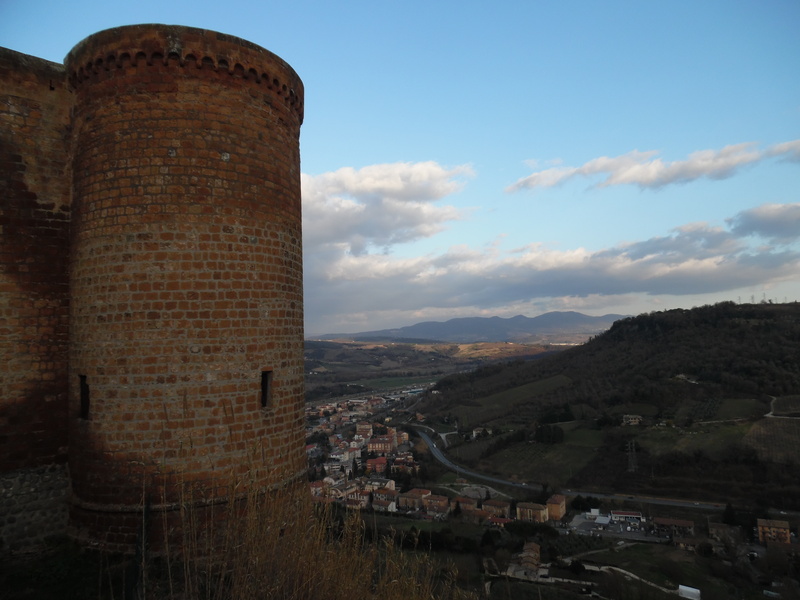 It’s not one of the major hotspots being that it’s outside of the main city center, but it is definitely worth visiting. 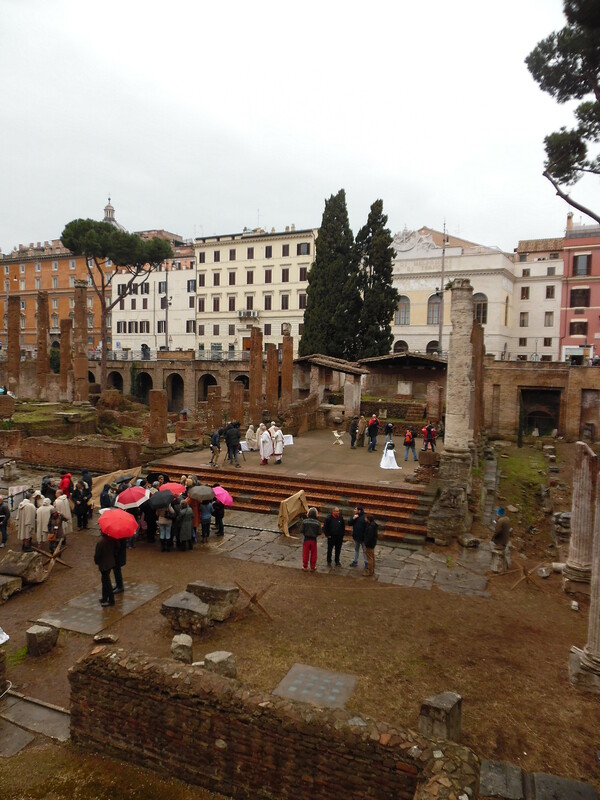 The piazza outside of it is one of my favorites because there is plenty of space and you can often see some sort of activity going on in it. 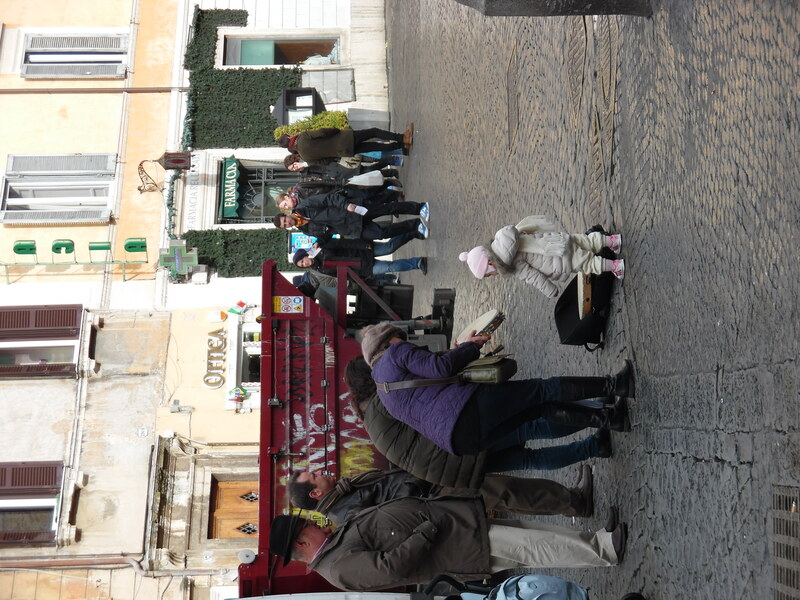 On this day there was an accordion player and an adorable little girl who wanted to play along. 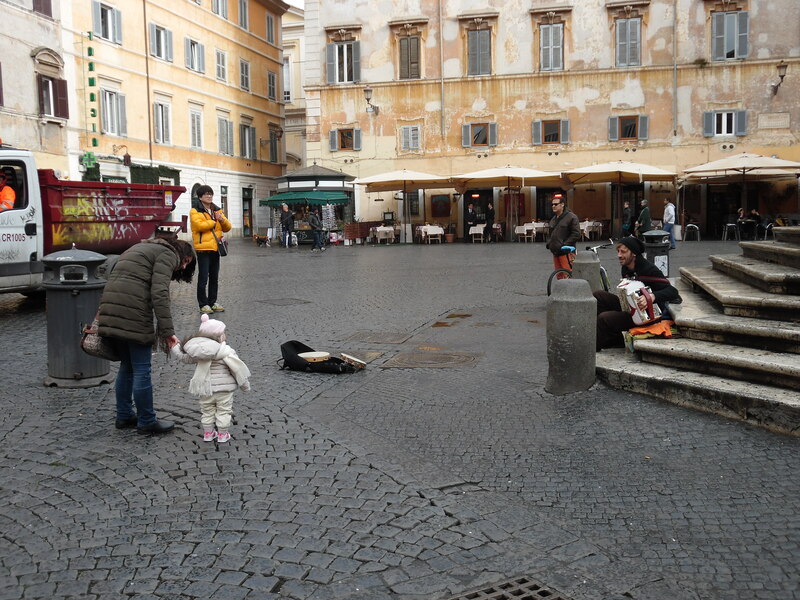 The area around this Piazza is also very busy during the evening with many restaurants, vendors, and people walking around. 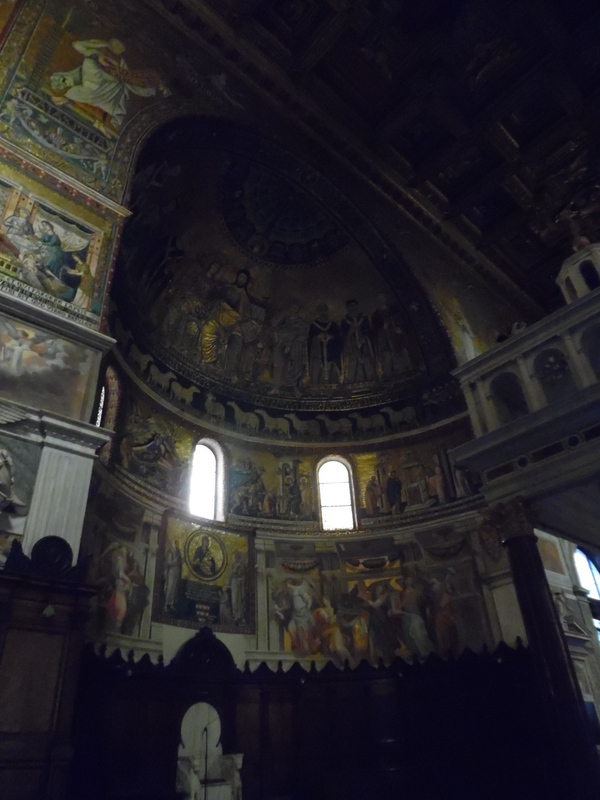 The exterior of the church itself looks very different in the evening than it does in the day due to the lighting on the exterior frescoes. 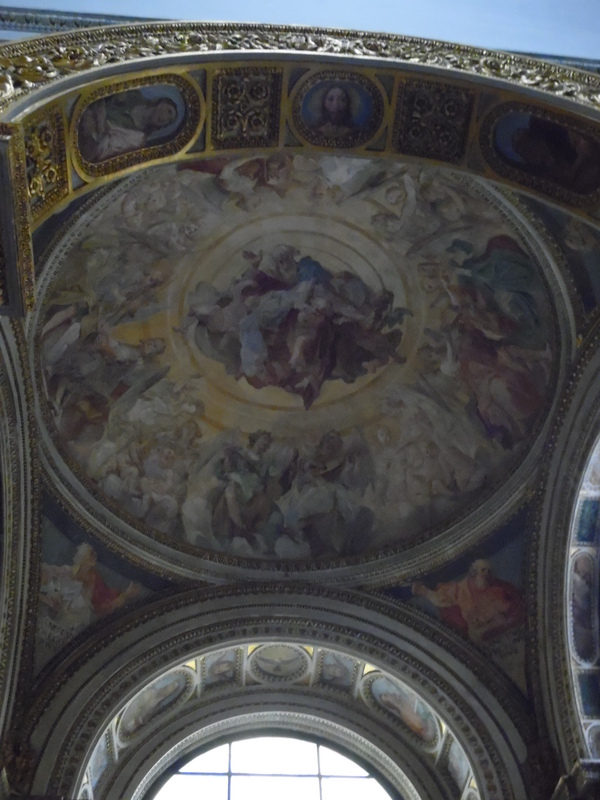 The beauty of this church doesn’t stop on the outside, the inside is amazingly decorated, and each chapel is worth a close look. 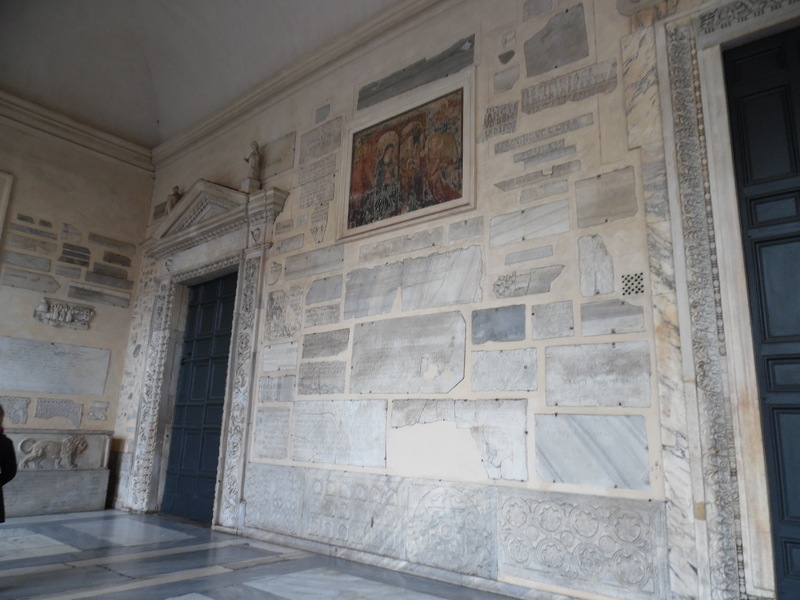 Even the portico of the church is fascinating with its combination masonry of re-utilized marble blocks. 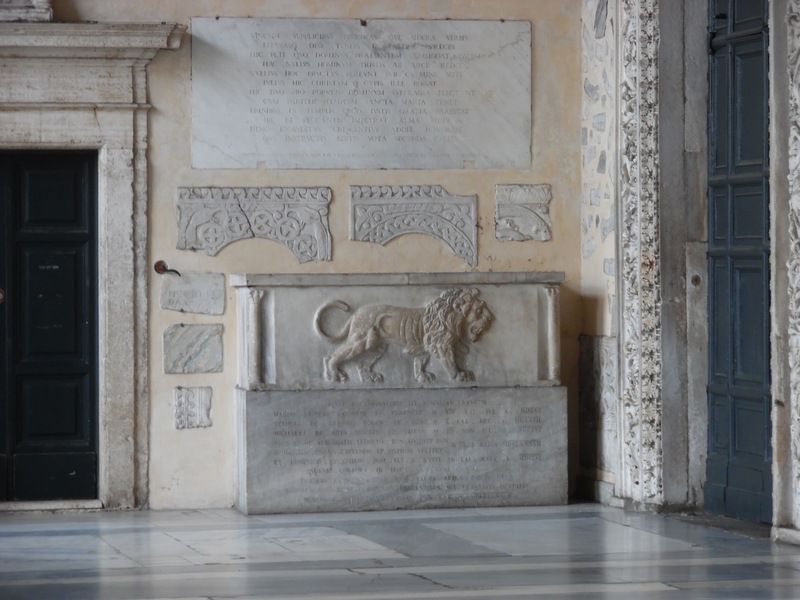 I particularly like those second two with the lion and the bird. 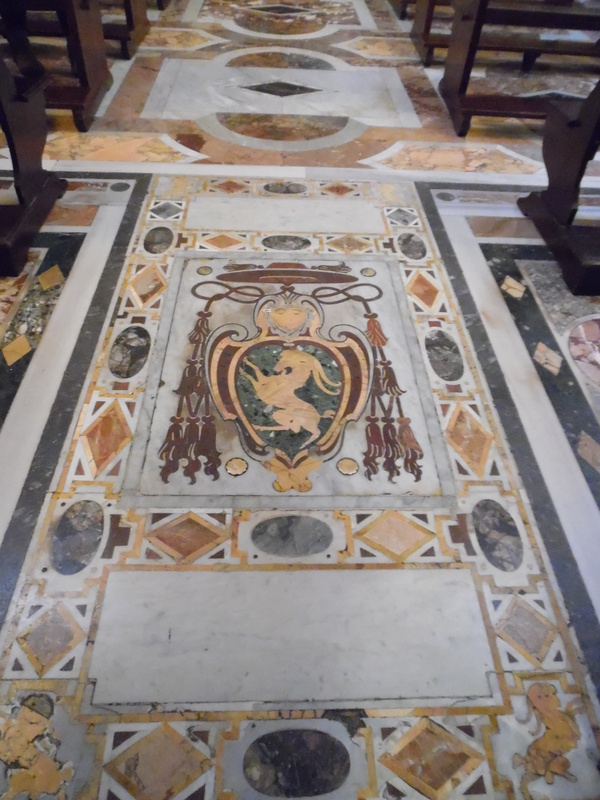 It’s interesting to see small details like this so seemingly out of place in a basilica. 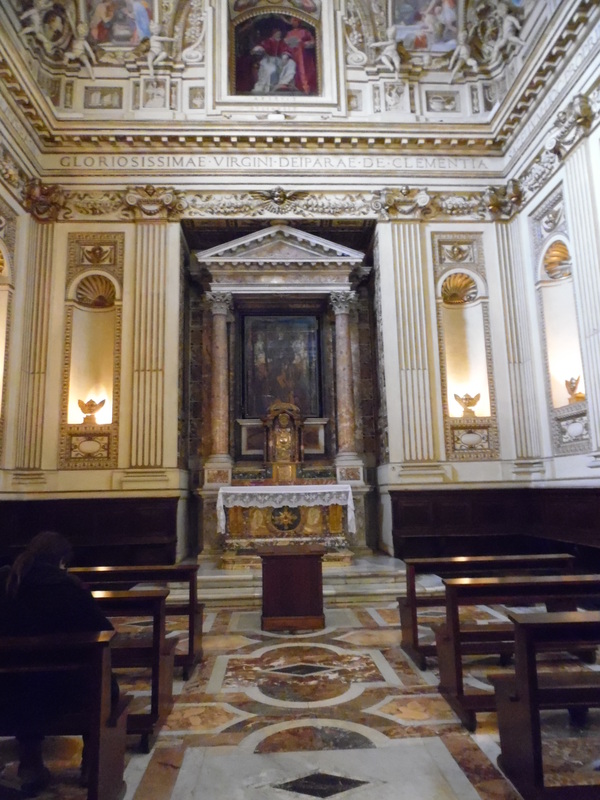 The inside of the church is stunningly beautiful. 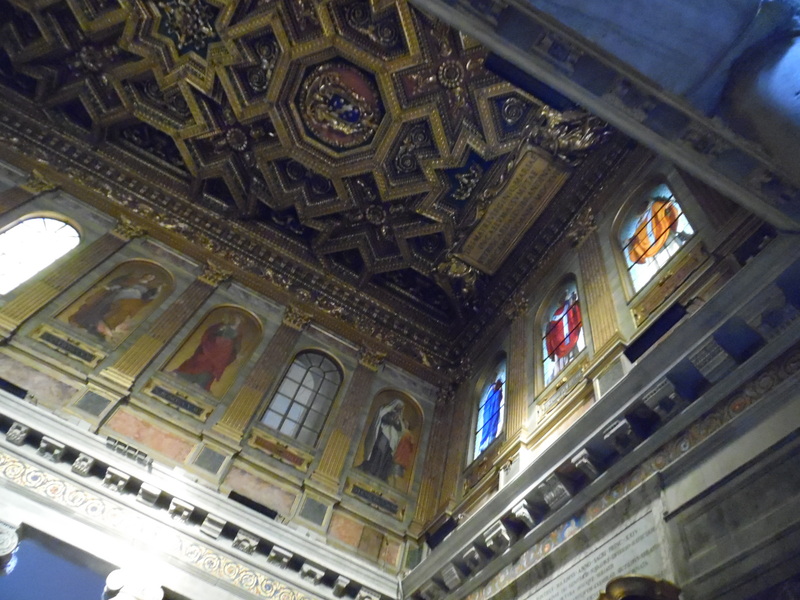 The ceiling in the main section and the stained glass windows are very nice. 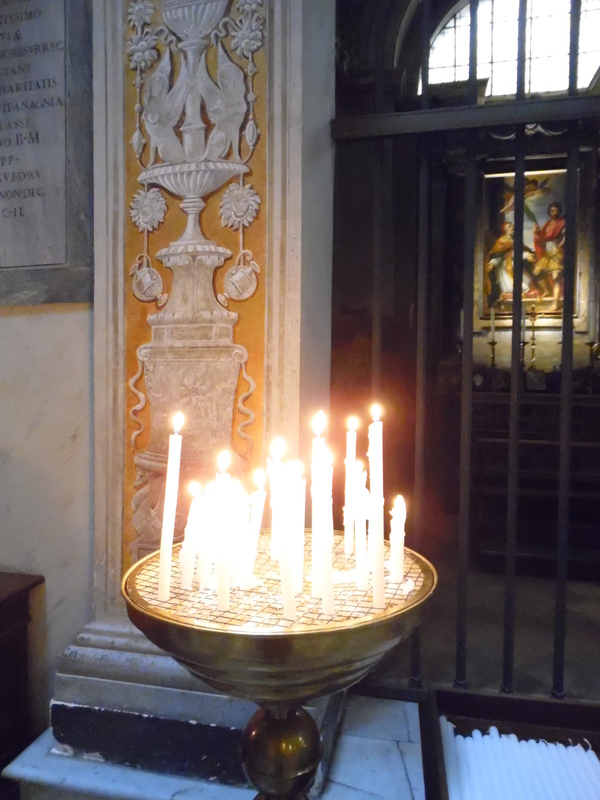 By this point I’ve stopped into many churches, and most of them seem to use tealights for their offerings, which does seem practical. 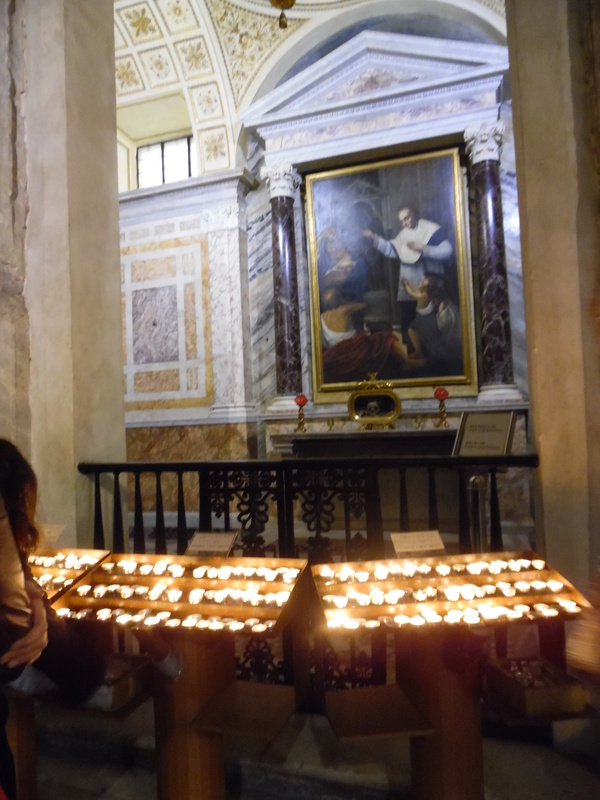 However I thought that their pillar candle offerings dish was very cool here. 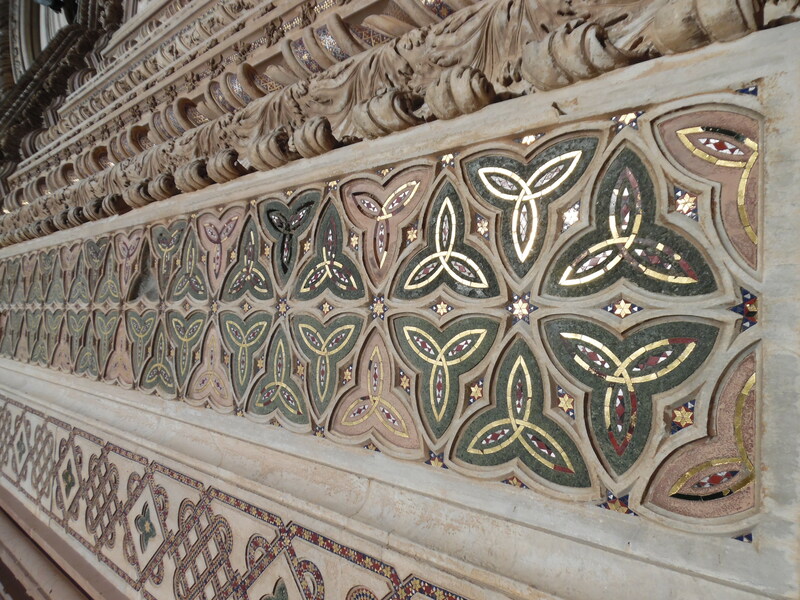 There are a lot of side chapels as well and each have very different styles of decoration, but all are very beautiful. t This is my favorite one. 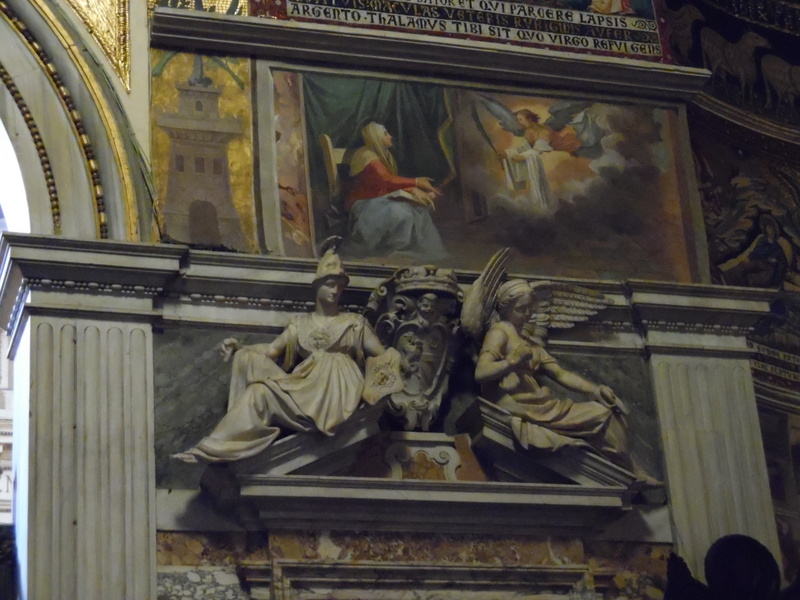 This reminds me of the Tomb of Pope Julius II by Michelangelo. 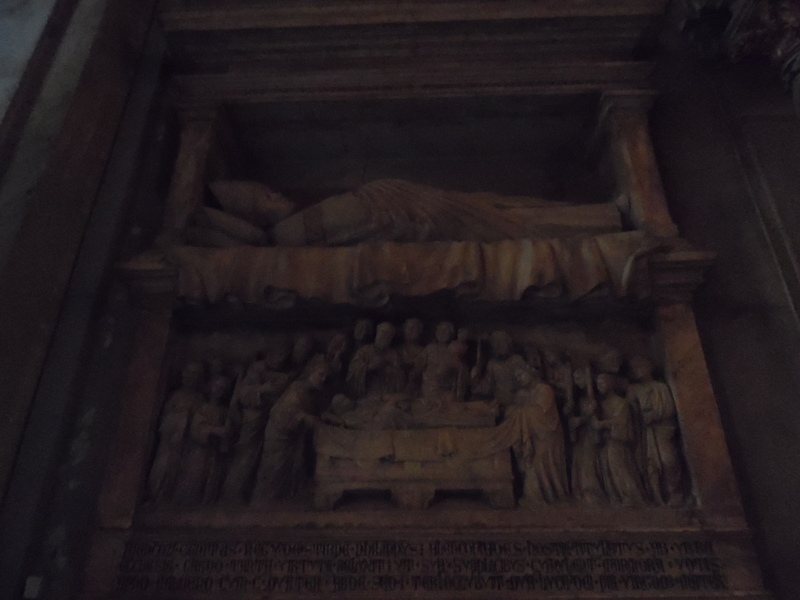 There were also some sarcophagi that were very nice to look at, very well-done relief sculpture. 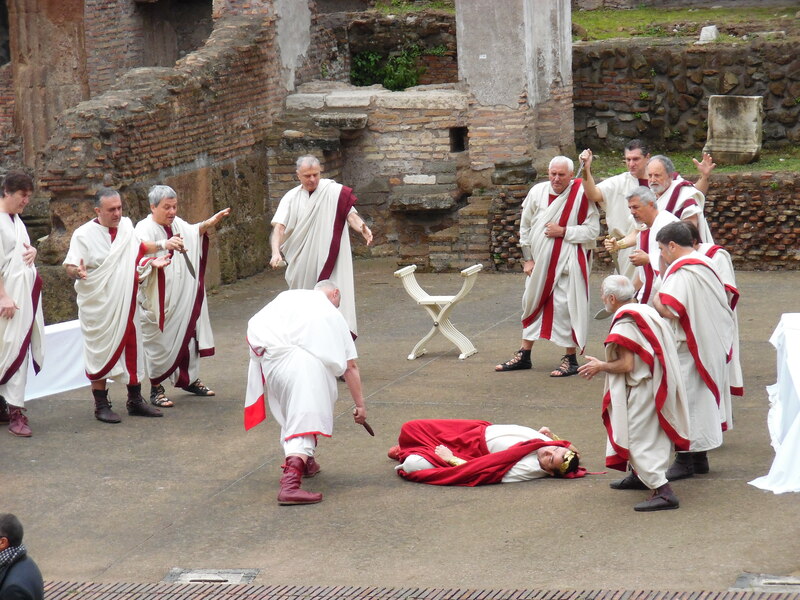 The tradition of portraying the deceased sleeping on the top of the coffin goes back to ancient Etruscan times in Italy. 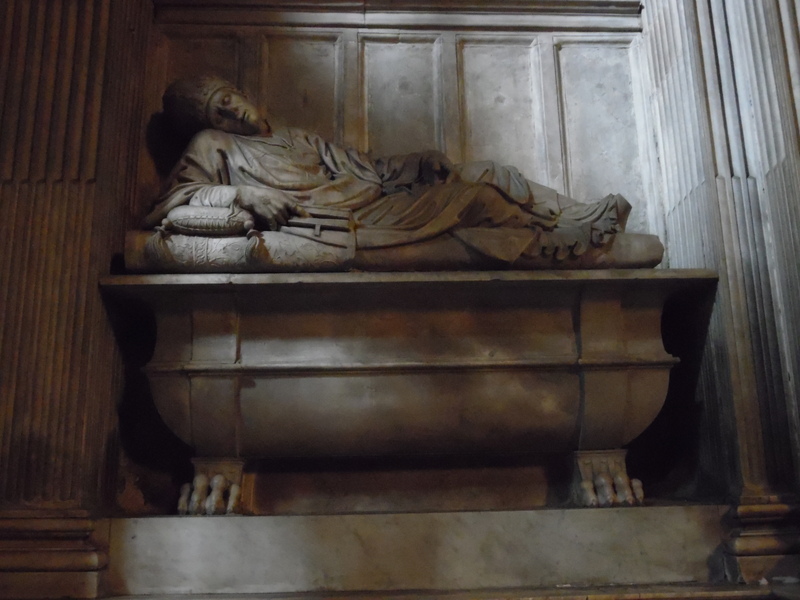 Archaeologists refer to these sarcophagi as ‘sleepers’. 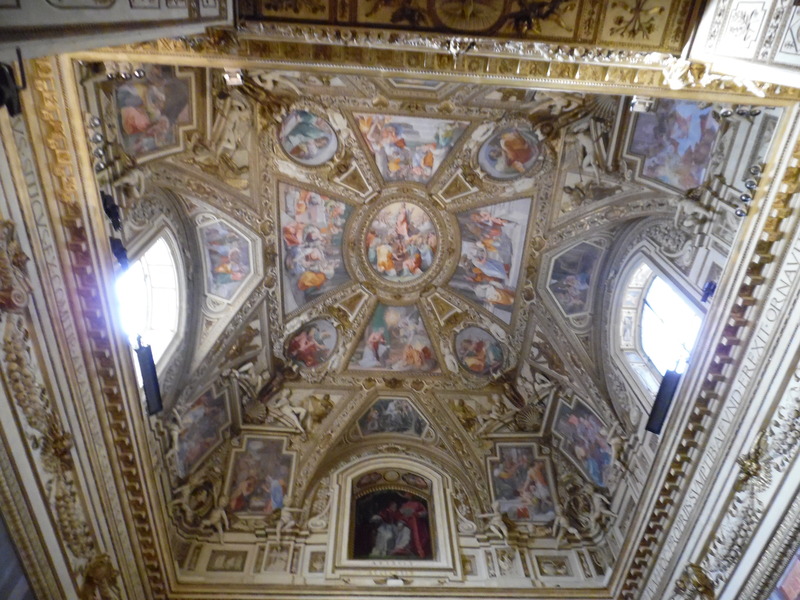 Overall this is a very worthwhile church to visit. 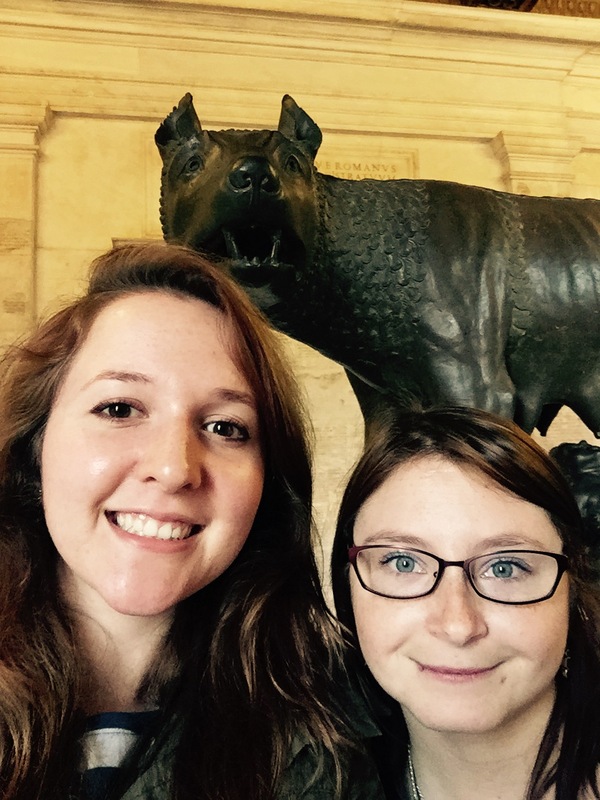 If you find yourself in Rome, do yourself a favor and visit it. They have music playing in the background all the time, and it’s a very memorable experience.